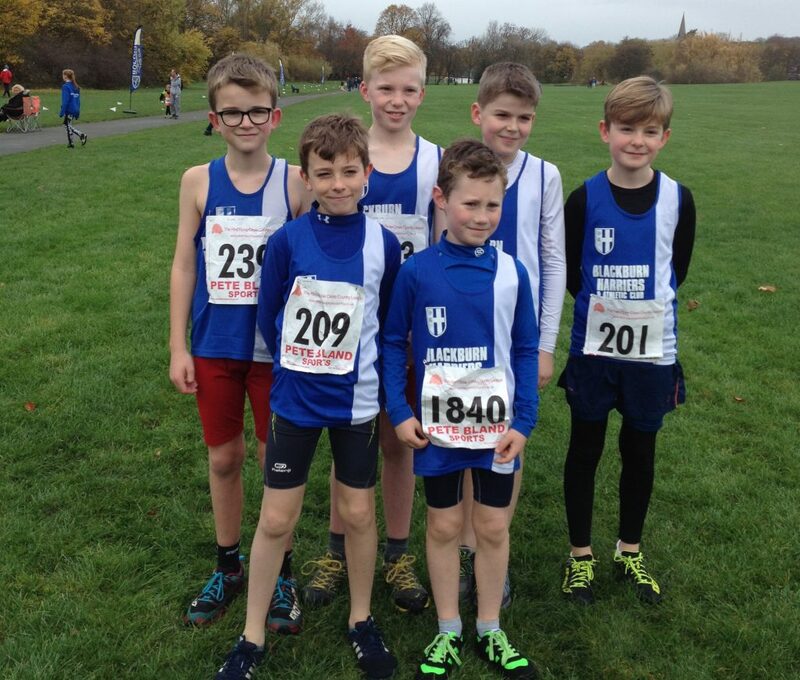 It turned out to be a very good weekend for the Harriers. 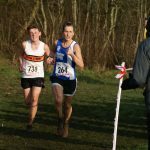 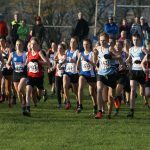 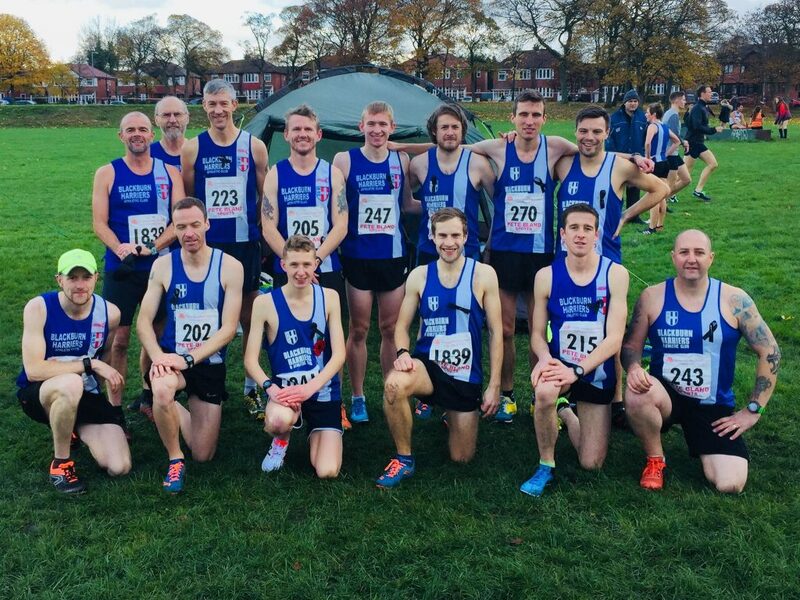 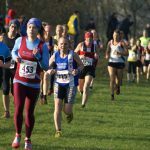 After winning the Senior Men and Senior Women’s Red Rose cross country race at Marl Pits, the Senior Men were out at the Preston 10, a local race with a long history and featuring a field in excess of 500 runners. 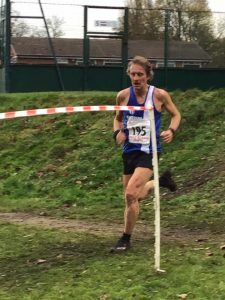 Tim Raynes who has been in excellent form, winning the Red Rose cross country races at Leigh and Bolton, was making his debut over this distance and was up against some very good runners at the front end of the race. 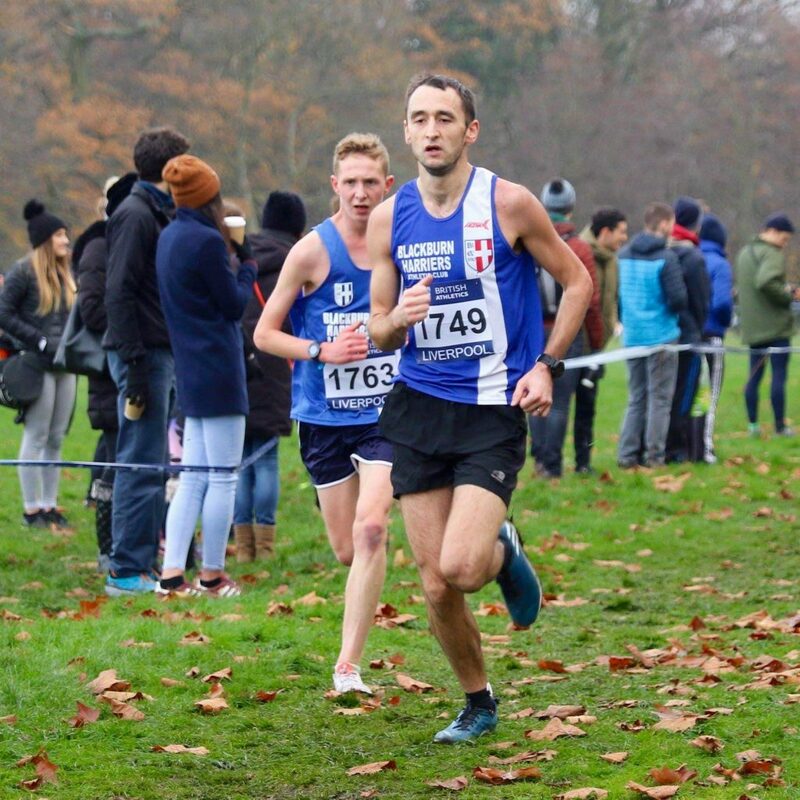 That excellent form came to fruition again which saw him win the Race in a time of 52.10 – 26 seconds in front of 2nd placed Rob Danson (52.37) and Adam Sciacca (52.43) and Chris Livesey (52.44) fighting it out for 3rd spot. 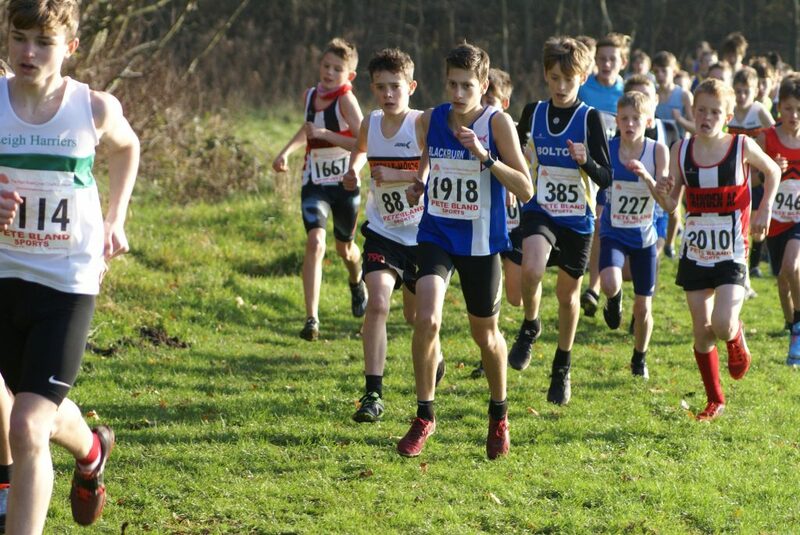 Three places in the top ten by the Harriers meant that the Club won the Team prize too. 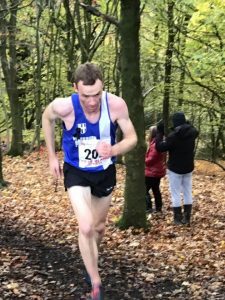 Karl Billington is going from strength to strength, evidenced by his 6th place today in a time of 54.23 and over a distance, which like Tim, he was making his debut in. 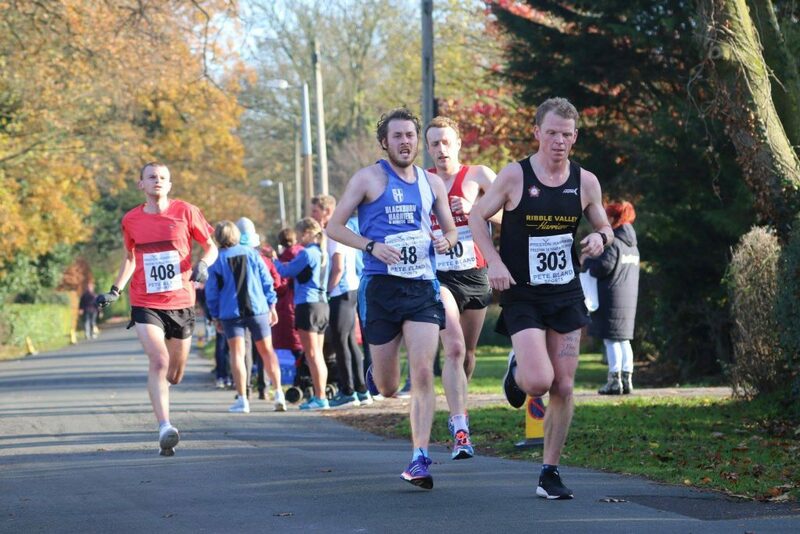 Post-race Karl spoke to the Club commenting “Really happy with my debut 10miler, found the last mile tough. 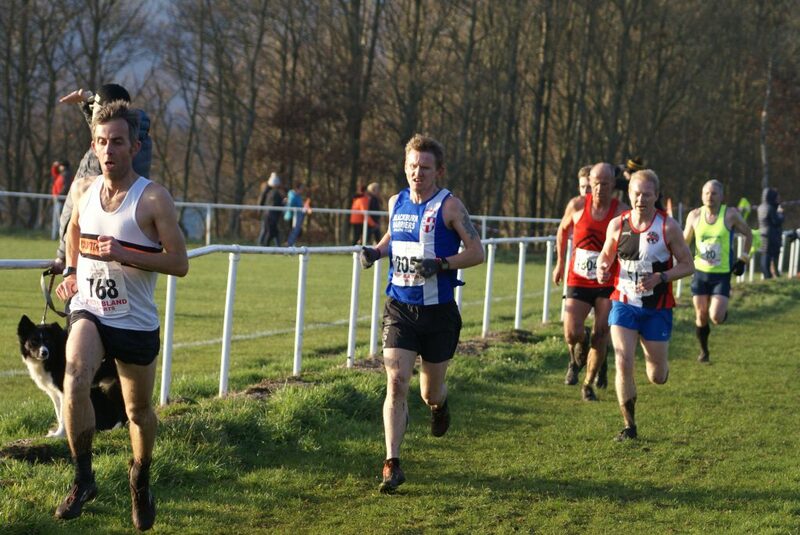 Lots of work to be done before Ribble Valley and the barca half”. 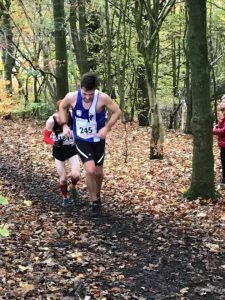 Next home for the Harriers was Chris Davies who was part of the Senior Men’s winning team the previous day at Rossendale. 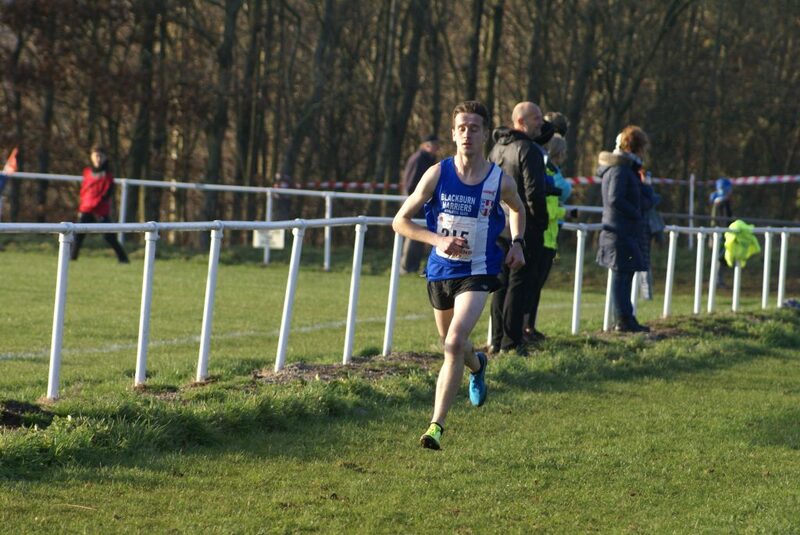 Chris ran just eight seconds outside of his personal best, posting a time of 56.14 in 10th place. 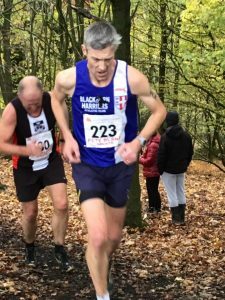 Chris also won the V40 category too and afterwards told the Club about his weekend saying that he was “Really pleased with this weekends performance’s. 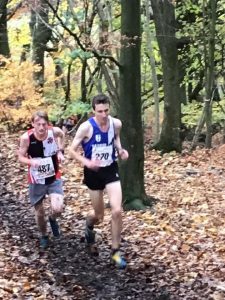 Marl Pitts XC is always a tough race and I came away from that in good condition to have a good stab at the Preston 10. 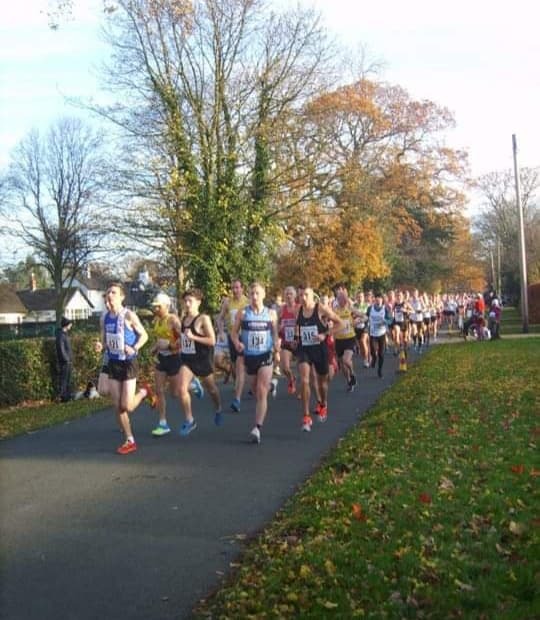 I started off the race feeling great and came through the 5 mile marker in good shape and on for a PB but unfortunately I got to 7 1/2 and knew I was starting to slow down. 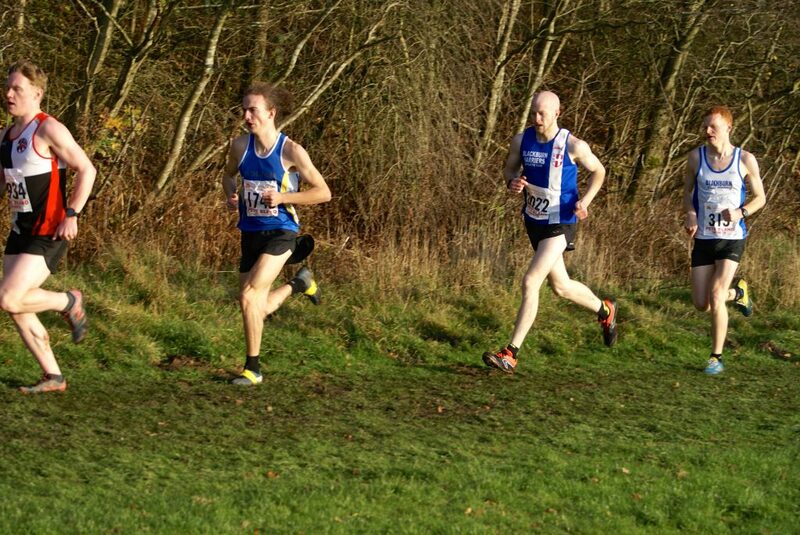 I got on to the duel carriageway and just had to dig it out with 2 miles to go and just missed out on a PB. 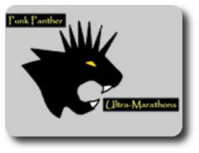 Not to concerned though. 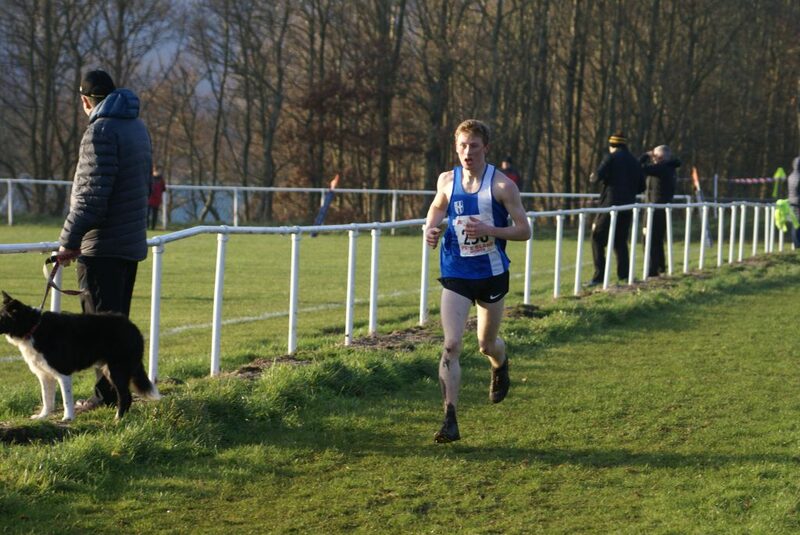 It was a strong run after the XC and has only made me more confident in getting a PB at the Ribble Valley 10K. 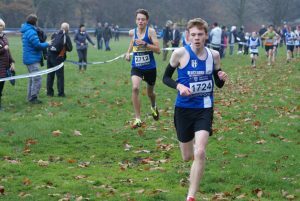 I’ve had a great year and it’s helped running with a great Senior group which has also been improving all year. 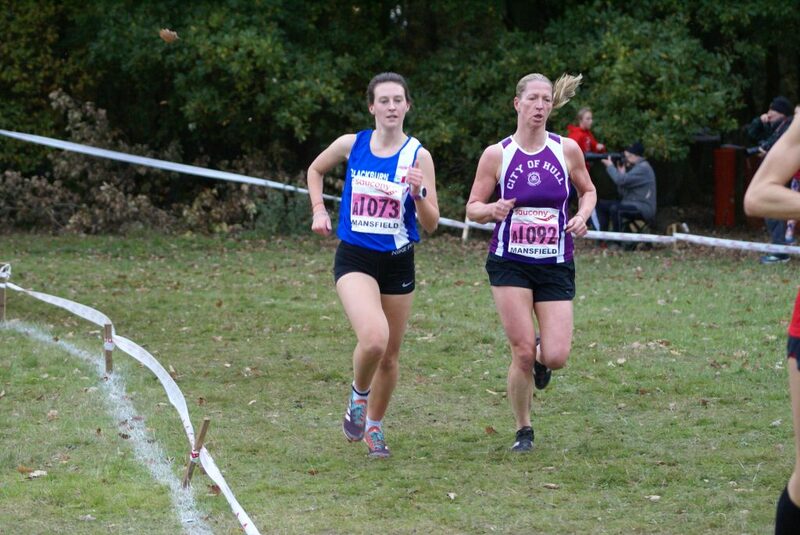 Onwards and upwards”. 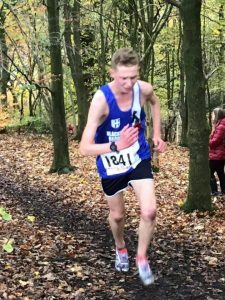 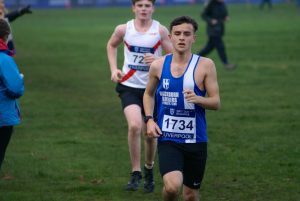 In 15th place came Calum James Holmes with a new PB of 57.40 which was a three minute improvement on his previous personal best over the distance and he, like Chris, ran in the successful Senior Men’s cross country team the day before. 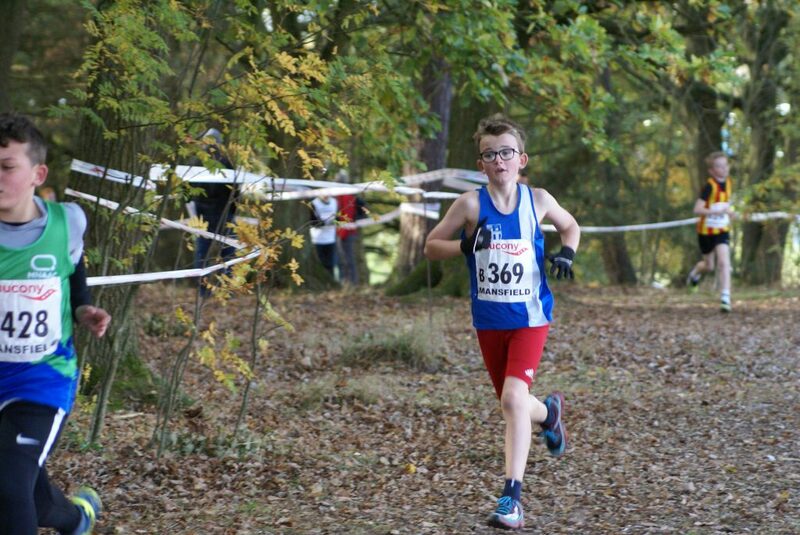 Calum commented about his weekend saying “I raced today even though I did Cross Country at Marl Pits. 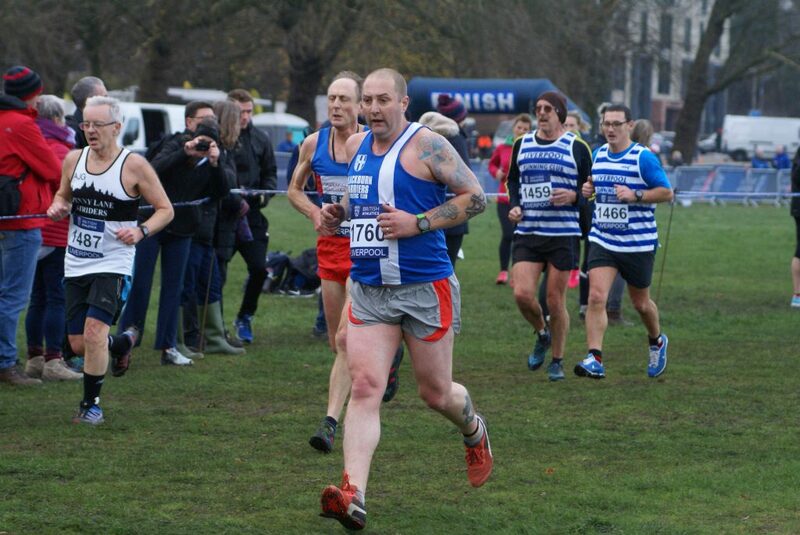 I felt okay doing it and was confident I was going to pb this morning at Preston. 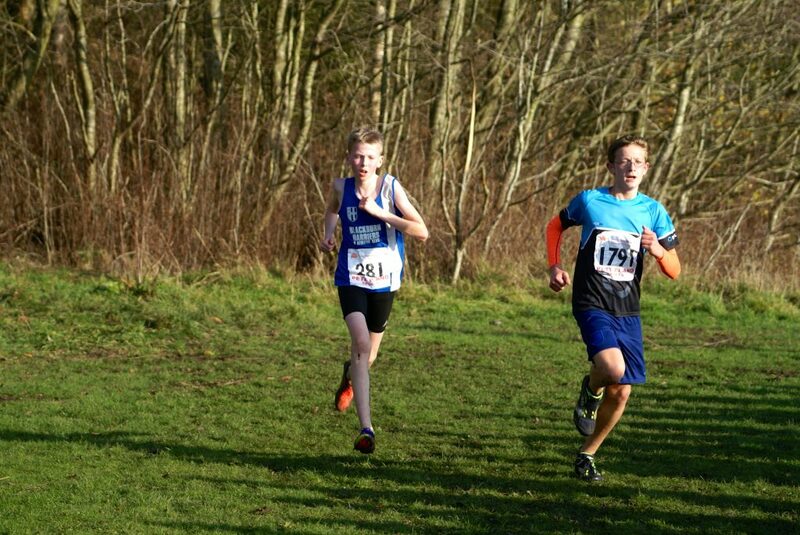 I finished 15th in 57 minutes which is five minutes better than last year, and also Blackburn won the Team race. 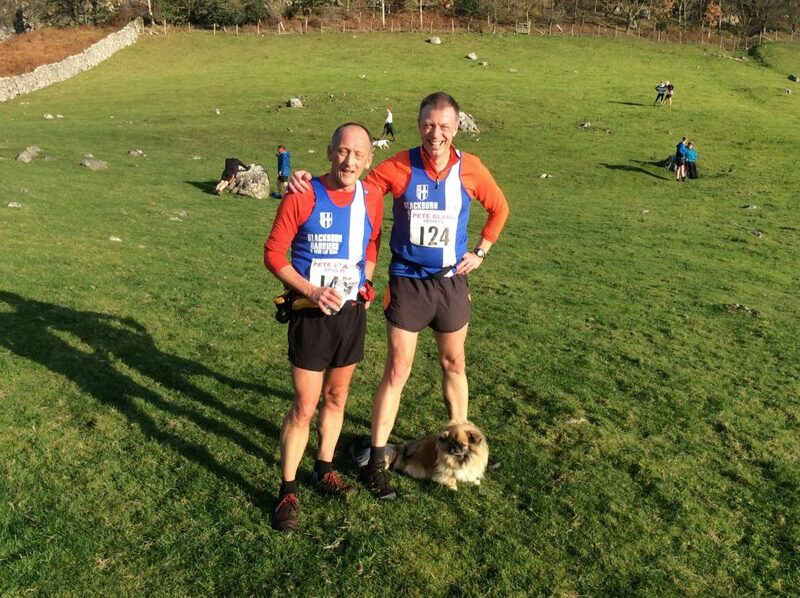 I would also like to congratulate my team mates Chris, Tim and Karl who finished top ten”. 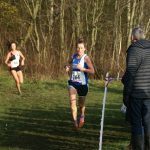 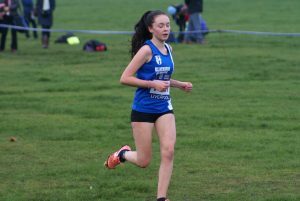 Even though Victoria Mousley has been unwell, she still ran the race after entering a while ago coming home in 249th (79.00). 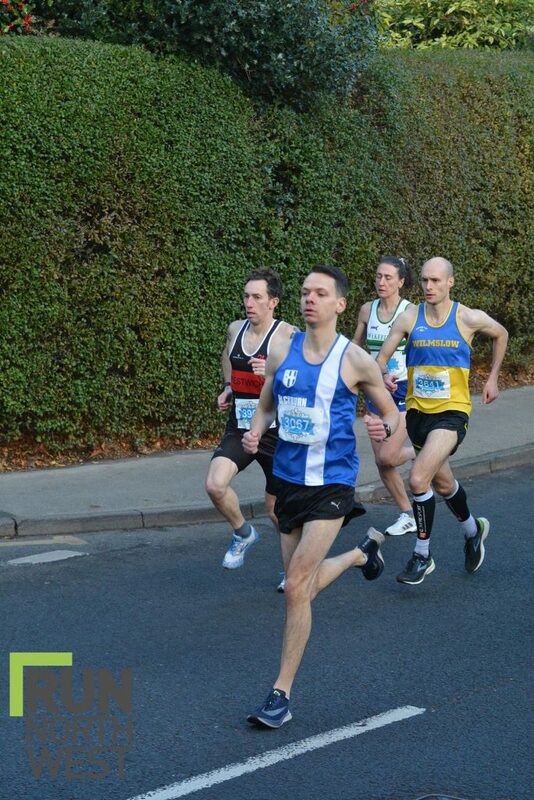 V55 David Morris also ran, placing 446th in a time of 97.29. 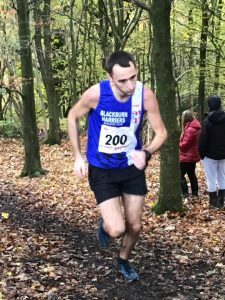 Four Blackburn Harriers were on the line for this race Helen Leigh – Danny Teare – John Horrocks – Gary Pearse – and it was who John led the way home as he finished in 54th position clocking 2hr 52 which was a pretty good performance given that John had been plagued with an injury. 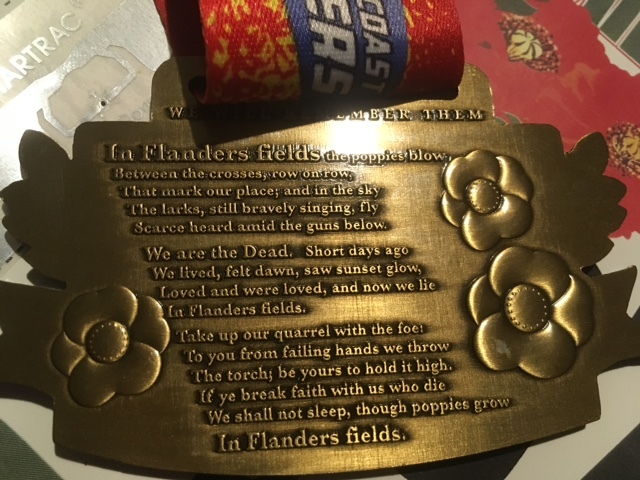 After it was all over, John spoke to the Club about the day and his race saying “Tour of Pendle. 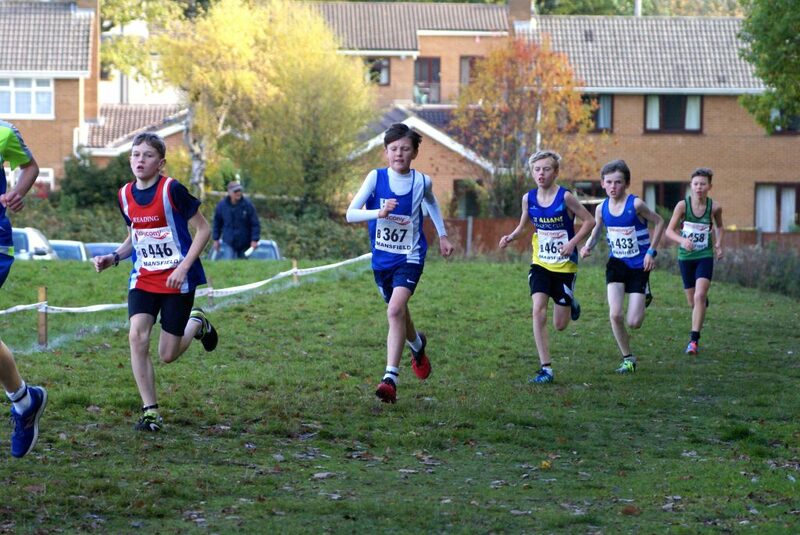 What a race. 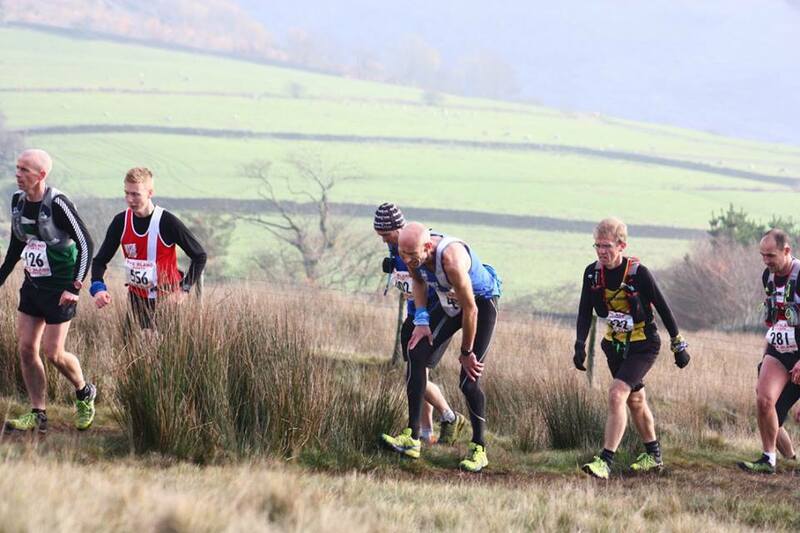 Good day for it with a coolish wind on the tops. 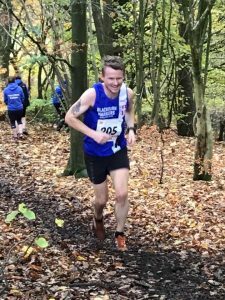 Coming into it I’d been struggling with an slight injury so not been able to do the training that I wanted to so I aimed to be under 3 hours. 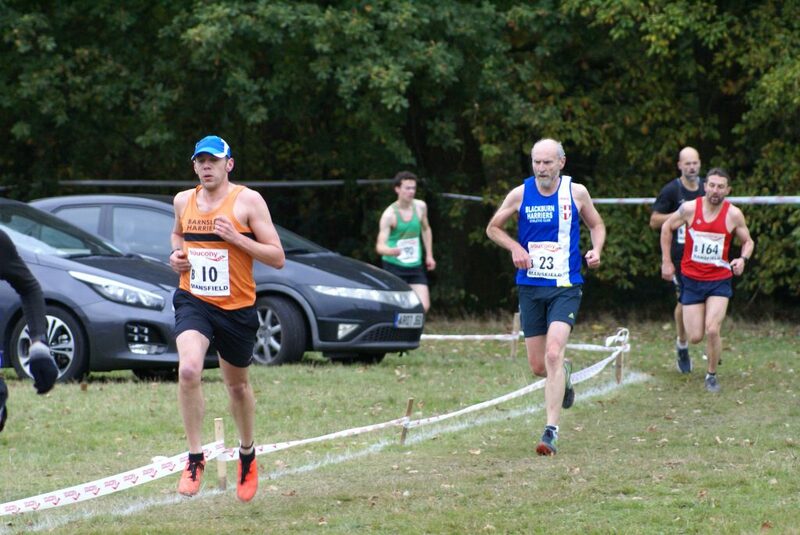 Stood on the start line I said to myself set off steady and try to pace it, that went in the bin as soon as go was shouted. 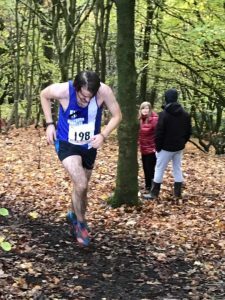 Managed a good pace to the bottom of geronimo where I was happy to see my dad for some good old jelly babies and a Capri sun. 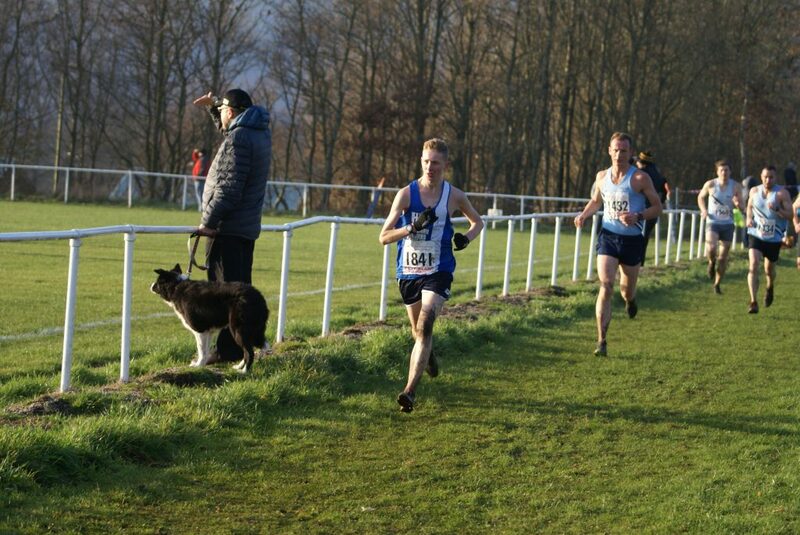 Worked a treat and kept me going to the top of mearley climb. 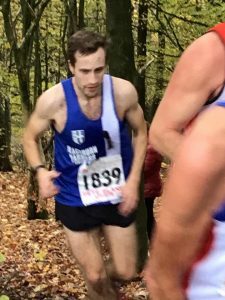 At this point I was placing early 30’s and felt good to push for top 30, then the dreaded big end climb came and I blew up. 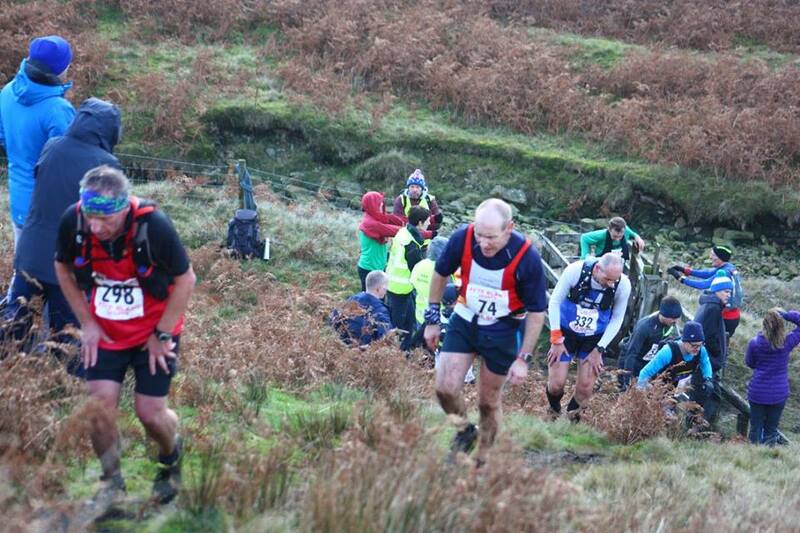 From the trig point back down to the finish at barley was the longest 2.5 miles I’d ever run. 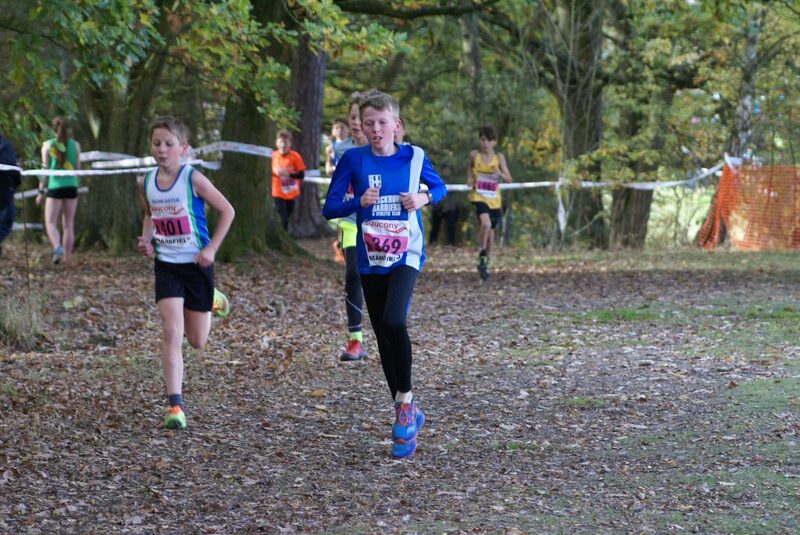 Ended up 54th in a time of 2 hours 52. 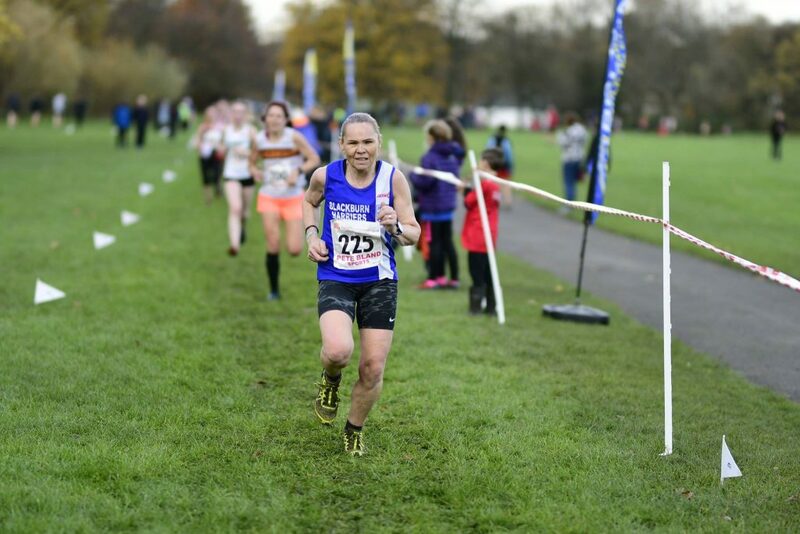 Veg soup never tasted so good! 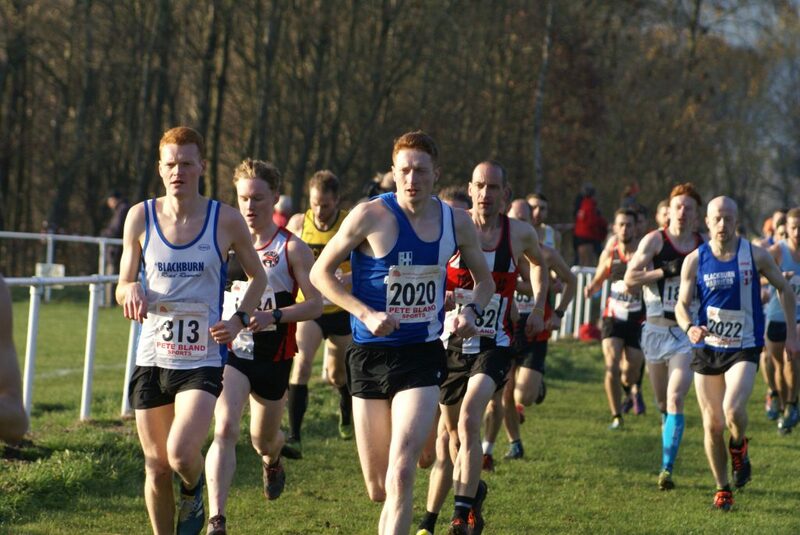 Definitely be back next year. 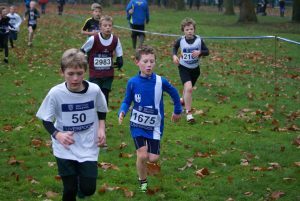 Well done to all the harriers who ran and thanks to the marshals as always”. 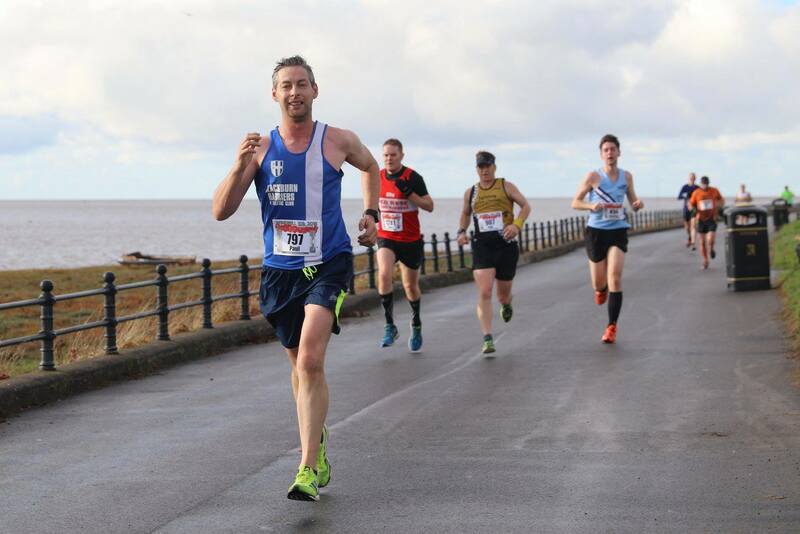 Gary Pearse having competed in the Short Circuit 33 mile race just a couple of weeks ago was the next athlete in for the Harriers. 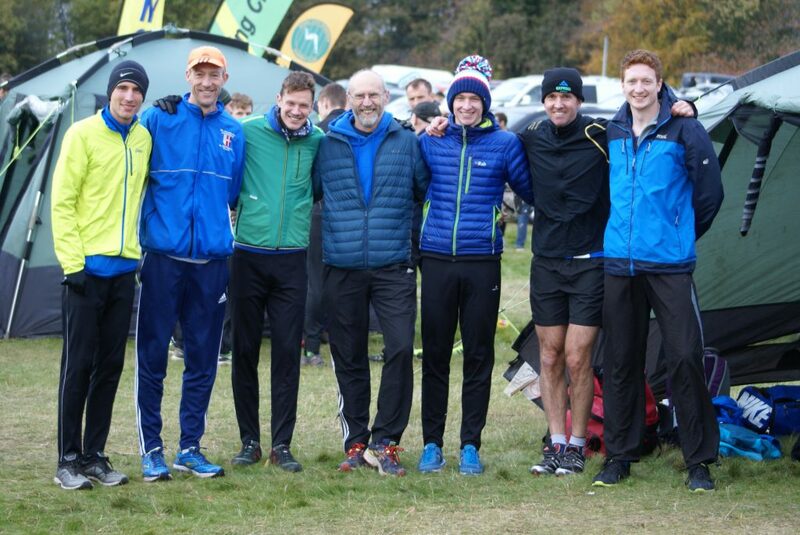 Speaking after the race Gary said that it was a “Good day conditions wise, but the usual Pendle cloud was hanging on the tops and it was windier than expected from the calm conditions in Barley. 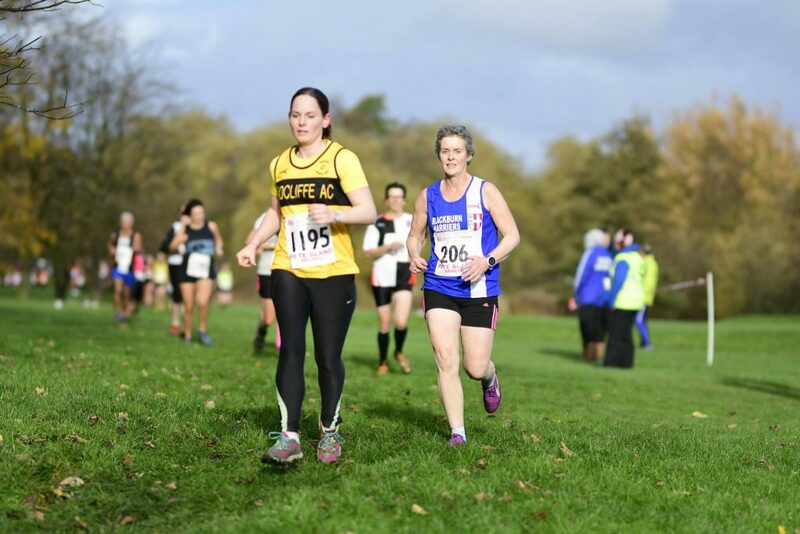 I risked running with a long recent outing in my legs which proved my undoing, but as I was also raising money for Rosemere Cancer Foundation I was definitely completing the race. 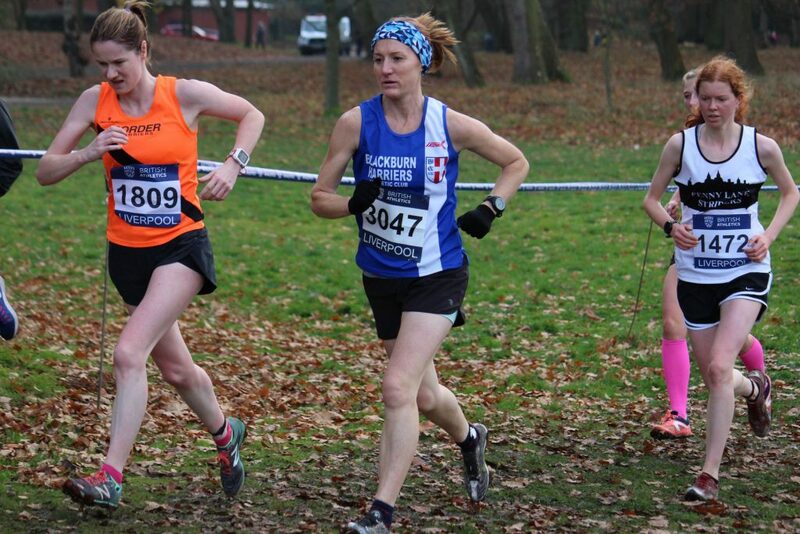 Great to see Helen Leigh back racing and John Horrocks in good form. 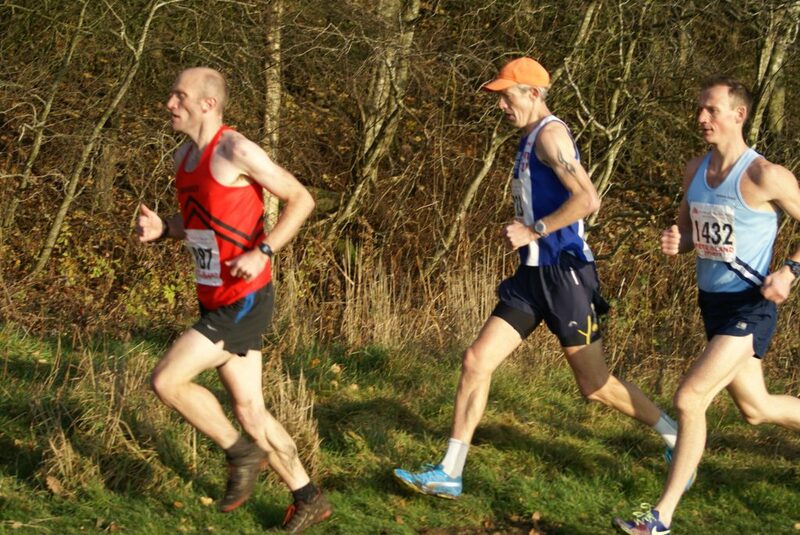 The usual healthy pace on the road out was checked by the first climb to the Trig. 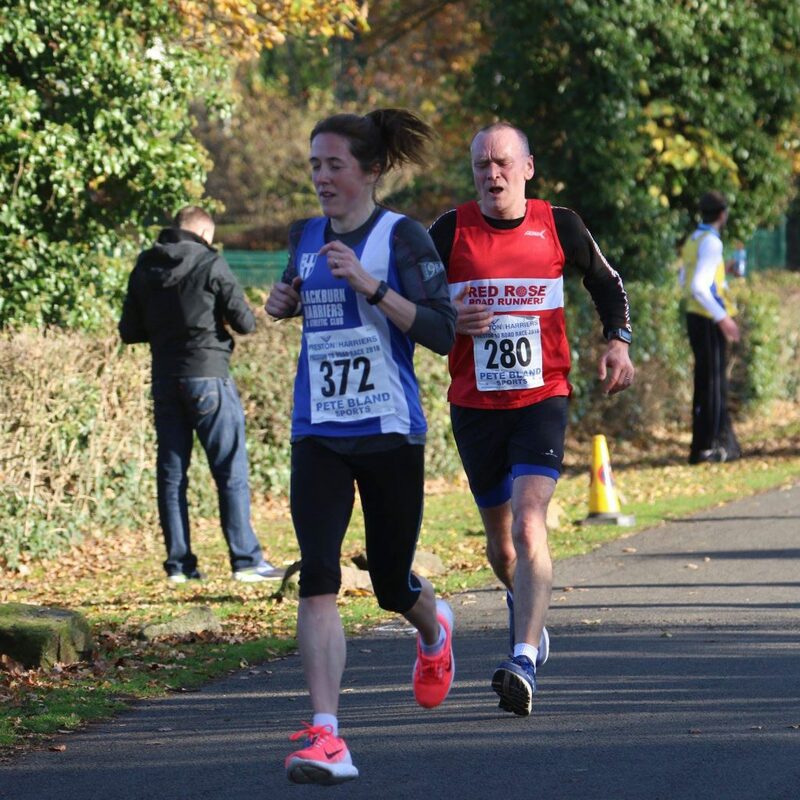 It was lovely to run for a short while with Helen before she showed me a clean pair of heels. 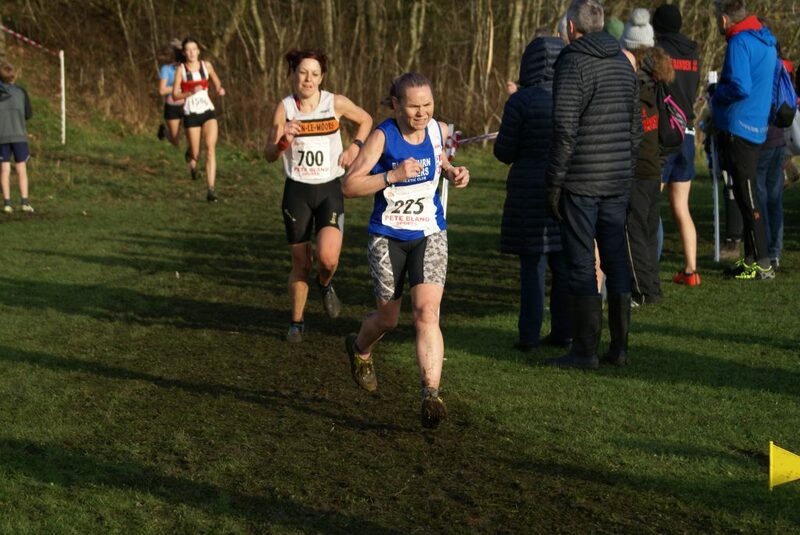 Wheels well and truly came off on the second to last big climb/decent and I was on the edge of cramping entirely before I hit the road and stretched out again on the run in. 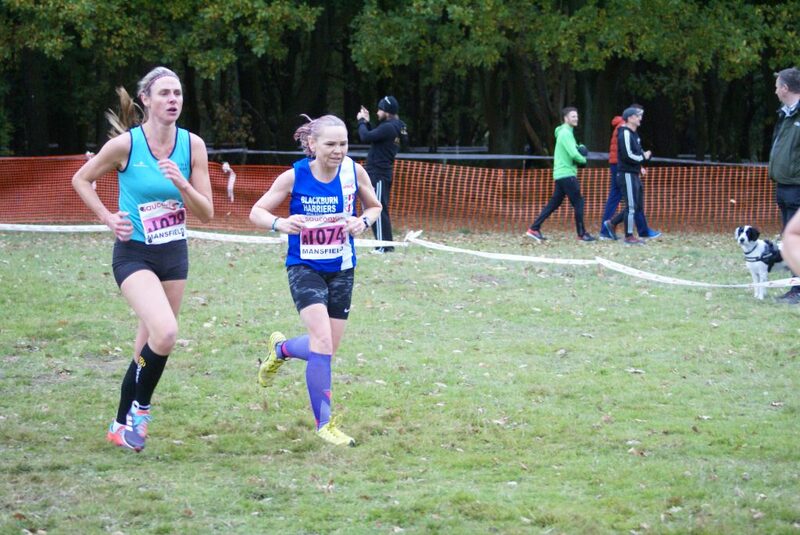 It was brilliant to see Helen and Jean at the finish. 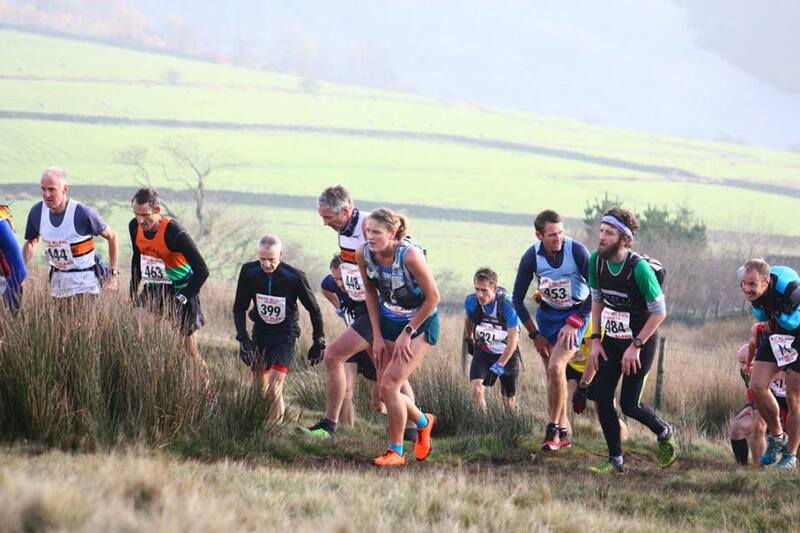 Great to be out again in this iconic fell race and especially well done to Helen and John. 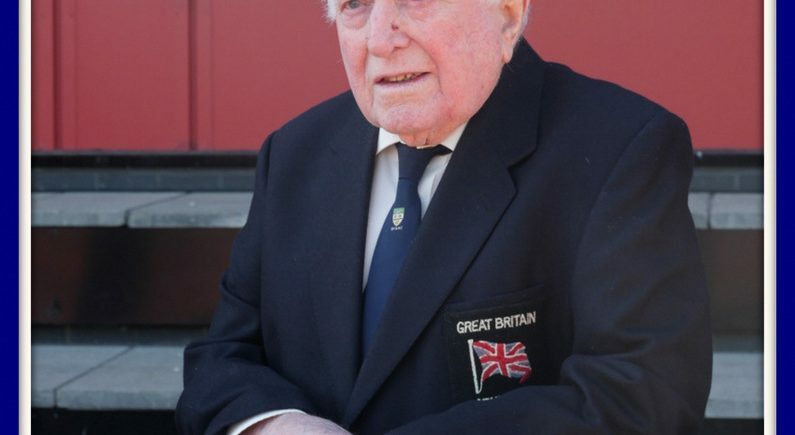 I would also like to add to the tributes to George Kirby, a time for reflection and celebration of a remarkable person”. 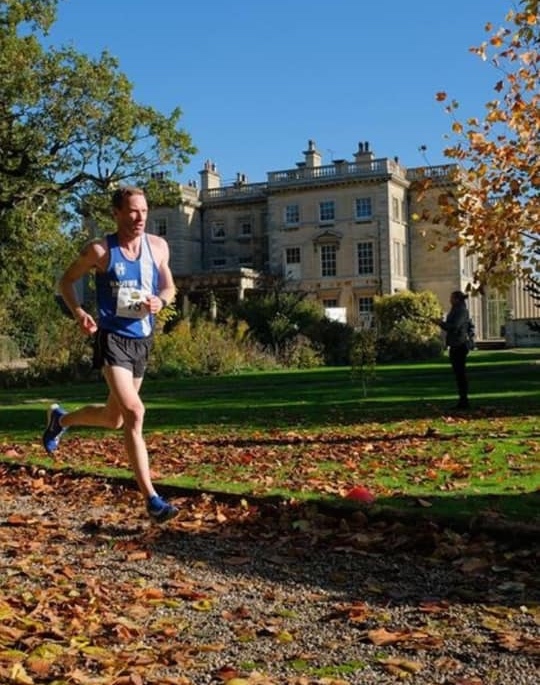 Danny Teare unfortunately had to drop out of the race after looking forward to it, but said post-race that it had been “Fantastic conditions for the race, with over 500 pre-registered. 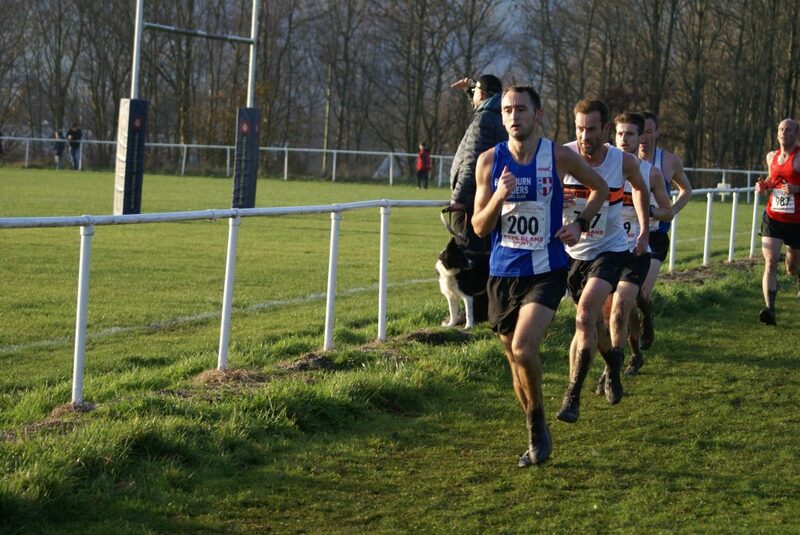 Several Harriers on the list and many familiar faces lined up. 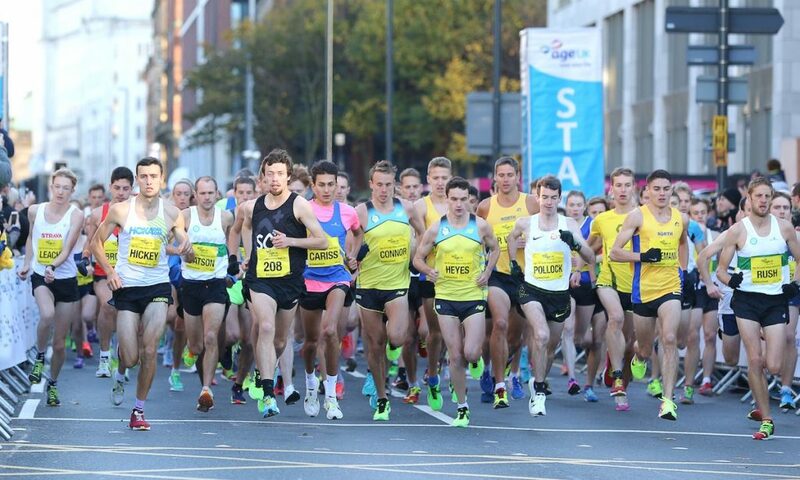 I was raring to go and felt well prepared. 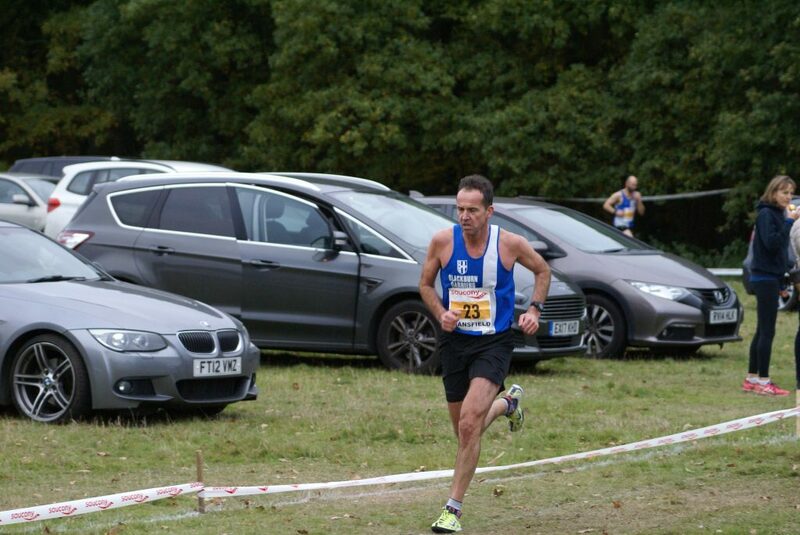 Training had gone well, no injuries and the pre-race fuel was all safely on board. 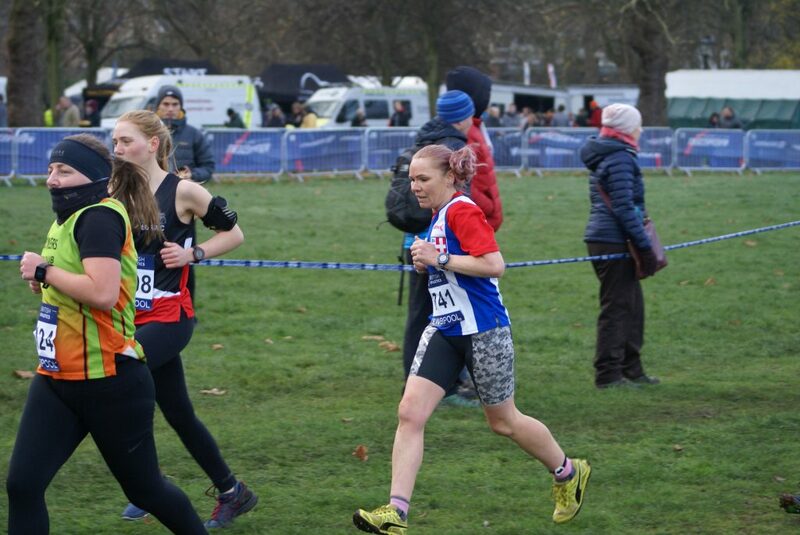 Half way round I was a few minutes ahead of last years pace and feeling like I could eek out a bit more in the second half. 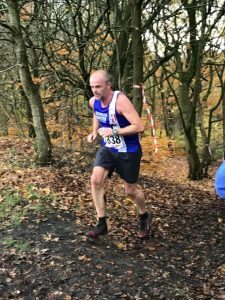 However, half way up the climb from checkpoint 5, I realised I was shedding places and couldn’t seem to get my head down and push on. 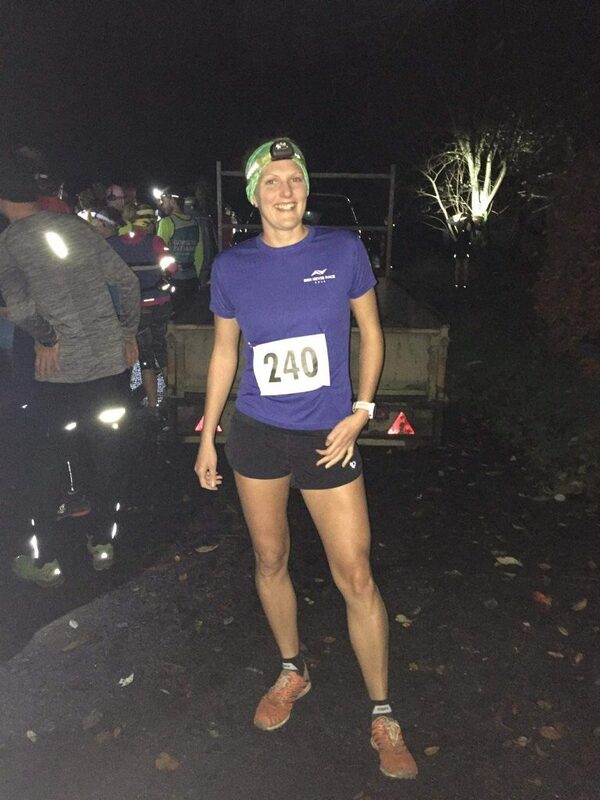 I took shelter at the top and took more fuel + drink on board, letting it settle for a new minutes before heading off again….. but after a further 500m, I just didn’t feel confident that I could take on the last 2 climbs without having to bail out. 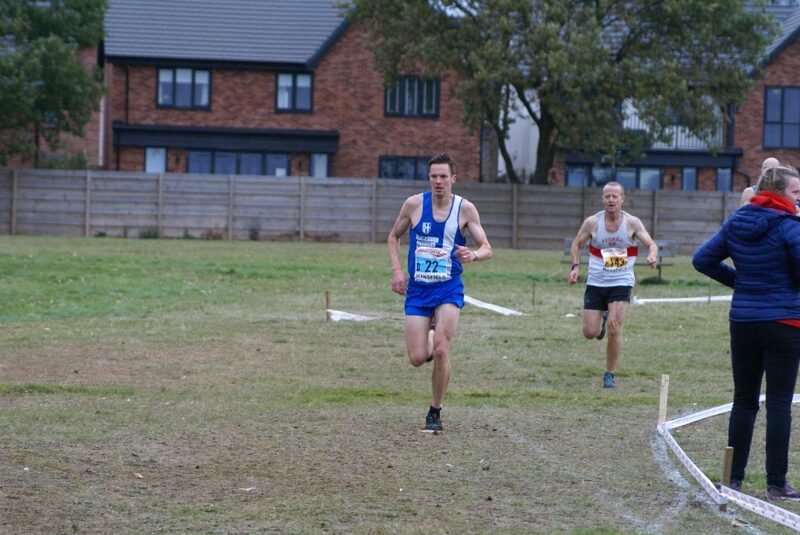 I opted for safety first, took a right hand turn and headed back to Barley under my own steam. 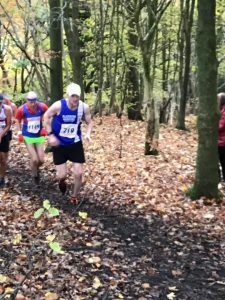 Disappointing not to finish but glad that I didn’t get into a difficult situation that would have put stress on myself and the marshals. 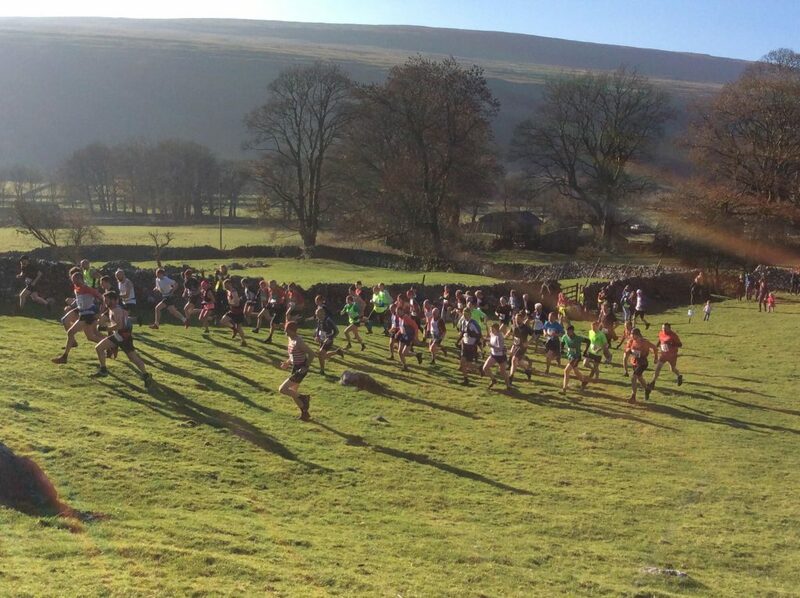 Great event as ever and very well run. 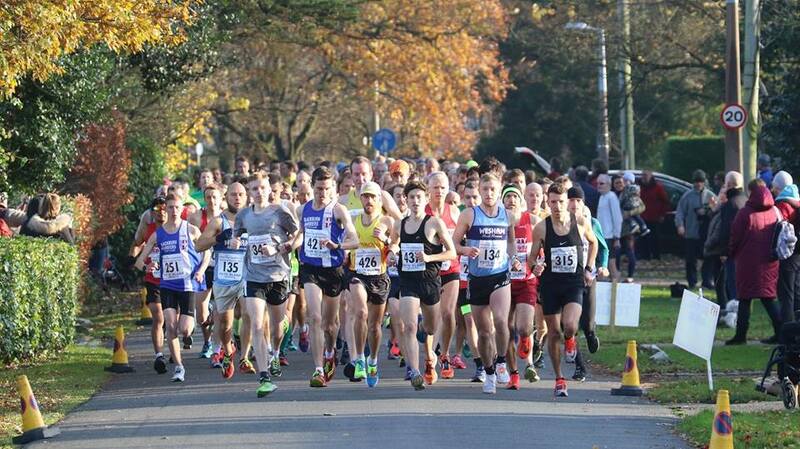 Good turnout from BBH and well done to all who took part. 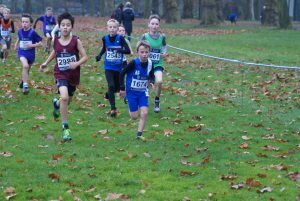 (I will look to put it right next year!!)”. 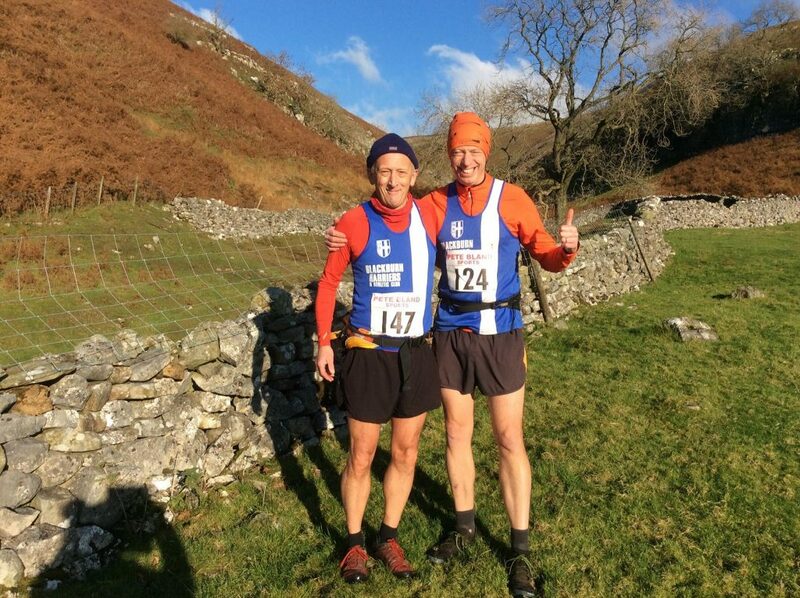 John Orrell and Ian Clarkson ran this fell race which was a new one on the calendar and won by Ted mason of Wharfedale in a time of 36.44. 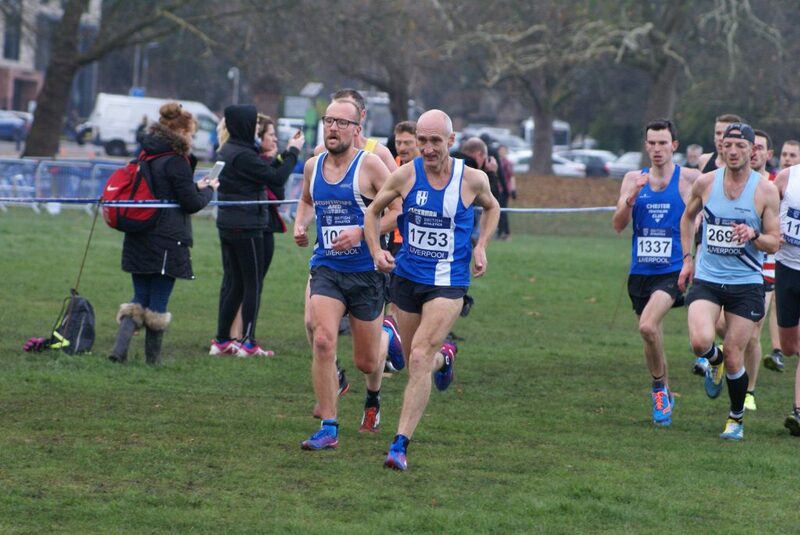 John placed 47th overall in a time of 56.22 whilst Ian came home in 51st spot clocking 57.58. 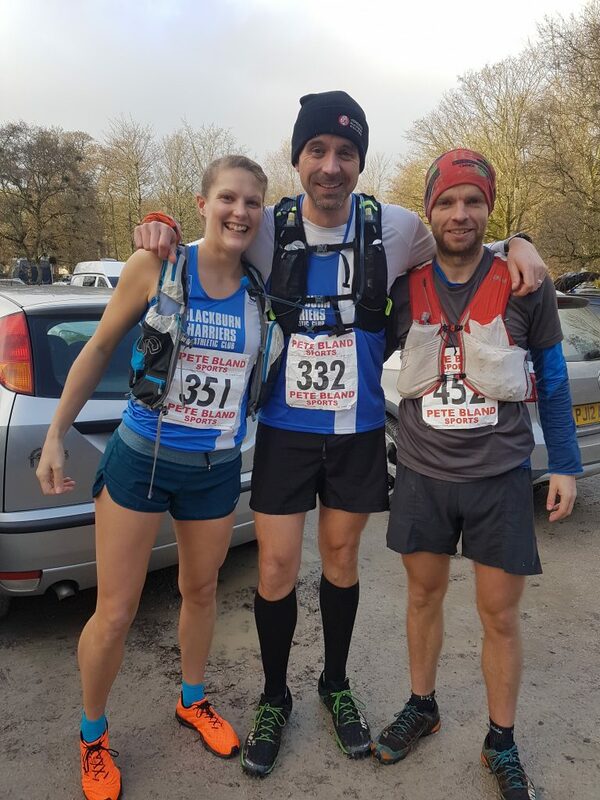 Ian was equally effusive about the race commenting “1st time this event was hosted, a BS cat race, 4.8 miles and just over 1200 feet of ascent, a flat plateau on the top, views to die for and then 1200 feet of decent!! 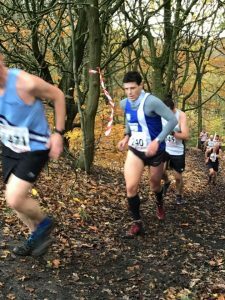 A bit of a tough one, but for a fiver entry fee, which included a bottle of beer and a chip butty, what was not to enjoy. 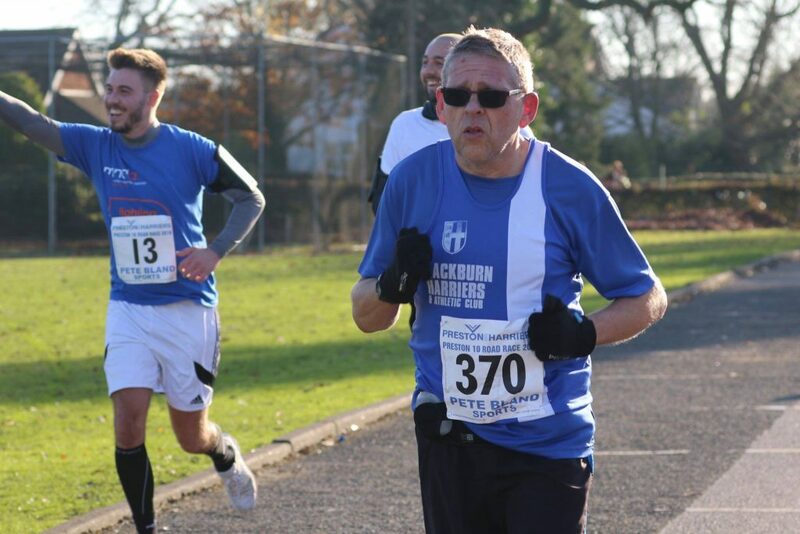 Having been out of action with a dodgy ankle for a couple of months it was great to have a go and see what happens, ankle survived and some confidence restored. 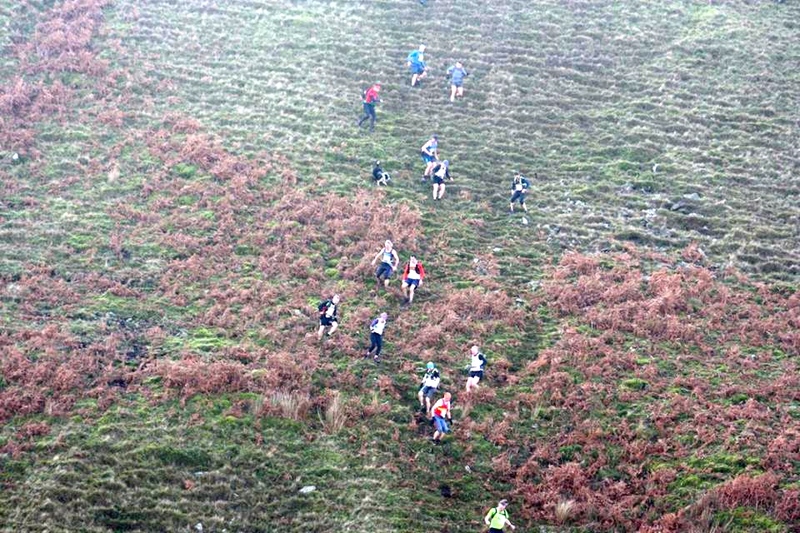 Looking forward to the David Staff Memorial Fell Race next week”. 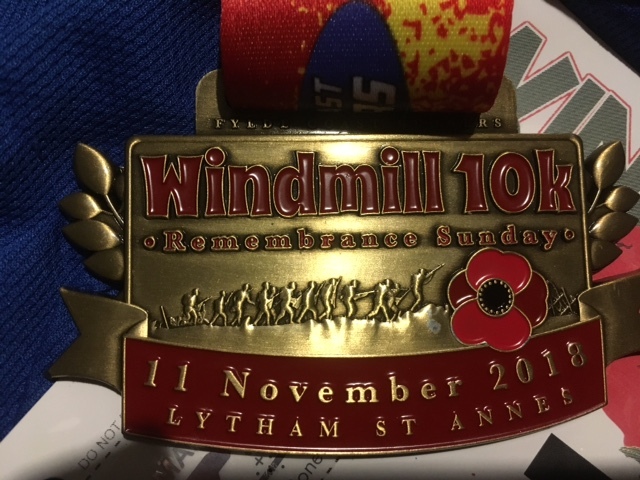 Paul Jeffries has a recent set back with a hip bursa, but felt good enough to run the Lytham Windmill 10k on Remembrance Sunday. 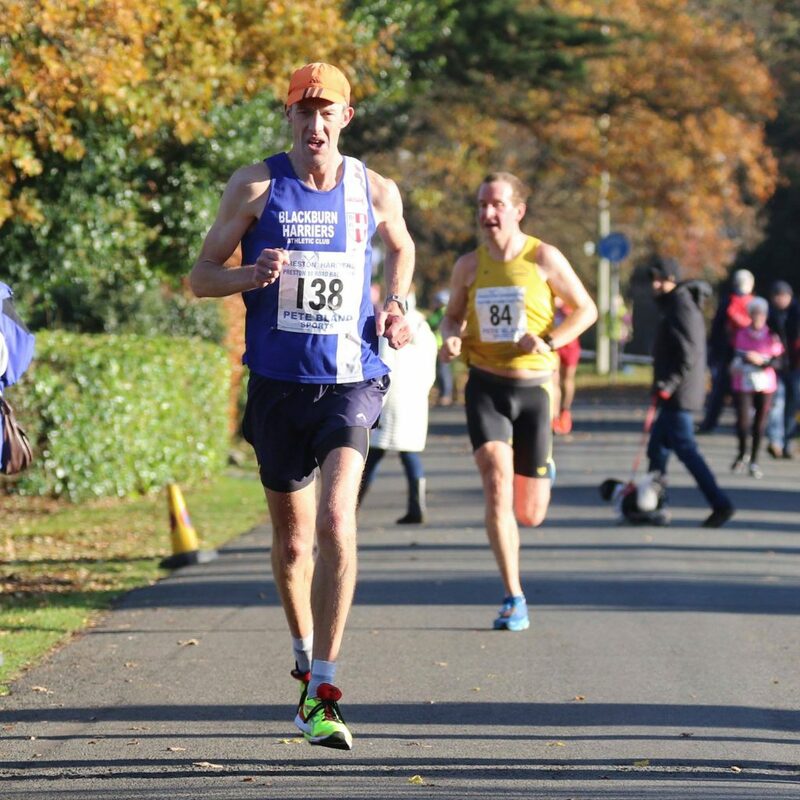 V40 Paul finished 41st place overall on the day clocking a time of 41.52.89 out of race featruing 1227 finishers. 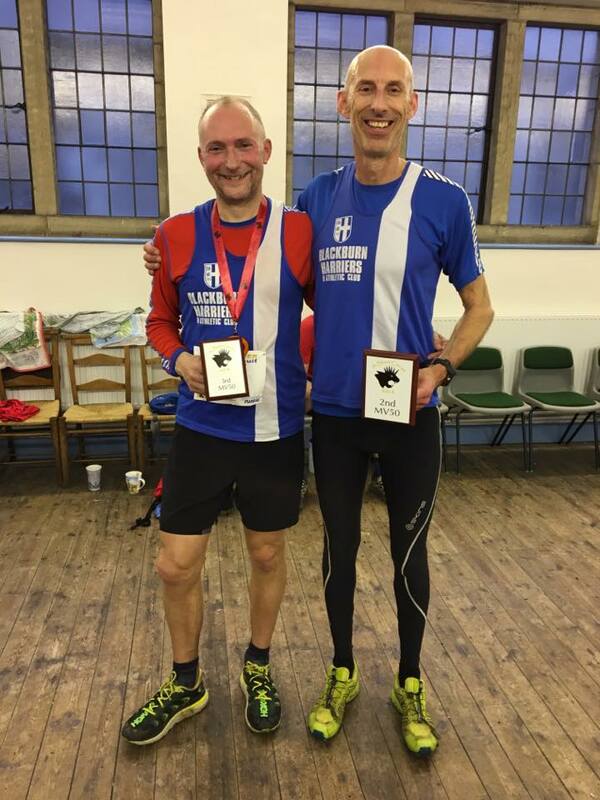 Paul told us afterwards that “it was a better run than I could of hoped for”. 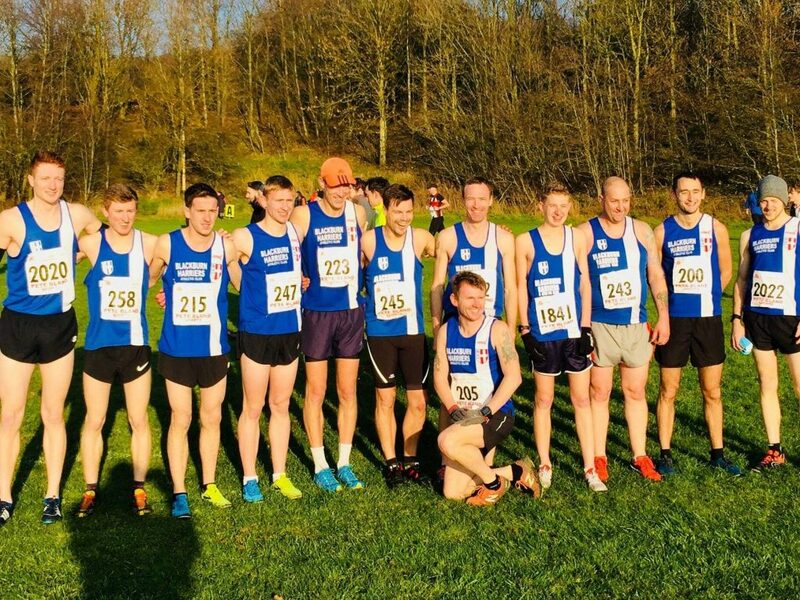 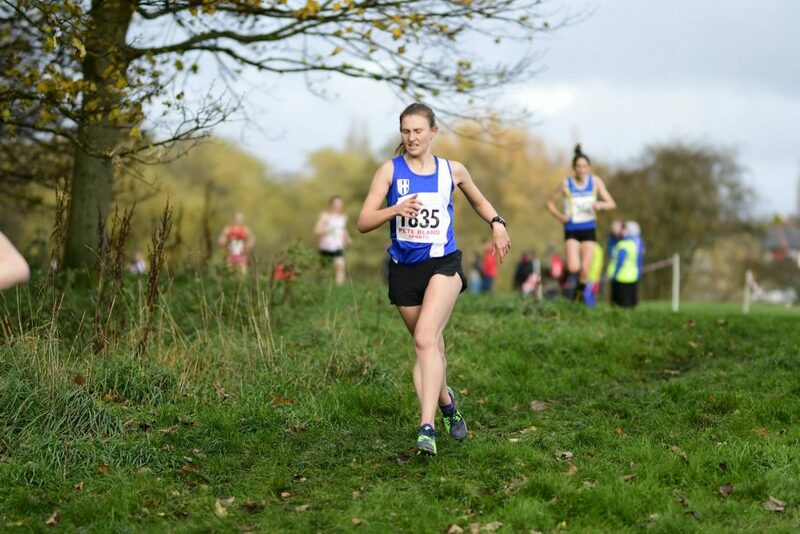 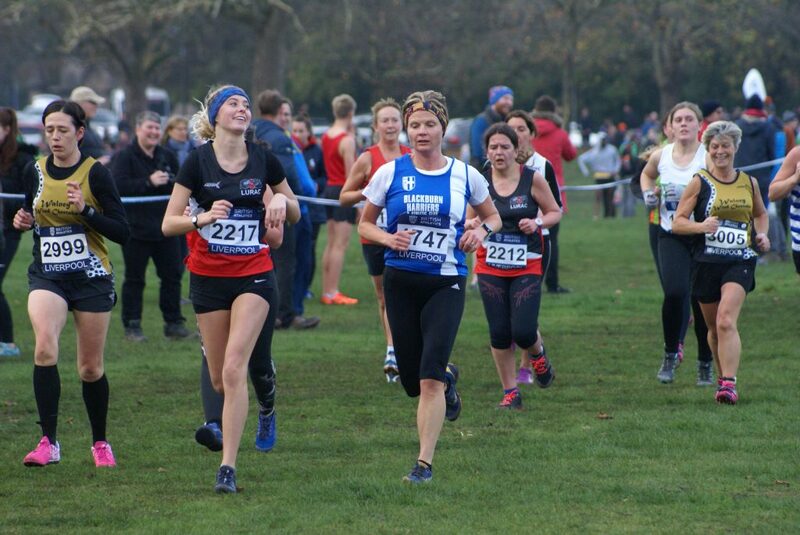 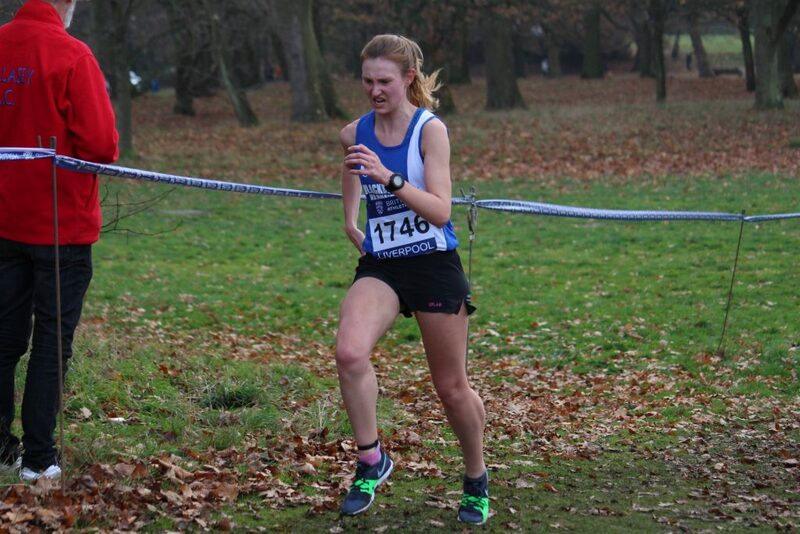 One week ago, the Harriers Senior Men’s and Senior Women’s Team both won their races at Leverhulme Park to make it two wins out of two. 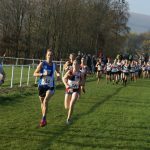 This week they made it three wins out of three to put themselves in an unassailable position going into the final fixture at Todmoreden on December 1st. 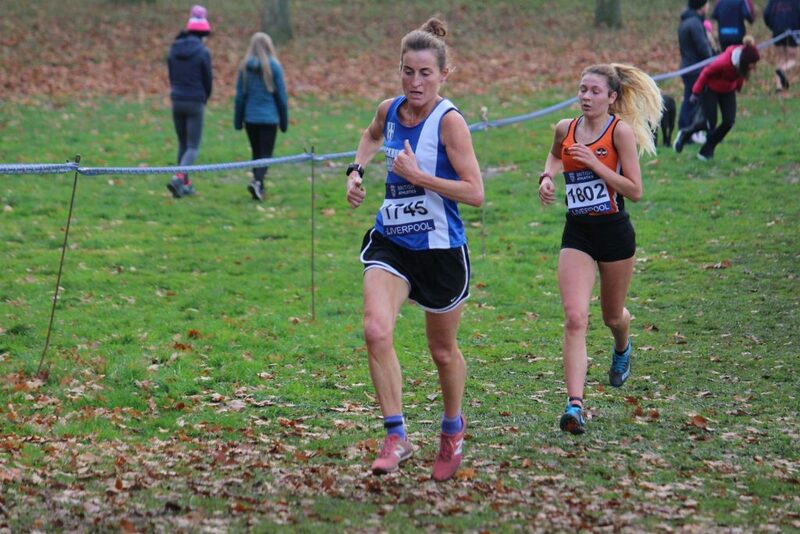 The Senior Women’s team was depleted today in terms of numbers and it was everything to play for as they fielded four athletes in an attempt to continue the winning run – Joanne Nelson, Annabel Ralph, Ellen Sagar-Hesketh, Lindsay Davies. 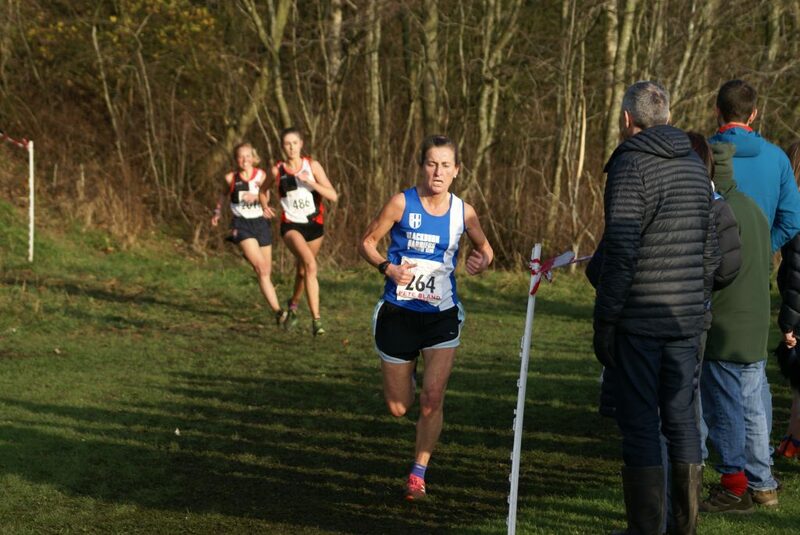 Three places in the first thirteen saw the Women take the race by just three points from Bury in 2nd place. 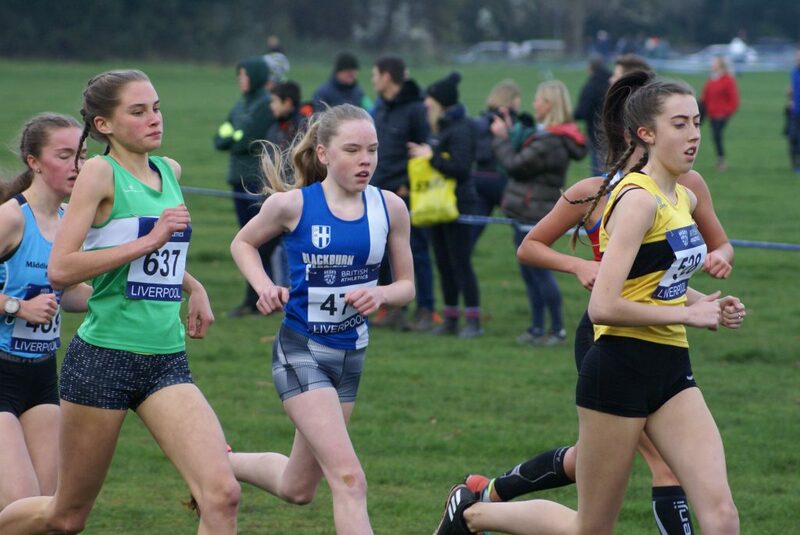 Joanne was the first Harrier across the line in 20.11 followed by Annabel in 8th position (20.25), Ellen in 13th clocking 21.10 and Lindsay in 41st place running a time of 23.27. 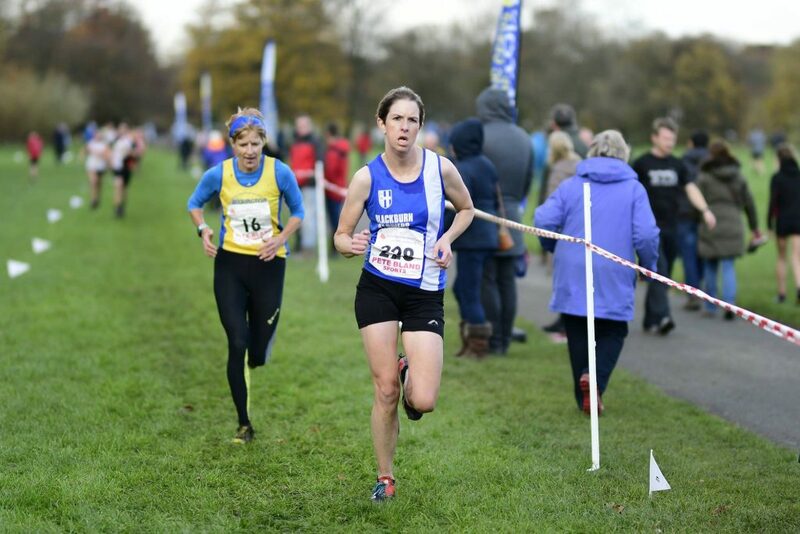 Joanne’s run saw her take her third successive win in the V45 category to take an unbeatable lead in the Series. 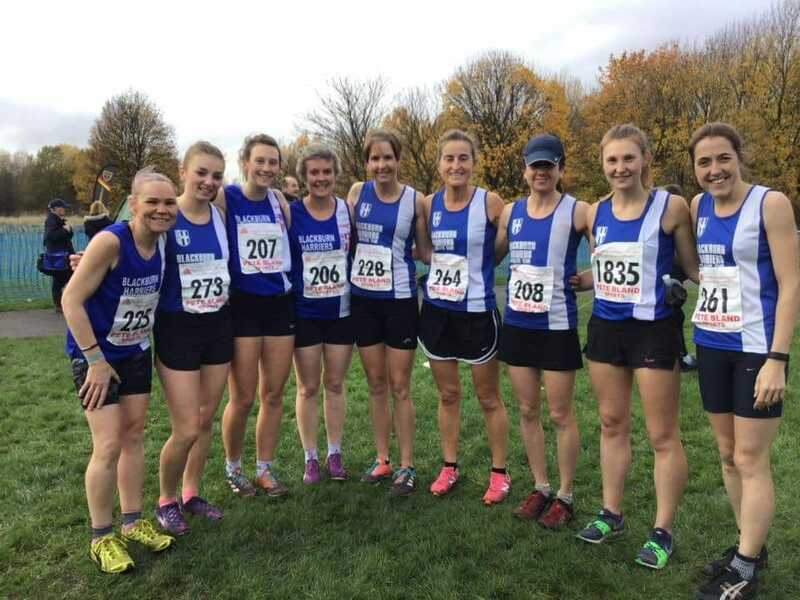 The Harriers Senior Men were in the same position as the Women having won the first two fixtures at Leigh and Bolton. 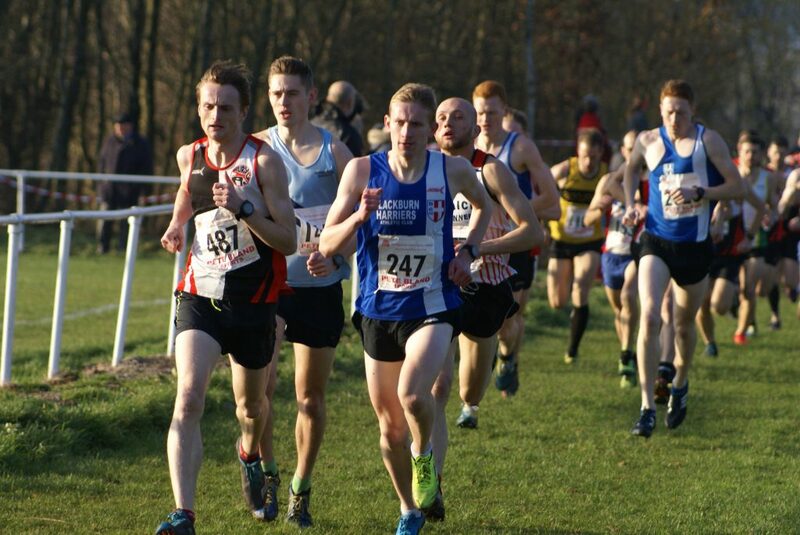 Another very good turn out by the Men and good packing saw the team take seven of the top twenty places giving them a win over a strong Bury Team by just nine points who had all of thier counters in the top twenty too, making it a very competitive race. 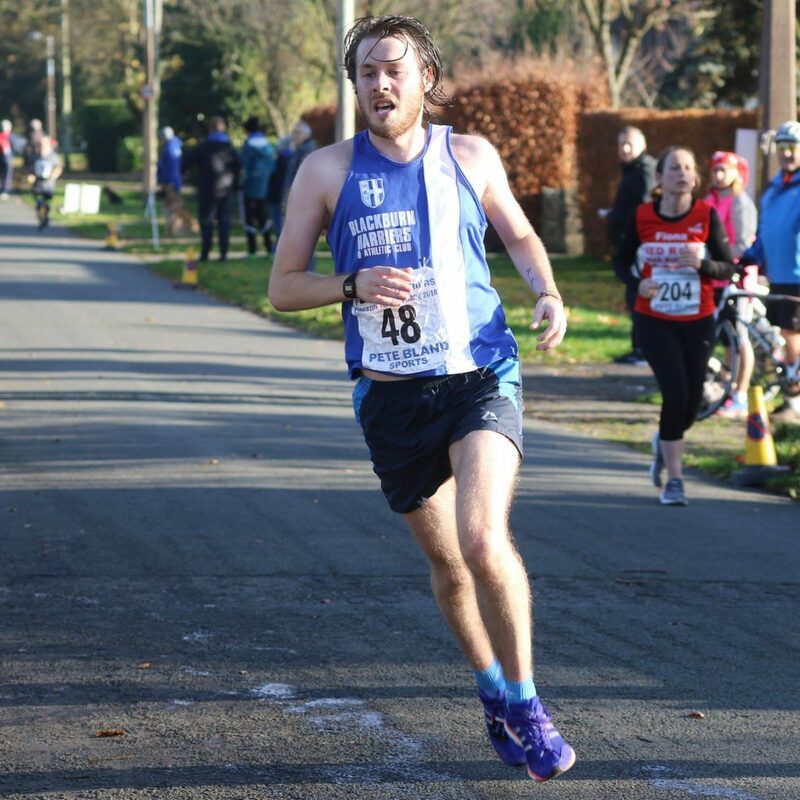 Men’s Team Captain – Paul Guinan – was a happy man after today’s fixture commenting “A great performance again from all the team, confirming the depth and class we have, taking the team victory again means we have retained the Red Rose Title, with still the final fixture remaining, now looking to the final fixture in 2 weeks time”. 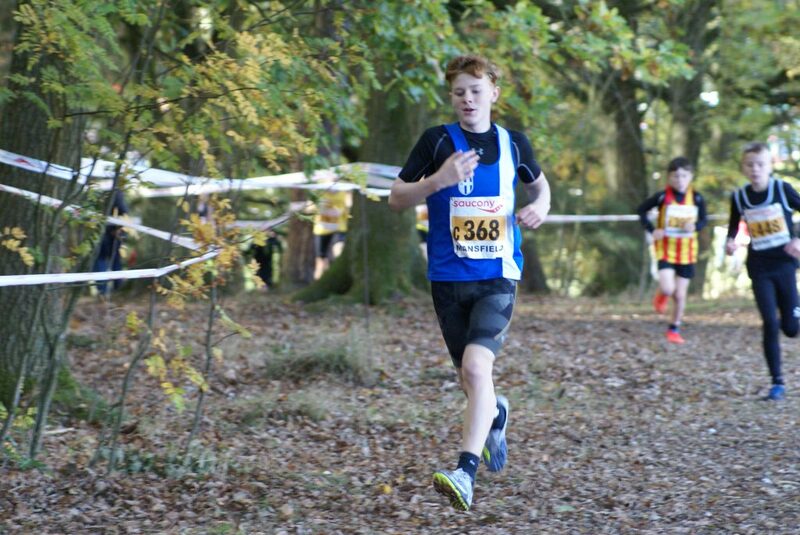 A very good run from Jack Hindle saw him take 2nd place to eventual winner Joe Johnston in a time of 27.28. 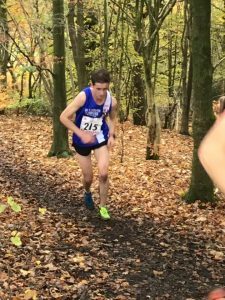 Dominic Walton is showing real strength on the cross country and also had a cracking run to place 8th in a time of 28.24 followed just one place further back by Ben Costello in 28.40. 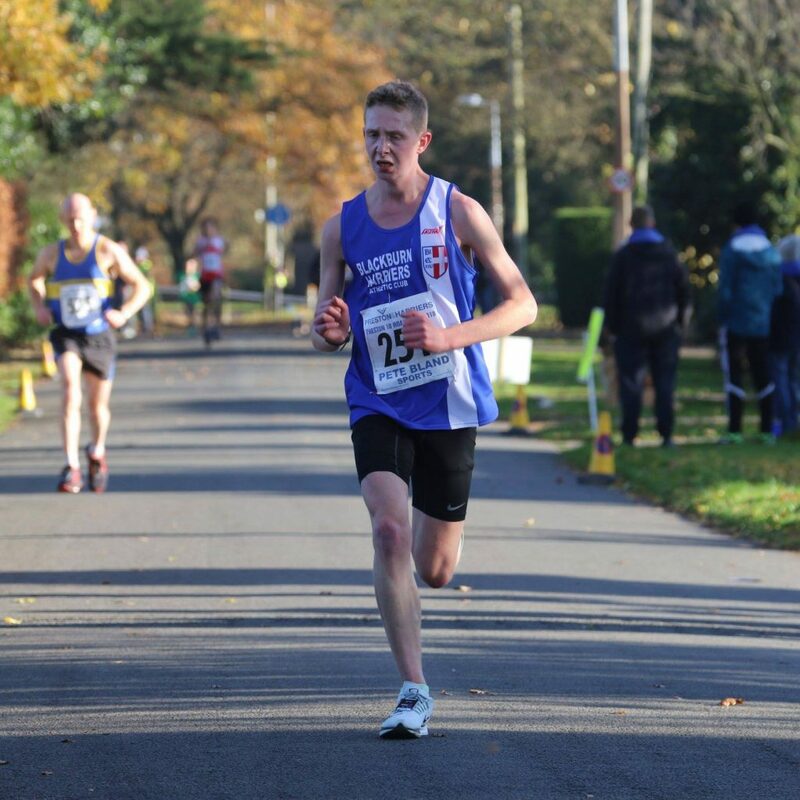 Danny Collinge was next across the line in 13th after holding the lead in the race early on, in a time of 29.34 with Marc Hartley in 17th place (29.54), Chris Davies one place behind in 18th running 29.57 and Tom Blaney in 20th posting a time of 30.22. 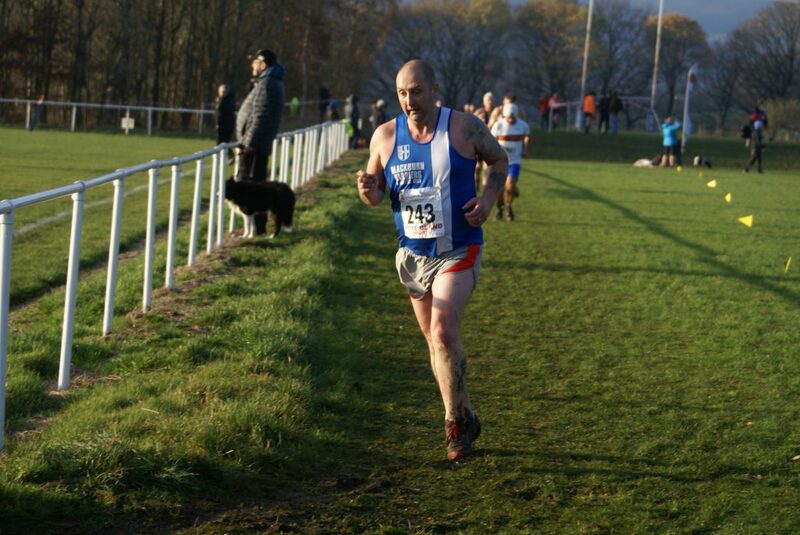 Chris also won the Vet 40 category which sees him heading the V40 table going into the third fixture at Todmorden. 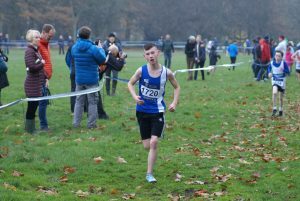 Just six seconds separated Paul Bradshaw in 25th spot with a time of 30.58 and Calum Holmes in 27th with a time of 31.04. 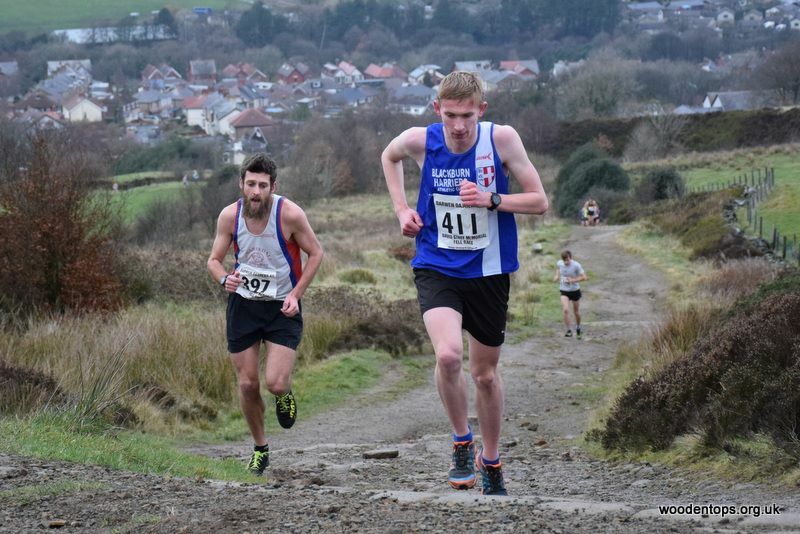 Tom Marchant in 42nd place and Paul Brindle in 43rd were split by just one seocnd as they clocked 32.20 and 32.21 respectively with Allan Hartley in 155th place (40.51). 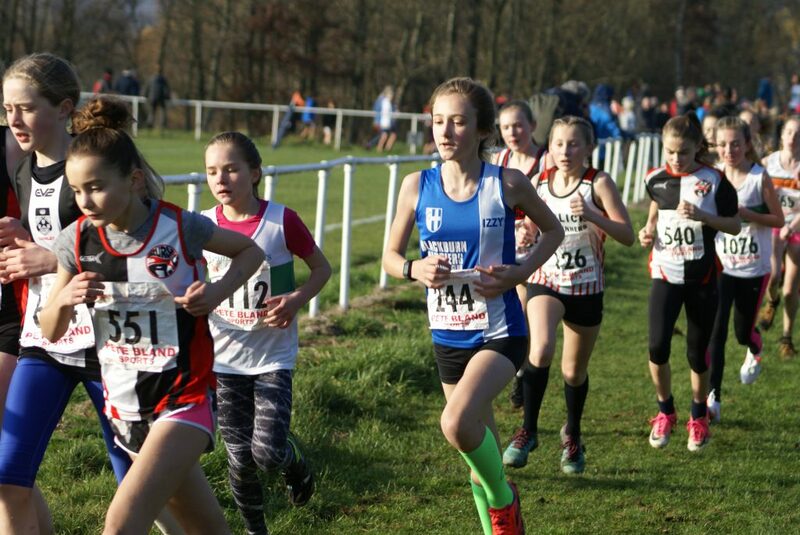 With the Junior Harriers concentrating on the Mid Lancs League in the main this season, there were just a handful of them out on the day. 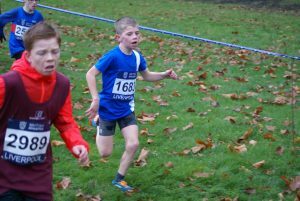 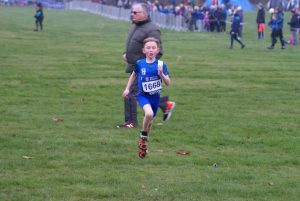 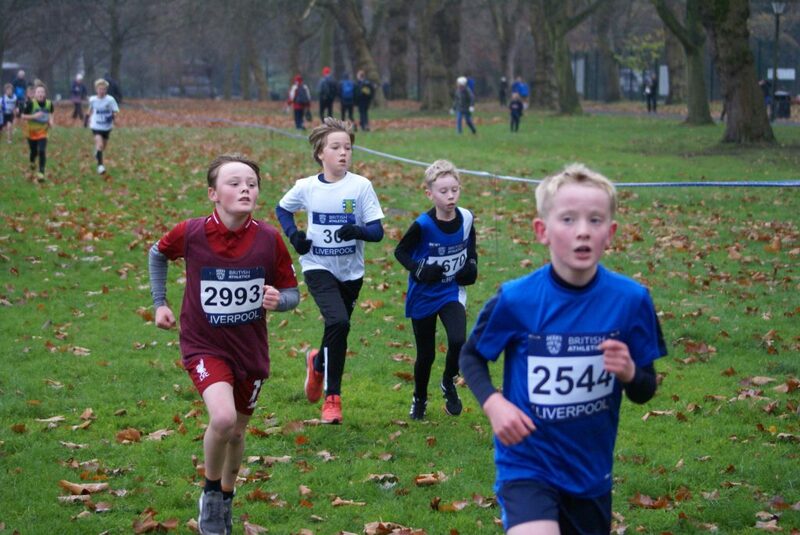 In the U11 Boys the lads managed a 3rd place for the Team on the day, led home by Matthew Smith with a very good run of 5.47 in 5th place with another good run from Oliver Gill in 7th position clocking 5.54 and supported by Findlay Carroll in 31st place (6.30), George Holman in 66th spot running a time of 7.04 and Isaac Smith in 78th (7.48). 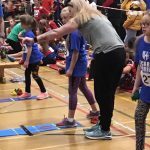 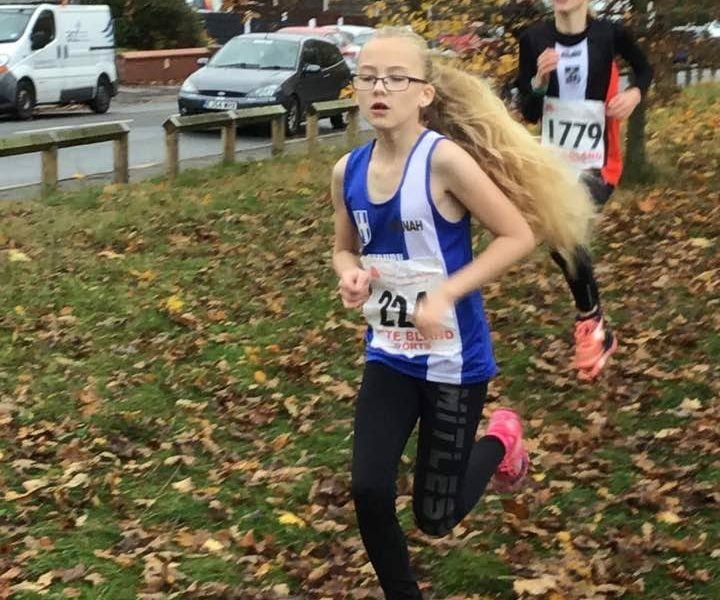 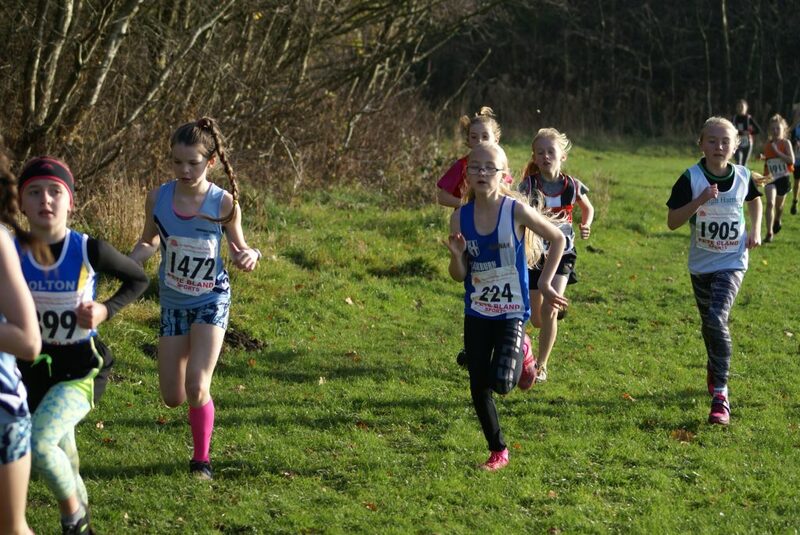 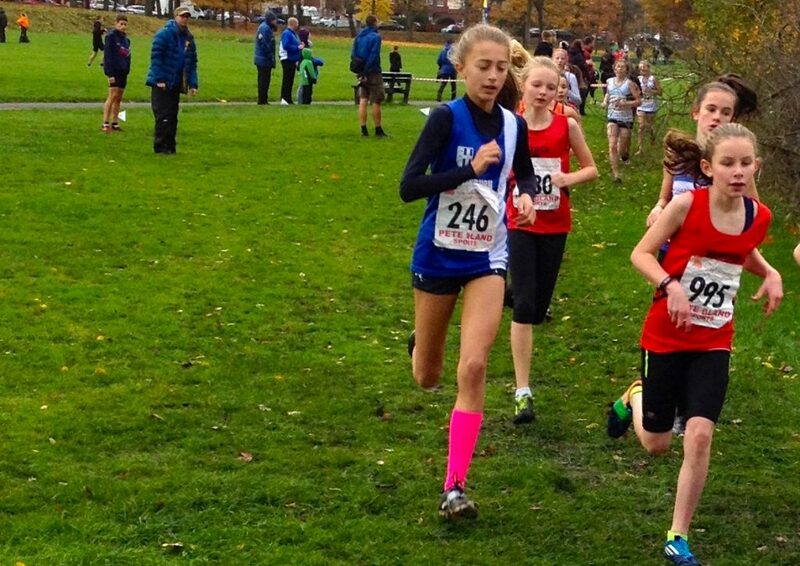 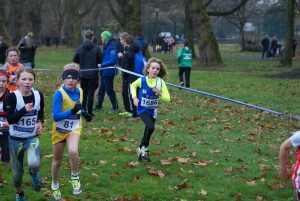 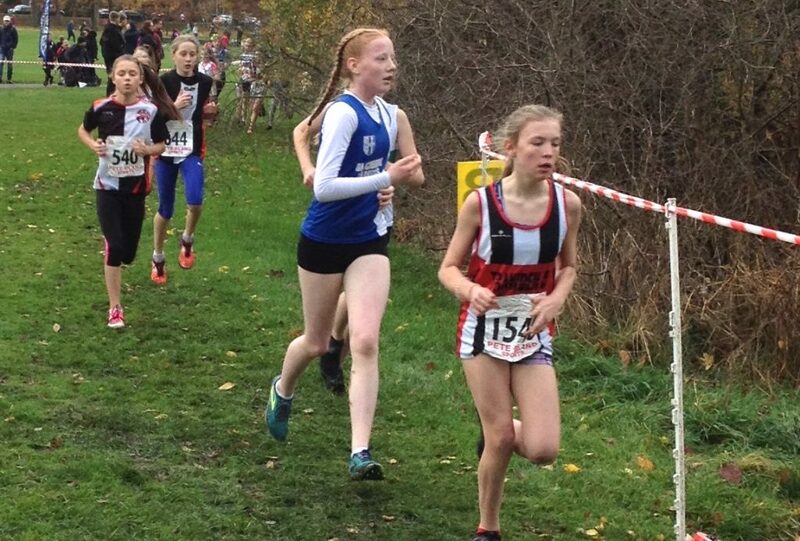 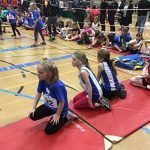 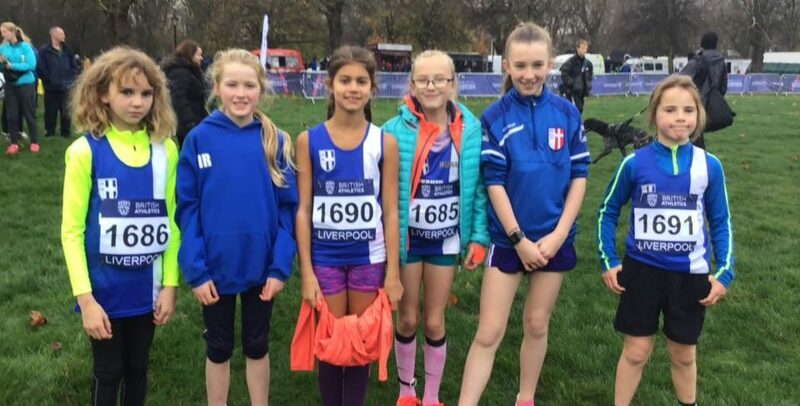 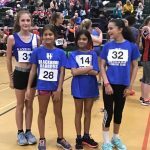 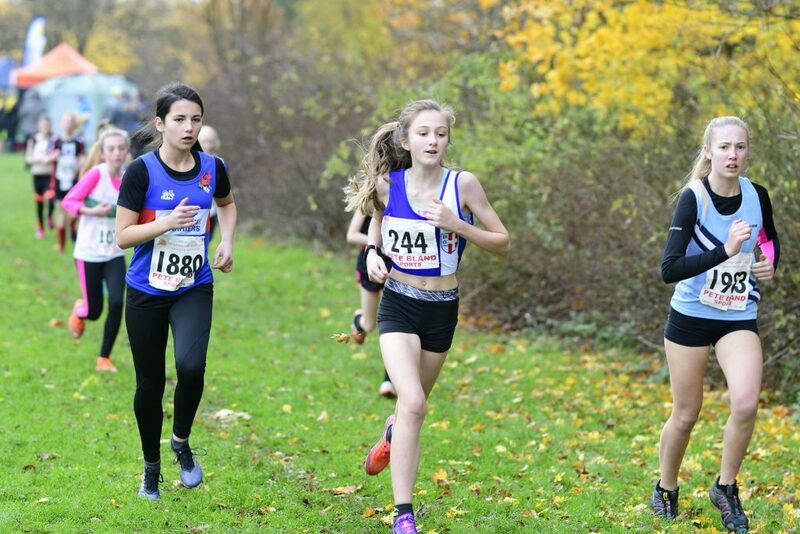 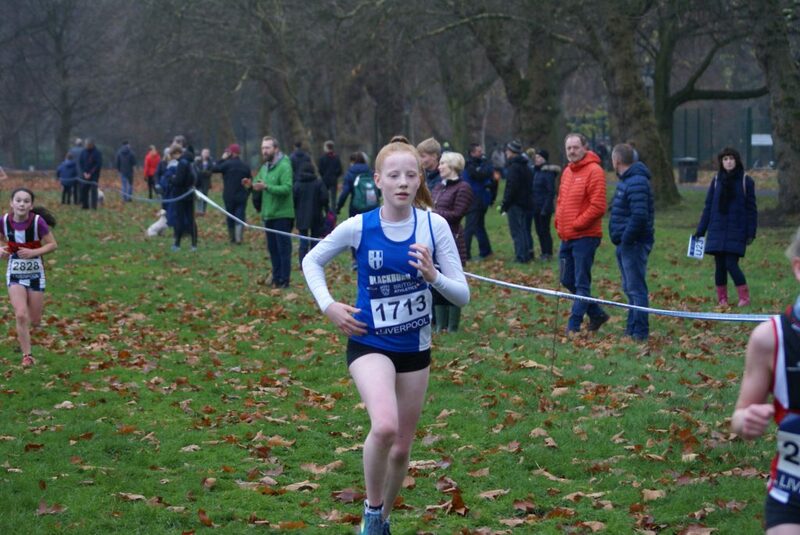 Ninety one runners in the U11 Girls and for the Harriers it was Hannah Davies who toed the line at the start, producing a good run to finish 14th overall in a time of 6.46. 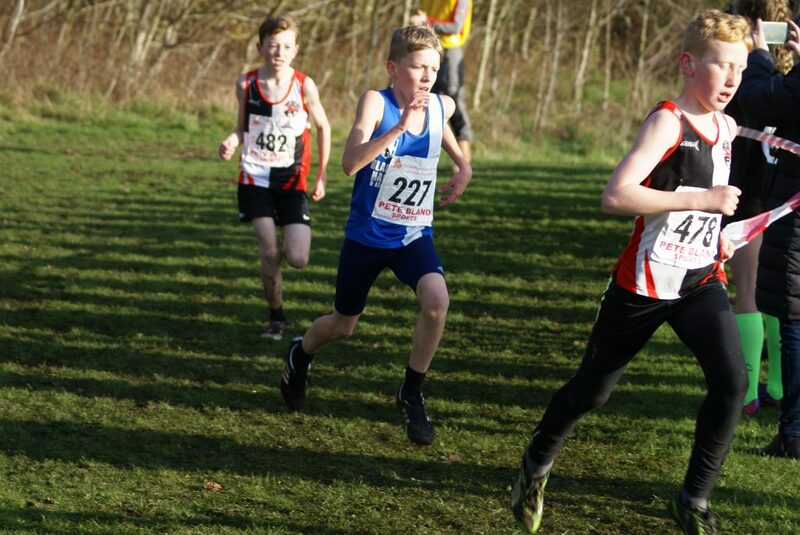 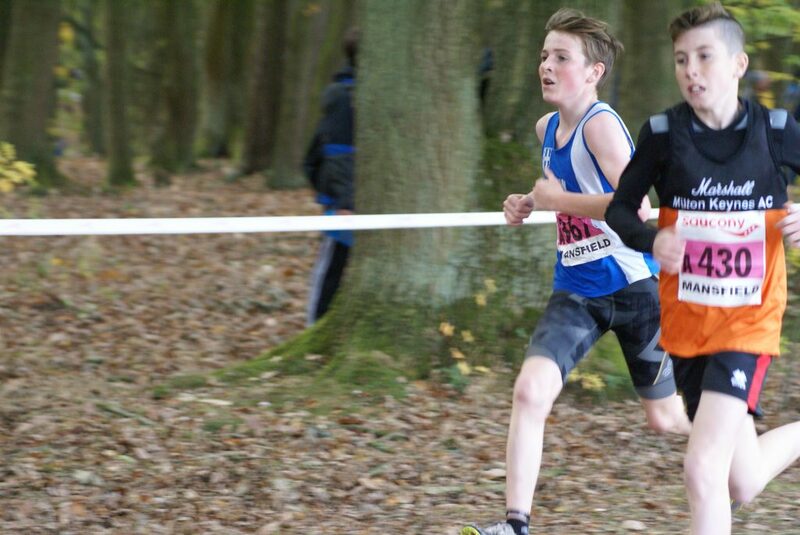 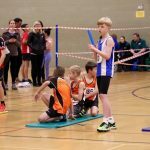 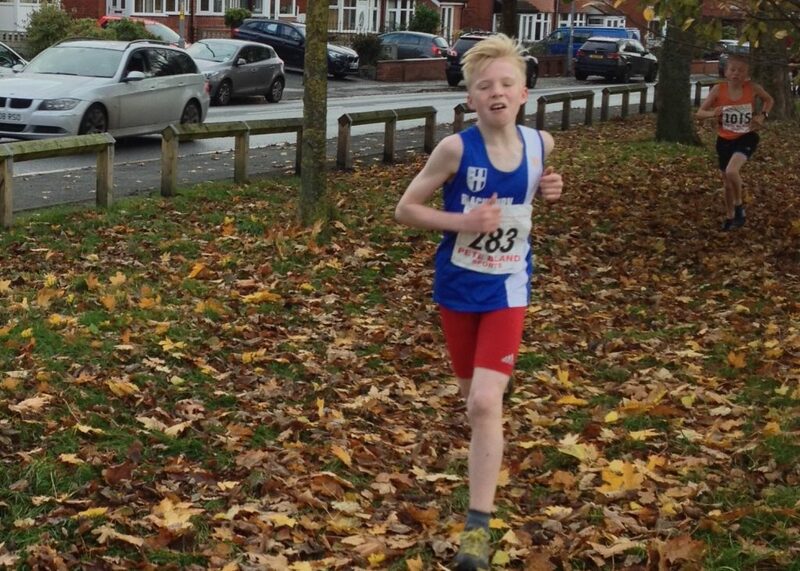 The U13 Boys finished in 4th place – just nine points off 3rd placed Leigh Harriers. 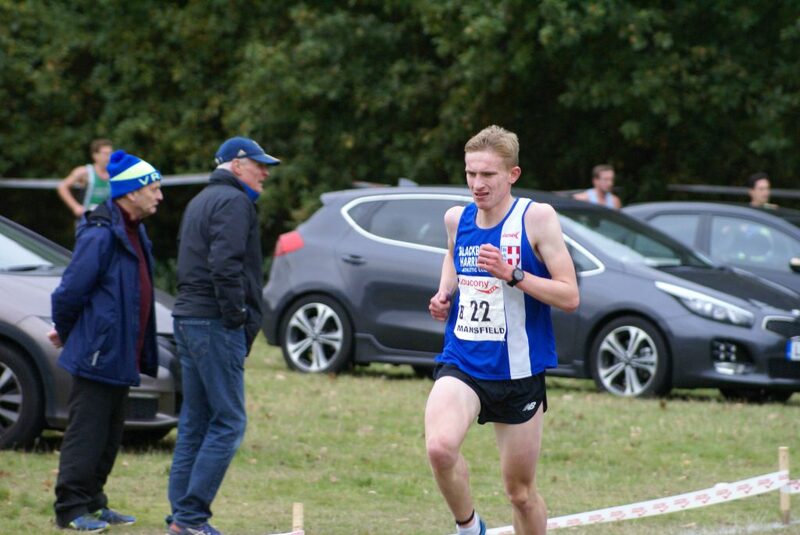 Daniel Smith had a very good run, working his way through the field to be the first Harrier home in a time of 9.04 (12th). 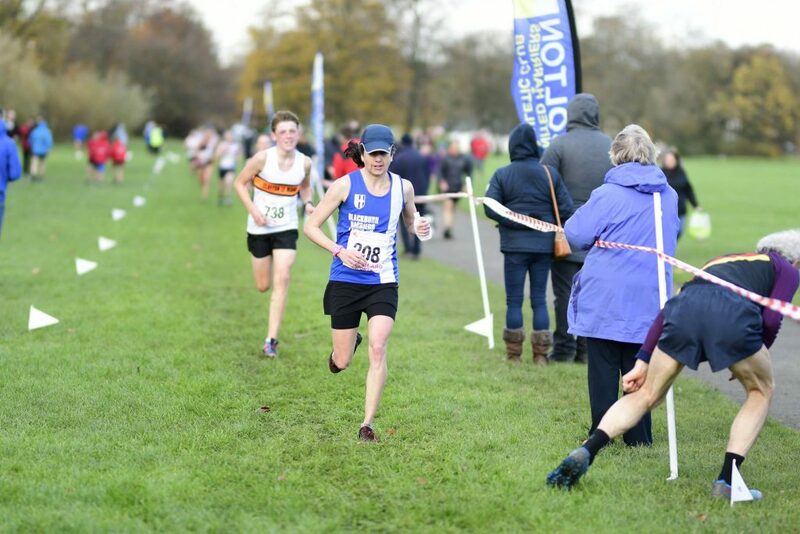 Codie Dewhurst was the next club mate home clocking 9.17 in 16th place, with Saul Sharp in 21st running a time of 9.28 and Harry Sambrook in 25th out of the 61 strong field in 9.37. 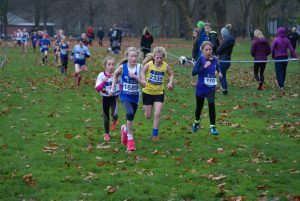 Isabelle Hartley ran in the U13 Girls Race clocking 10.46 in 44th place. 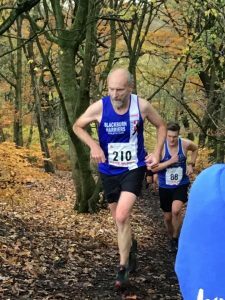 Blackburn Harriers & AC are deeply saddened to report the death on Thursday 8th November 2018 of George Kirby aged 95. 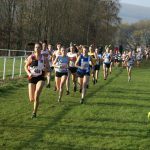 It would not be an over estimation of George to say that he, more than anyone, had more influence on the sport of athletics in the Lancashire area and beyond than almost anybody since the end of the Second World War. 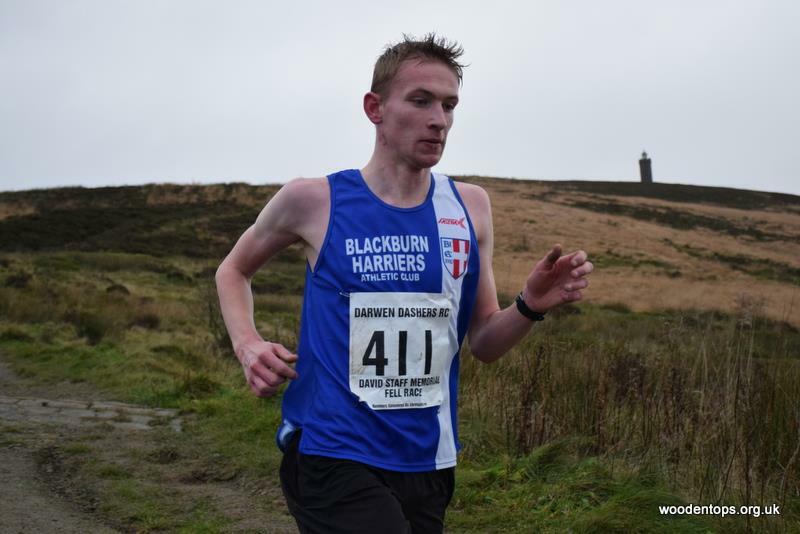 Having served in the RAF as a bomber pilot George returned to teaching in the Blackburn area and very soon became involved in the resurgence of Blackburn Harriers after the war. 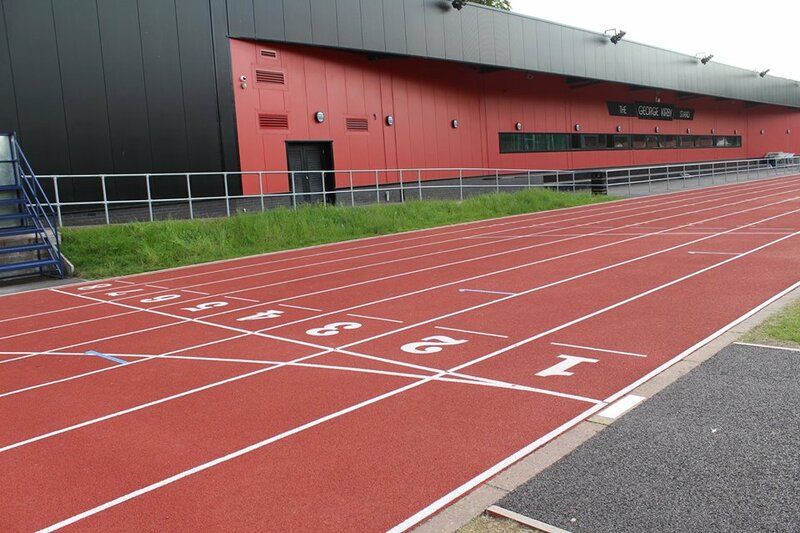 He enthusiastically argued for the laying of the athletics track at Witton Park which was opened in 1958 and in the following 60 years became an integral part of everything that was Blackburn Harriers as President, Chairman, coach and official. 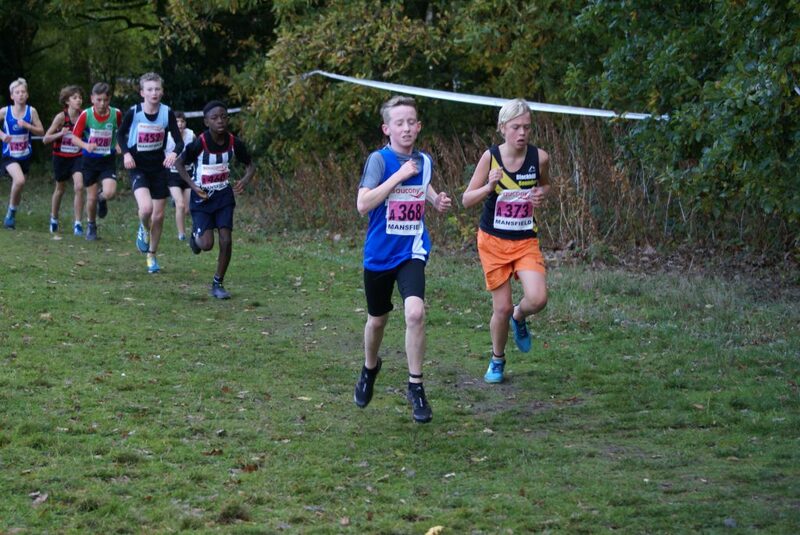 During that time he graduated into regional and then national athletics. 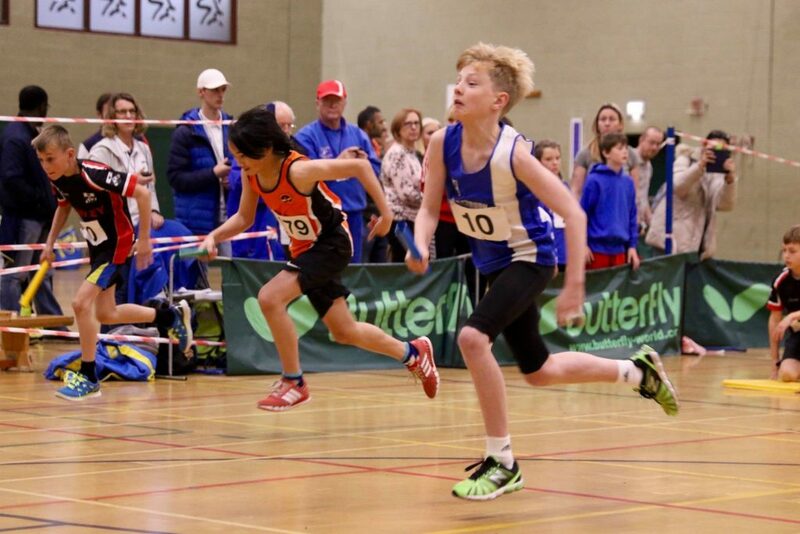 He became a senior AAA coach and Grade 1 Judge and was an international field events official and referee. 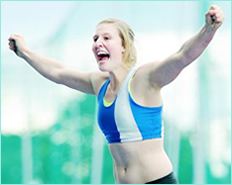 In 1975 he was appointed coach to the Great Britain Athletics Team in addition to being a AAA Northern Staff coach for the discus. 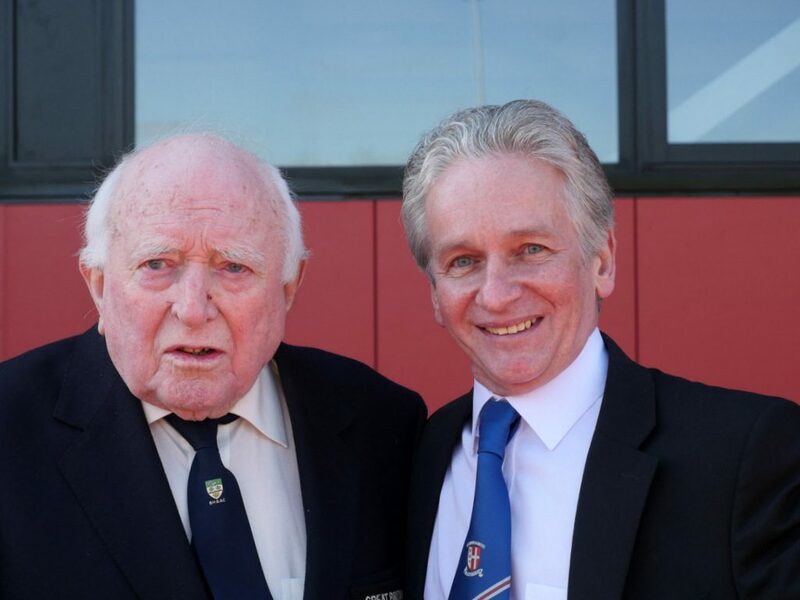 He was frequently seen on television both as a judge and an official at international, European and national championships. 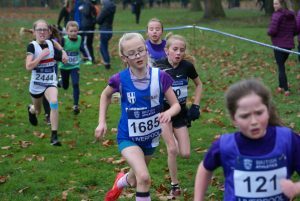 In the 1960’s he was instrumental in arranging extremely popular invitation events at Witton Park to which many international athletes came, including Derek Ibbotson, Bruce Tulloh, Ron Hill, Barrie Kelly, Dorothy Hyman and Mary Peters. 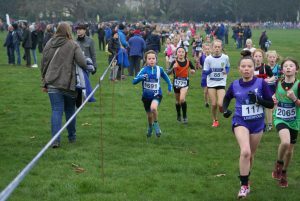 He ensured that Witton Park became the venue for Northern Cross Country Championships, National Women’s Cross Country Championships and the Women’s International Cross Country Championships. 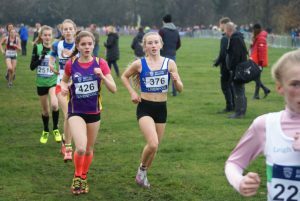 George held numerous offices in the British Athletics League and was one of the founder members who set up the league being official’s secretary for many years. 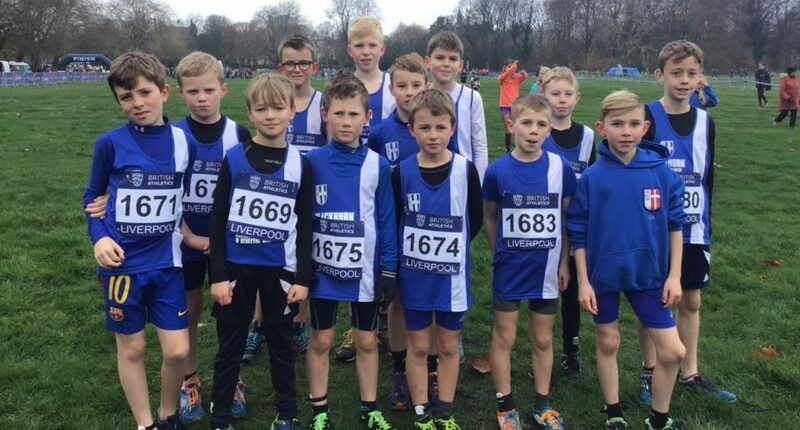 He was an athletics correspondent for the Lancashire Evening Telegraph for more than a quarter of a century and was the person to go to if any information on the history of local athletics or national athletics was needed. 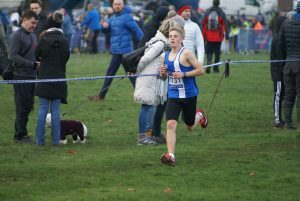 He remained actively interested in athletics right up to the end of his life, including this year attending a Northern League fixture at Witton Park. 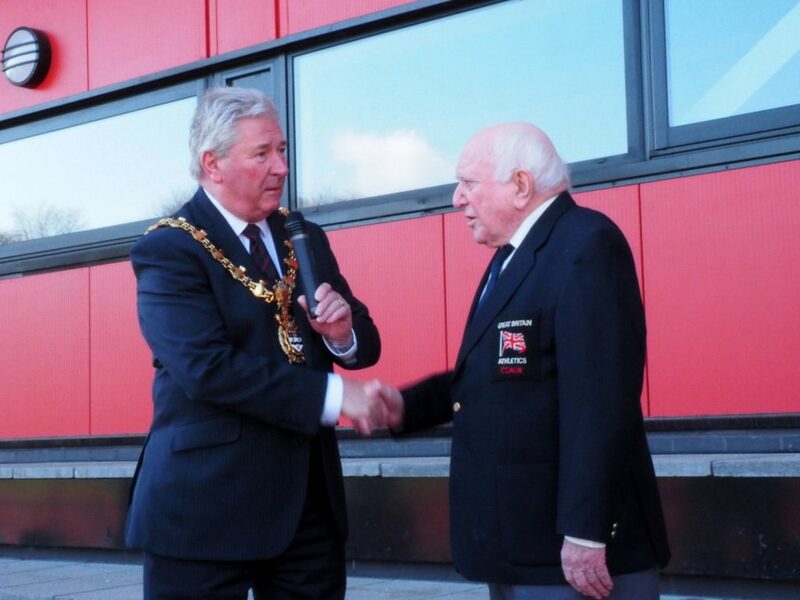 He had been President of the Club for many years, President of Lancashire Athletic Association as well as being Chairman of the Northern Counties Officials Association. 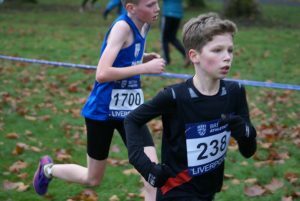 He was particularly proud to see the club have three Olympians in 2012 and 2016 including a bronze medal in Rio for Sophie Hitchon in one of his favourite events. 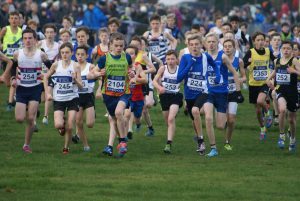 The Club and athletics in general were blessed when George came along all those years ago to play a part in our sport and in particular to put all his energies into ensuring it was enjoyed by so many people over so many years. 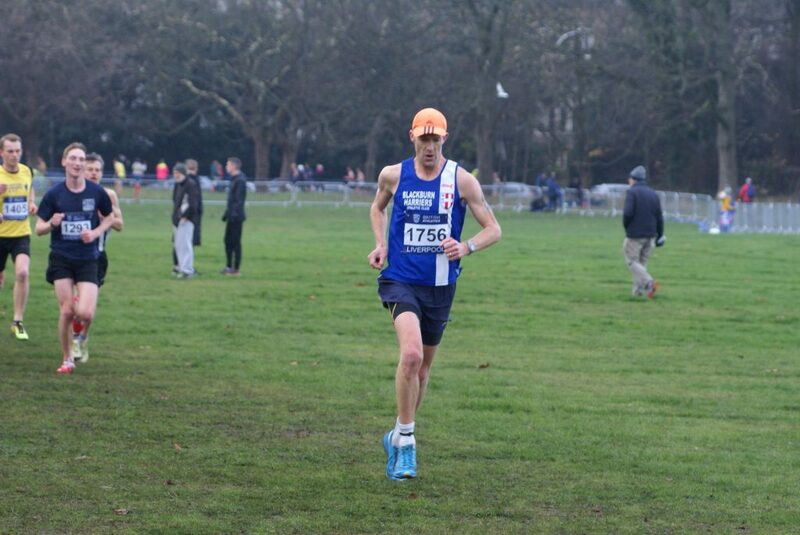 He will be sadly missed and our thoughts go to his wife Marion and his family at this sad time. 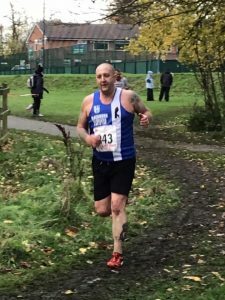 Funeral details will be announced in due course. 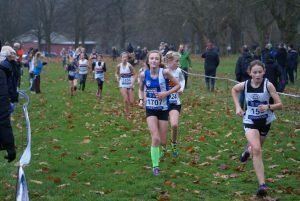 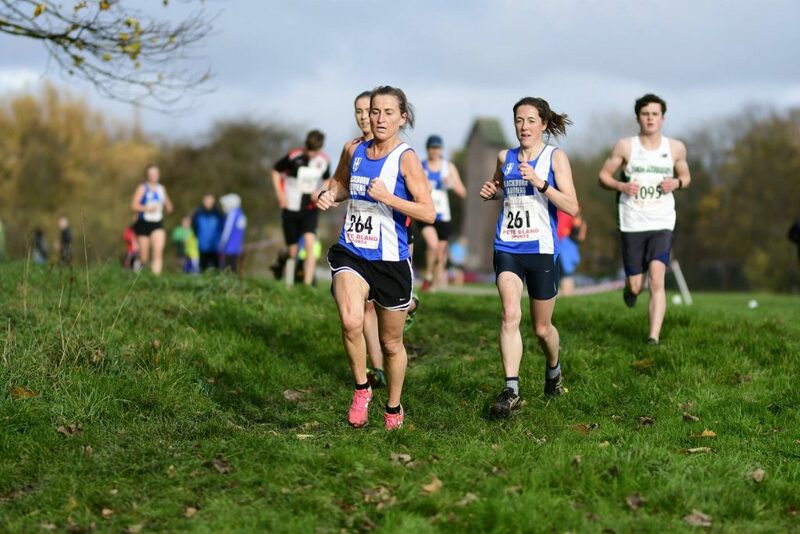 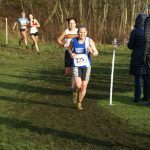 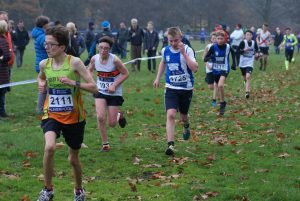 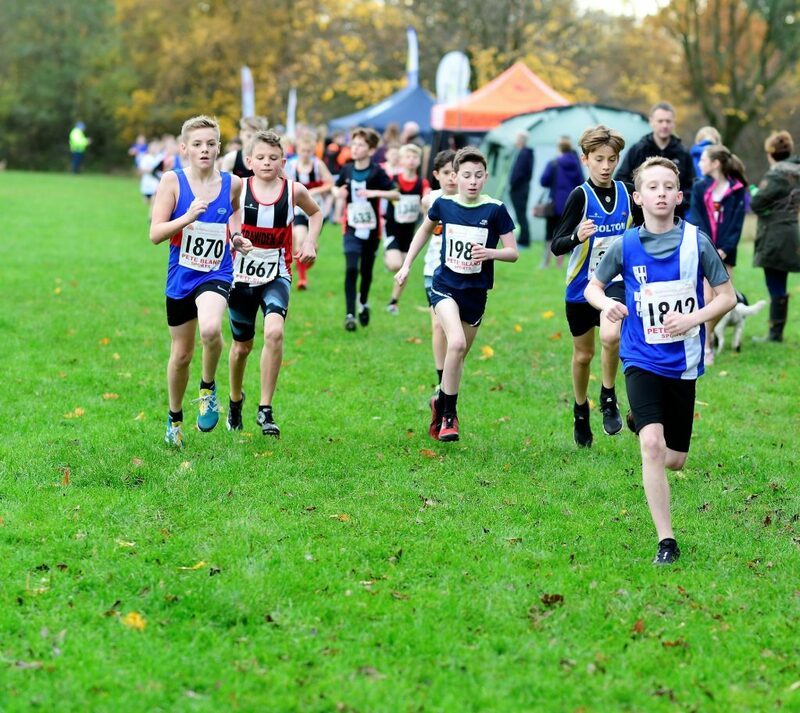 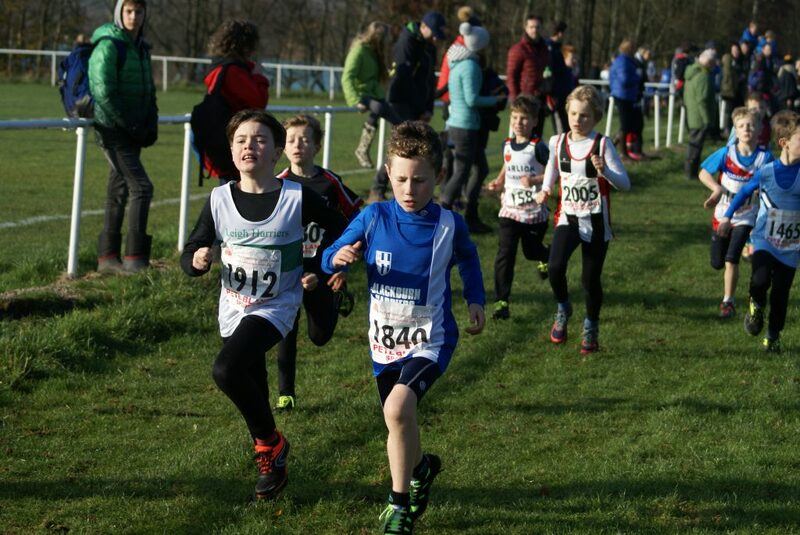 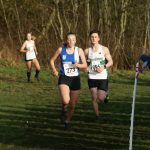 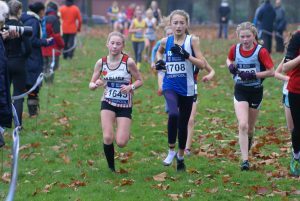 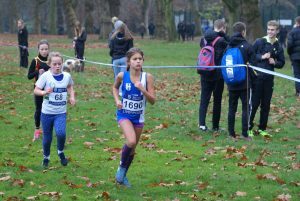 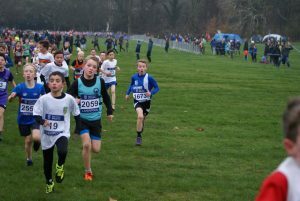 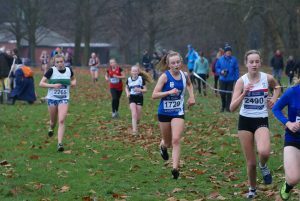 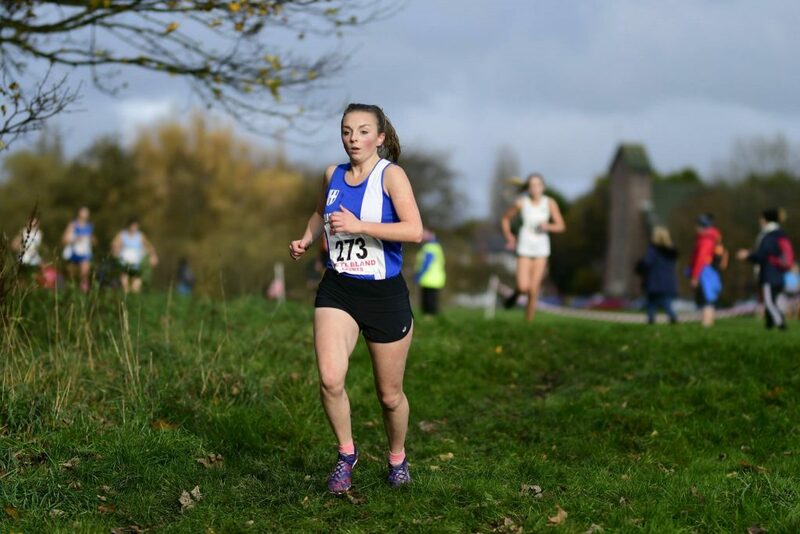 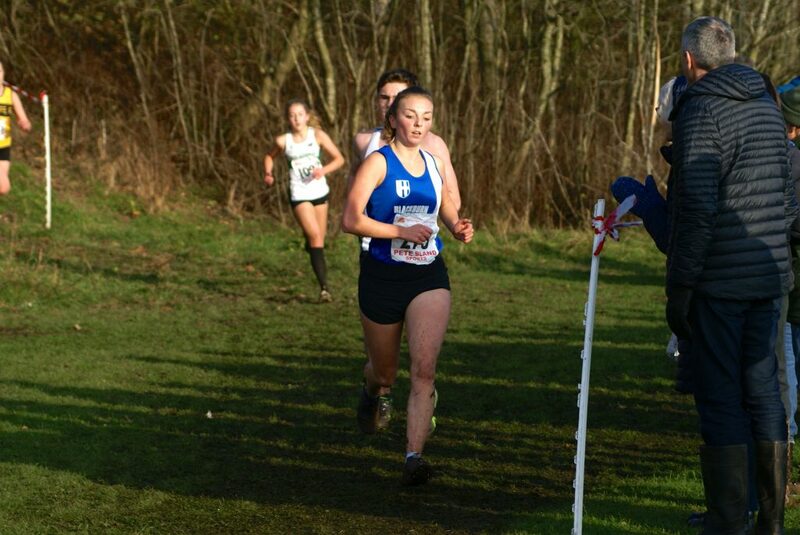 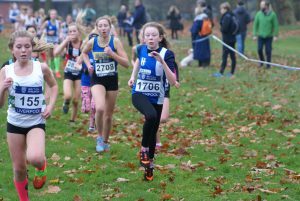 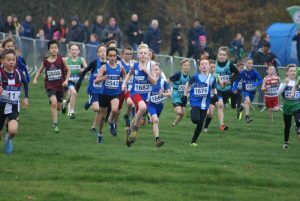 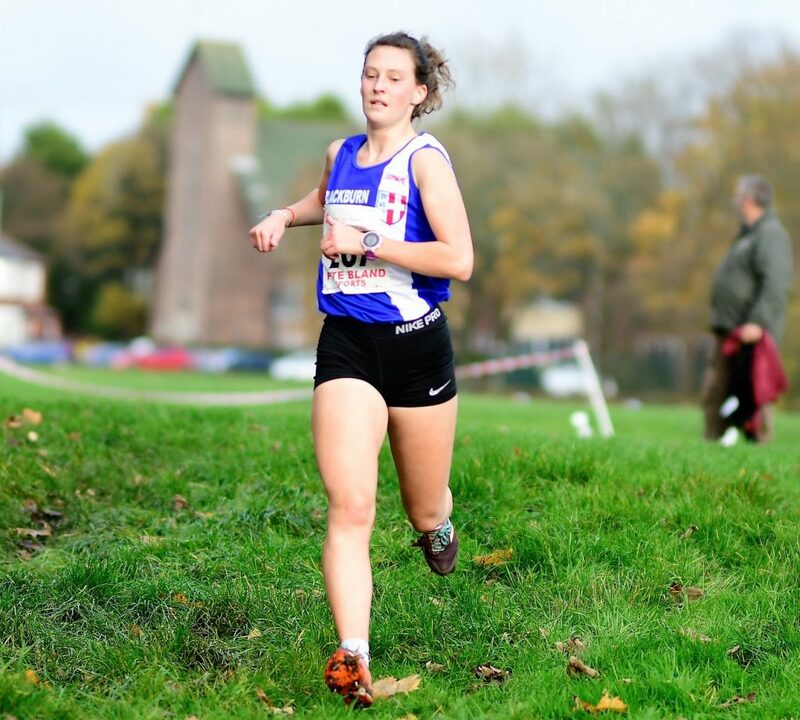 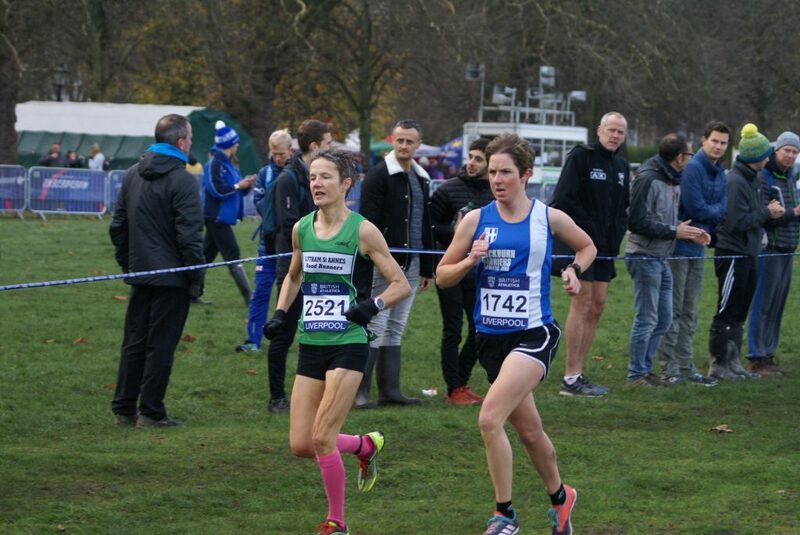 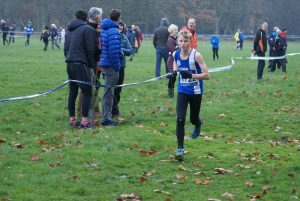 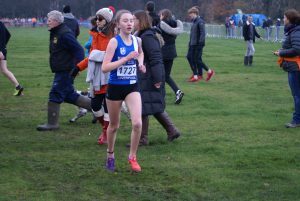 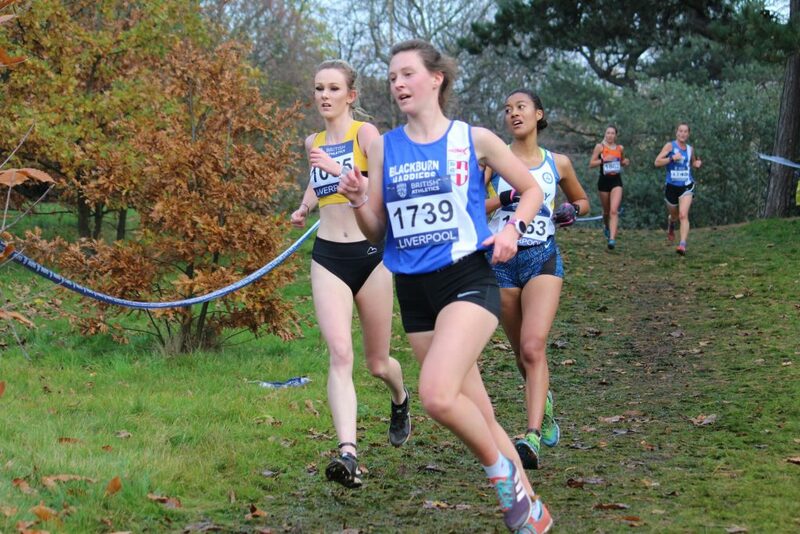 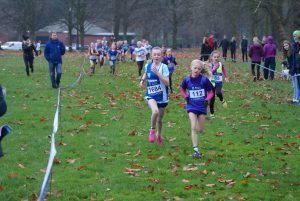 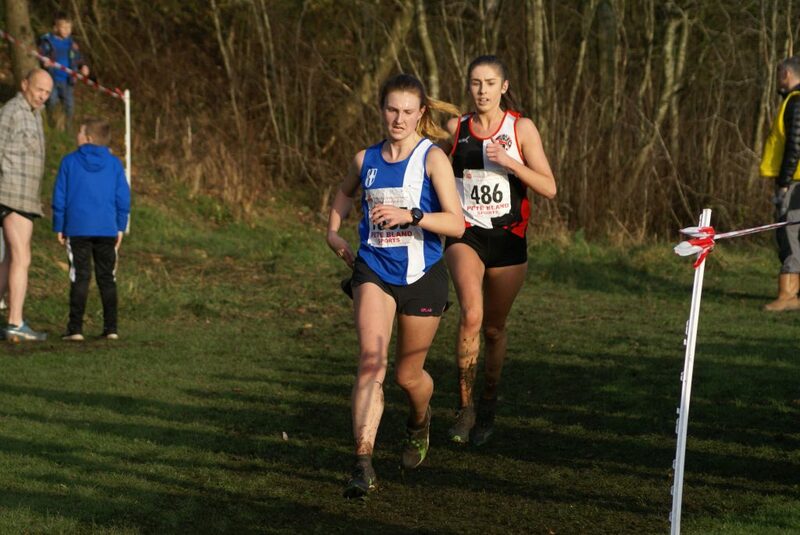 Windy but very dry conditions for this years National Cross Country Relays held at Mansfield at the weekend which featured some greating racing and competition amongst all the age groups. 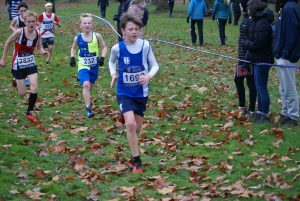 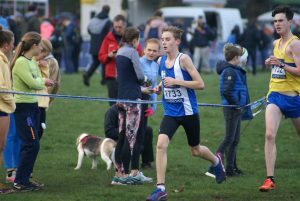 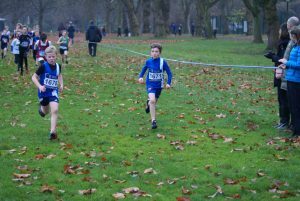 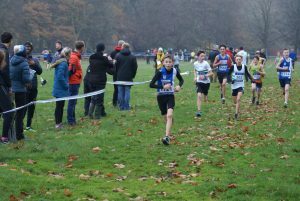 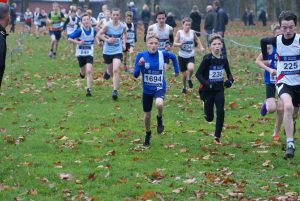 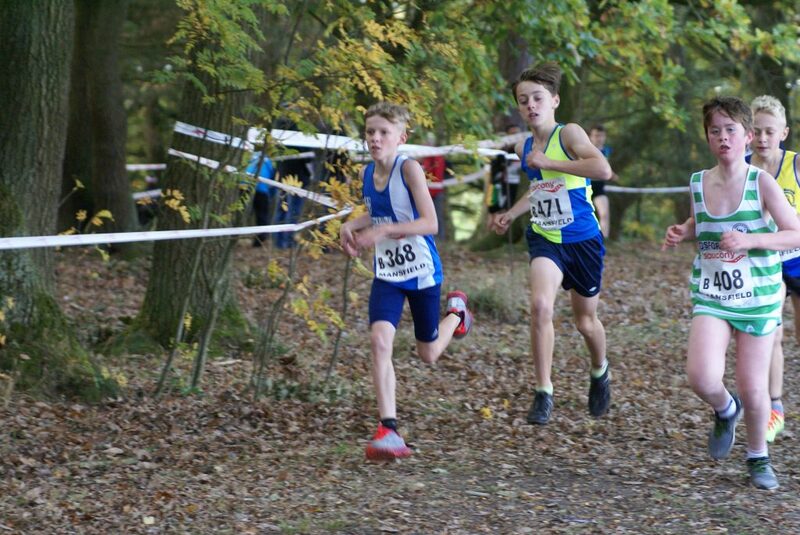 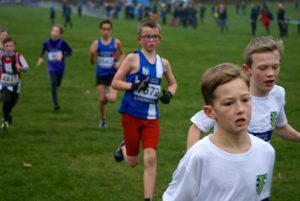 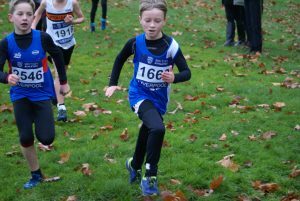 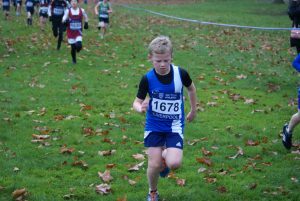 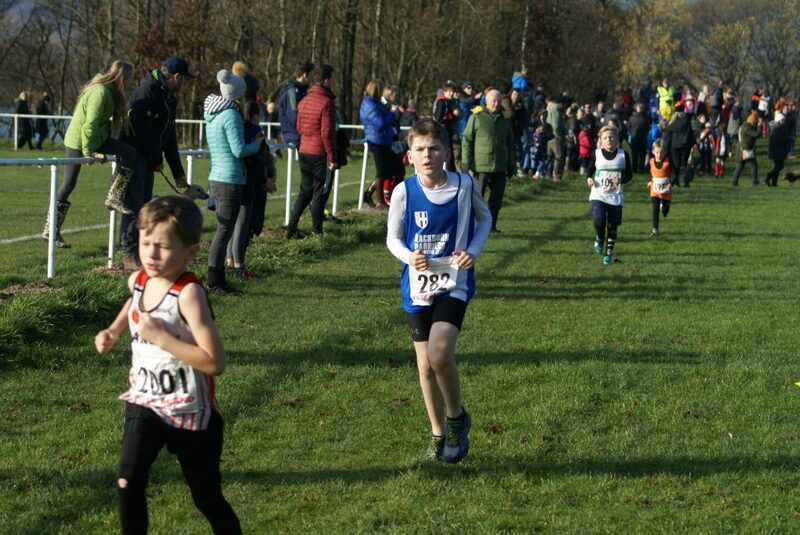 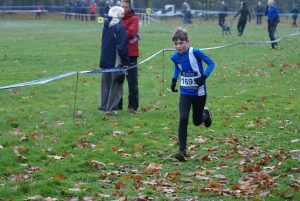 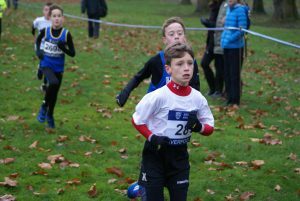 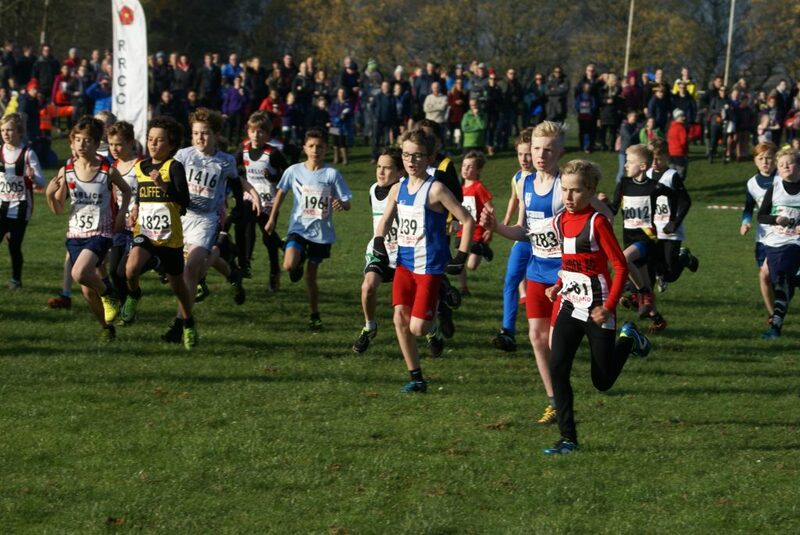 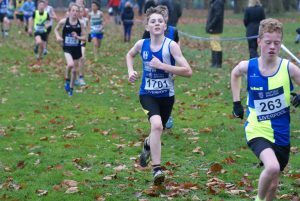 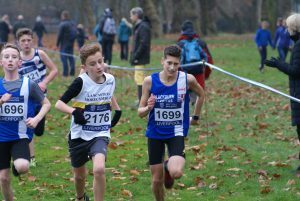 First up for the Harriers were the U13 Boys race in which the Club had three teams entered in a field totalling eighty eight teams with another eighteeen part teams. 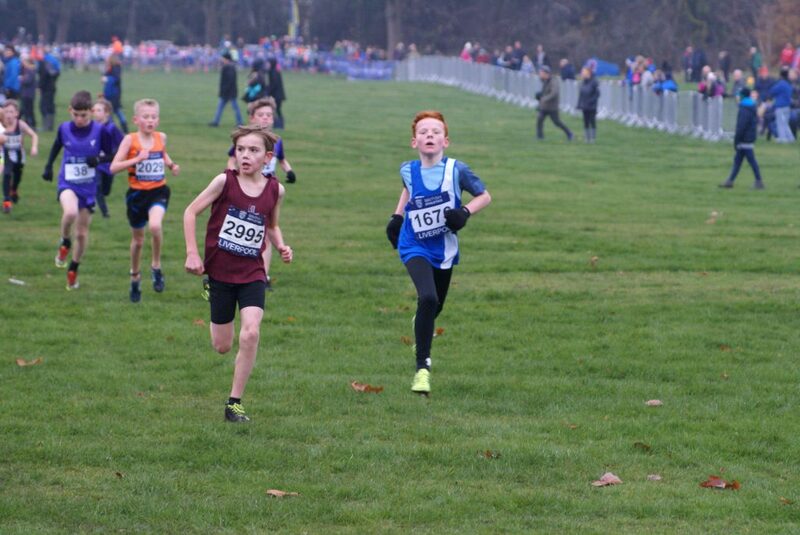 The lads did really well finishing in 22nd, 43rd and 66th positions and for a number of the youngsters, this was their first taste of Championship competition, acquiting themselves in the best possible way by giving it everything they had. 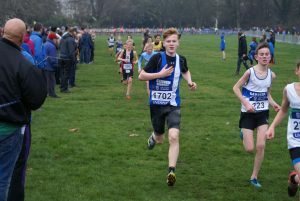 The ‘A’ Team of Dexta Thompson – Jonathan Brindle – Isaac Butler finished in 22nd spot with Dexta running the fastest leg of the team in 7.12 to hand over to Jonathan in 17th place. 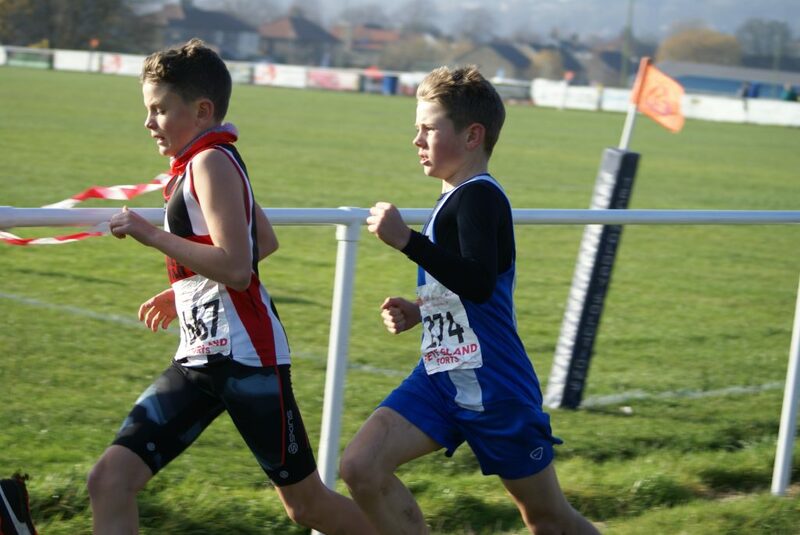 Jonathan ran a time of 8.10 to pass on to Isaac on the final Leg in 42nd place. 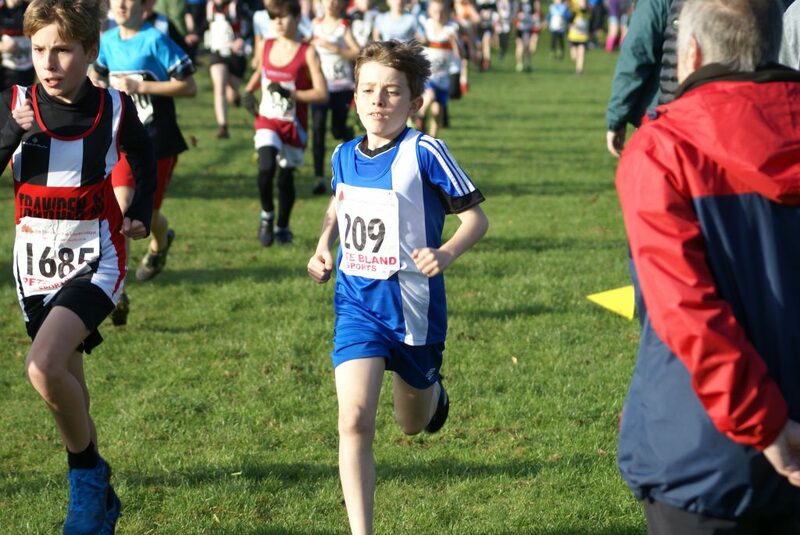 Isaac had a cracking Leg as he clocking 7.15, pulling back twenty places. 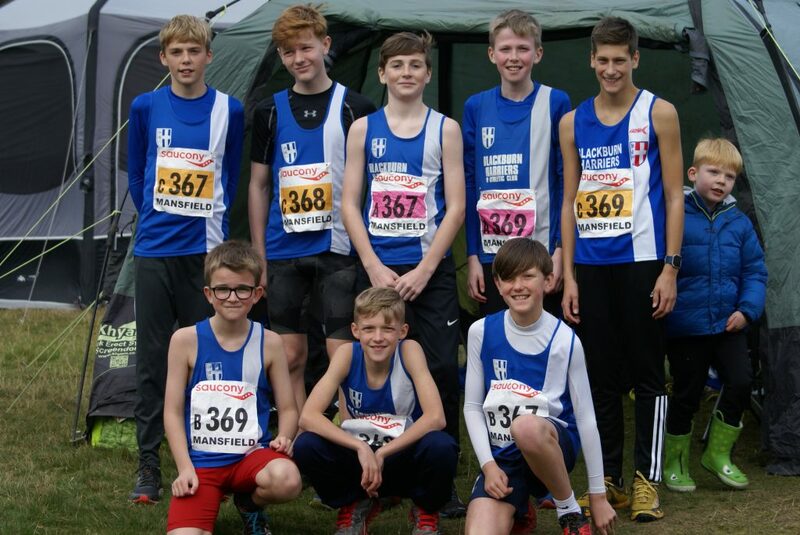 Our ‘B’ Team which had Ben Livesey, Codie Dewhurst and Theo Watson saw Ben lead off on leg (1) in a good time of 7.53 to hand over to Codie in 73rd place who ran a solid time of 8.05 – pulling back fifteen places, bringing the lads back to 58th place. 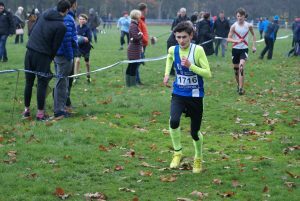 Theo ran the final Leg, running the fastest time of the team (7.26) – also winning back fifteeen places – to bring them home in 43rd. 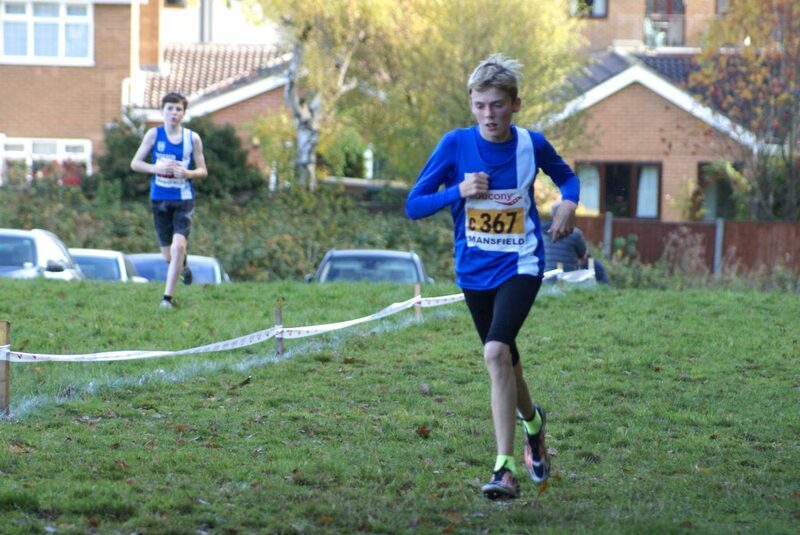 The ‘C’ Team had Daniel Smith on Leg (1), Oliver Gill on Leg (2) and Saul Sharp on Leg (3). 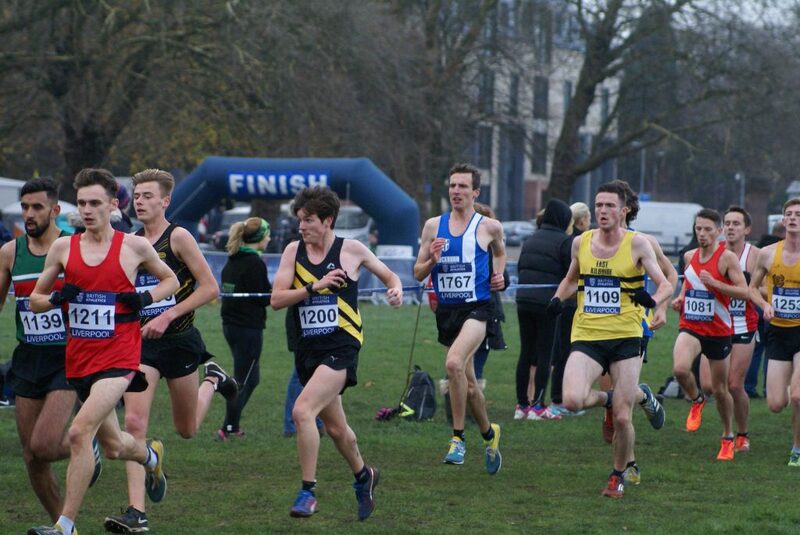 Consistent running by the lads saw them produce times which only had them separated by twelve seconds. 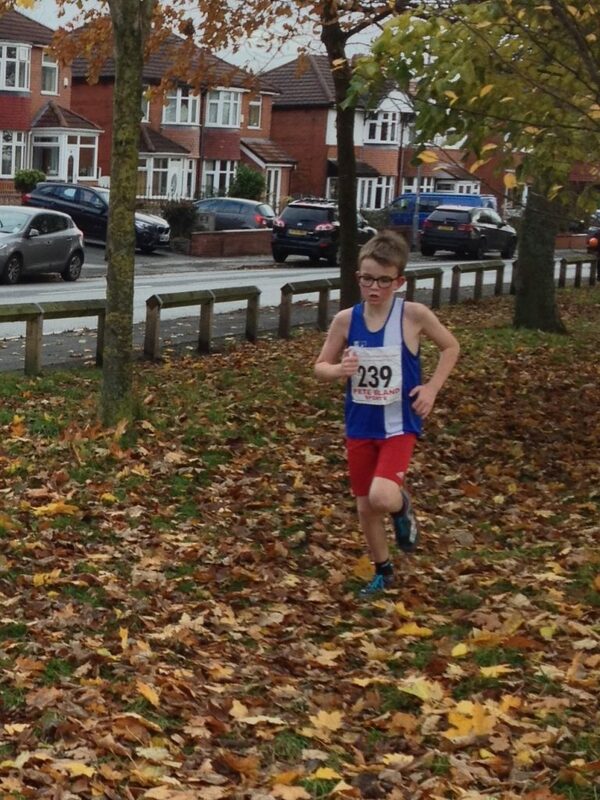 Daniel lead off with a clocking of 8.24 to hand over to Oliver on Leg (2) in 101st. 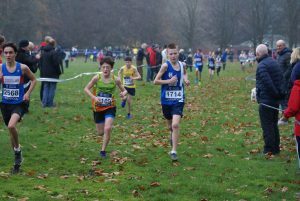 Oliver ran a time of 8.11 – the fastest of the team – to win back a massive twenty three places as he handed over to Saul on Leg (3) in 78th. 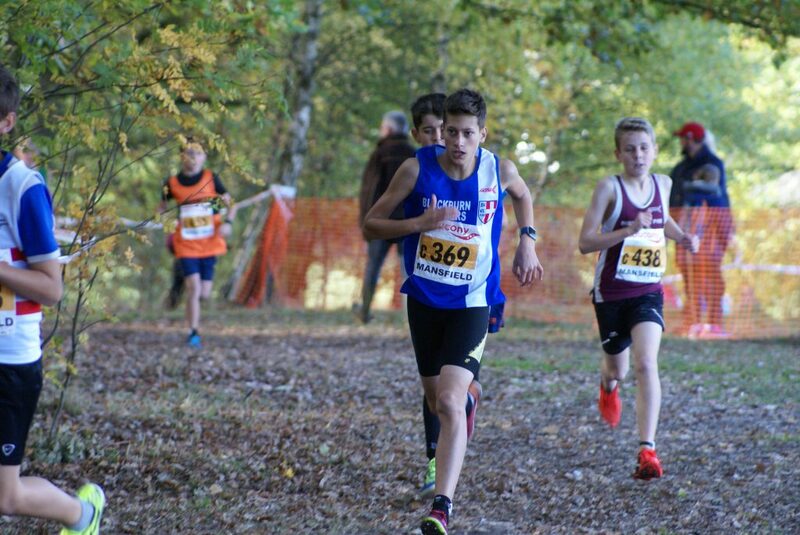 Saul continued clawaing back places for the team winning another twelve places with a time of 8.13. 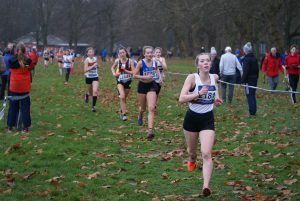 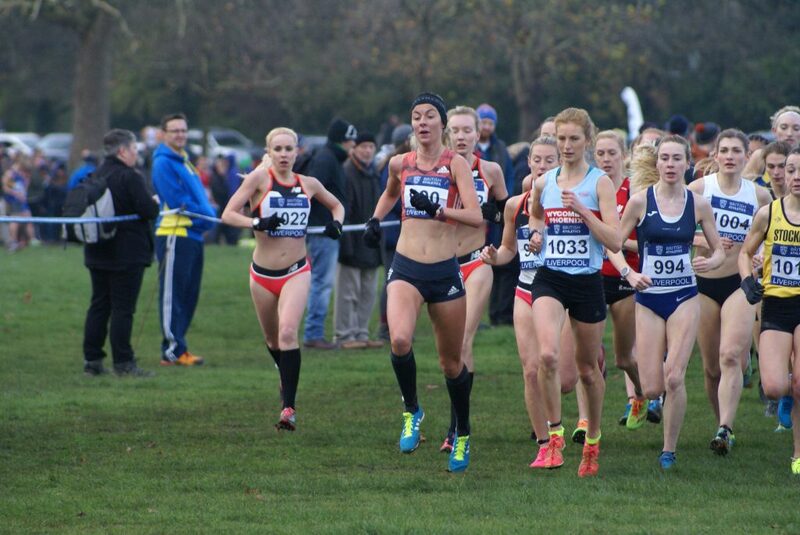 In the Senior Women’s Race the Harriers had one full team and a part team featuring Katie Buckingham, Ellen Sagar-Hesketh, Jess Judd and Lindsay Davies. 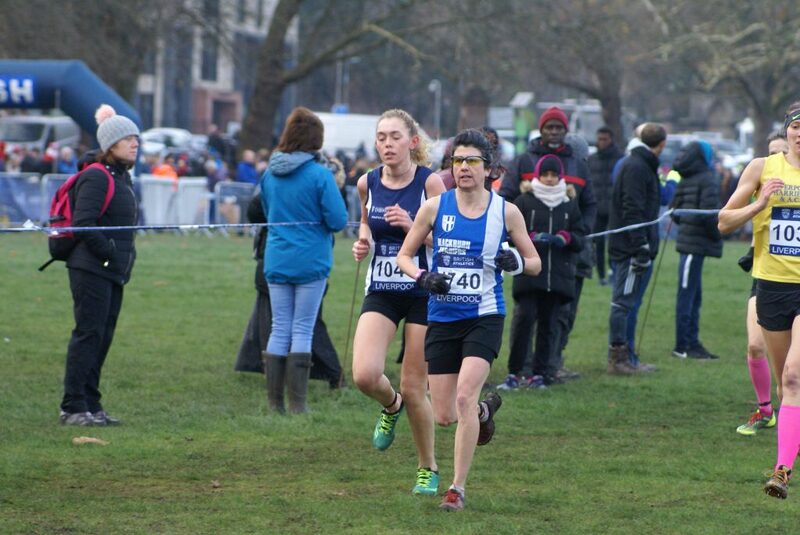 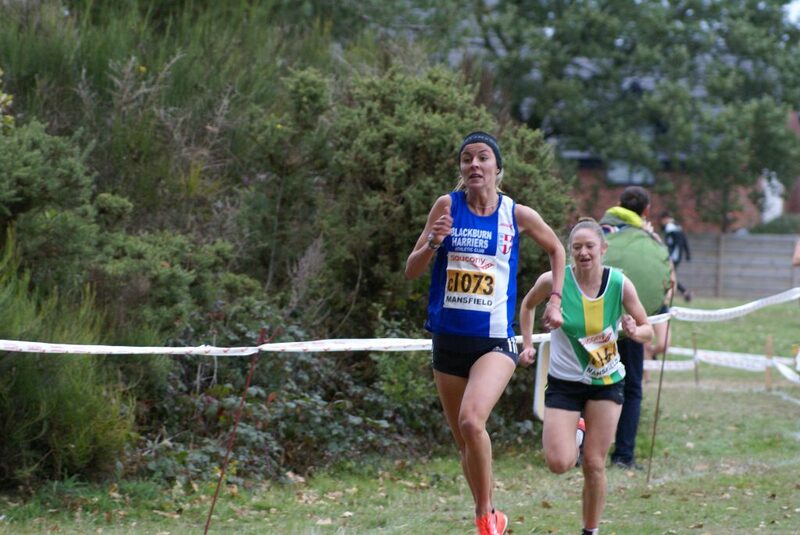 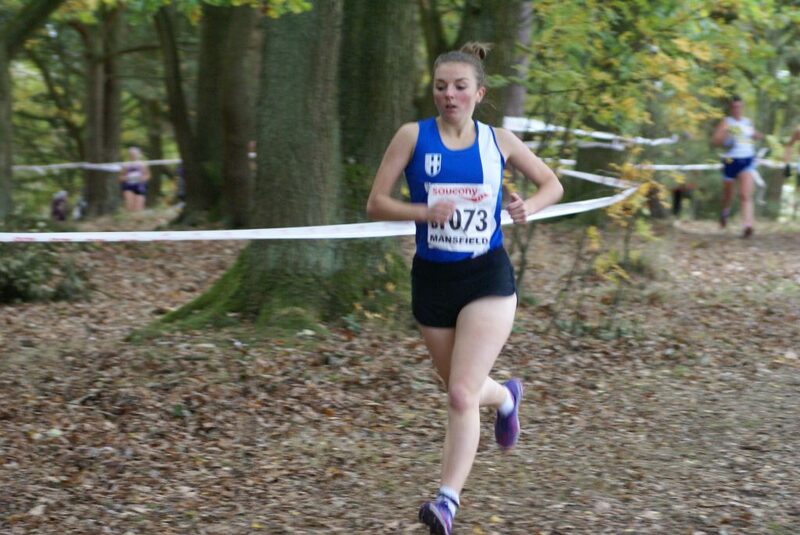 Katie led off on the first Leg – the ‘Race’ – clocking a solid time of 11.18 to come home in 55th place. 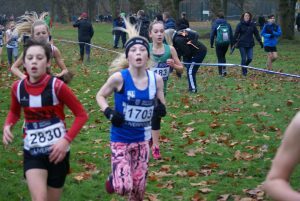 Ellen then took on Leg (2) pulling back eight places as she ran a time of 11.57 to hand over to Jess on Leg (3) in 47th position. 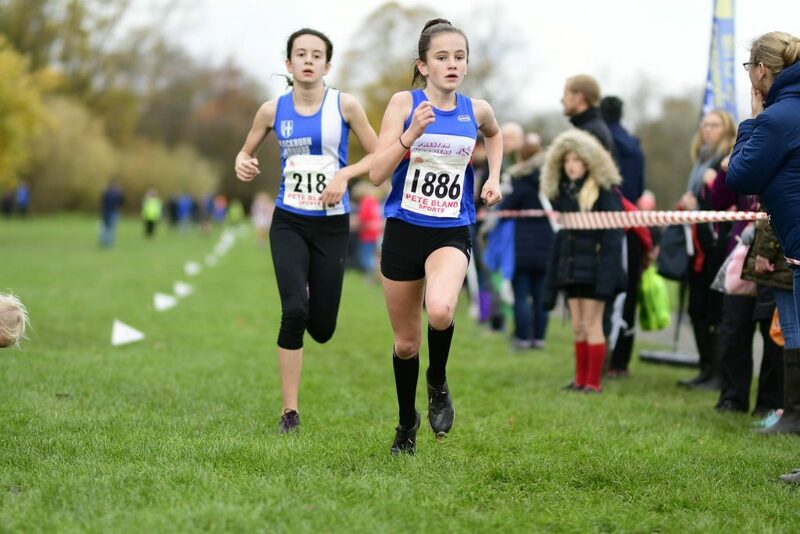 Jess absolutely ‘flew’ on the final Leg as she ran the second fastest Leg of the day in 9.23 and picked off another twenty two places to bring the team home in 22nd position overall out of a field of one hundred and sixteen full teams. 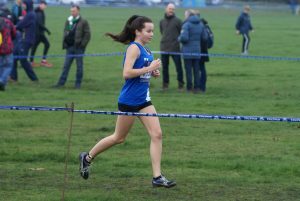 Lindsay ran the first Leg for the ‘B’ incomplete Team and had a good run to finish three minutes faster than she clocked for the same race last year (13.21). 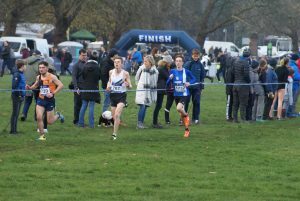 In the Men’s Senior Race – featuring one hundred and fifty three complete teams – the Harriers were one short of completing two teams. 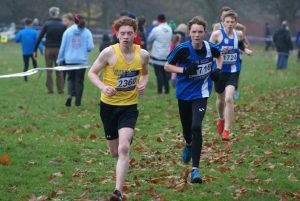 The ‘A’ Team consisted of Tim Raynes, Jack Hindle, Chris Davies and Ben Fish whilst the ‘B’ had Dominic Walton, John Chaplin and Paul Guinan. 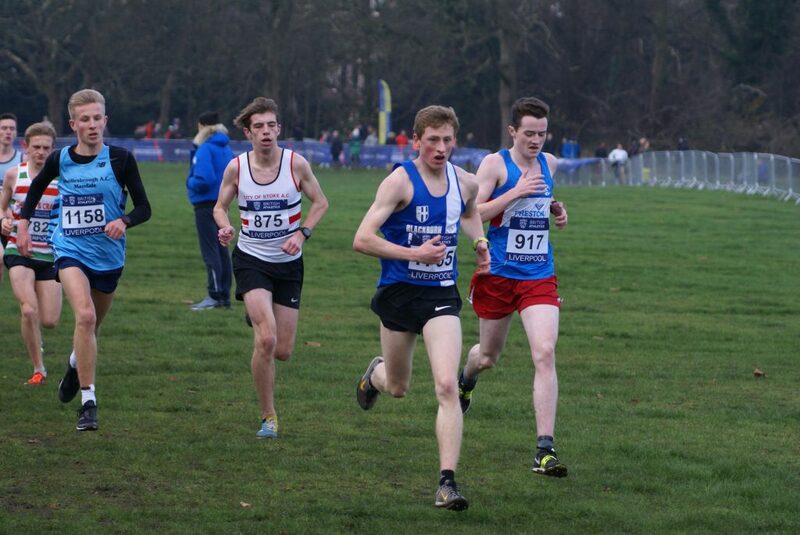 Tim led off for the ‘A’ Team clocking a very good time of 16.08 on the first Leg to come in home in 42nd place. 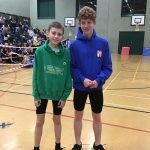 Jack was on Leg (2) and held that place as he ran a time of 16.52 handing over to Chris on Leg (3). 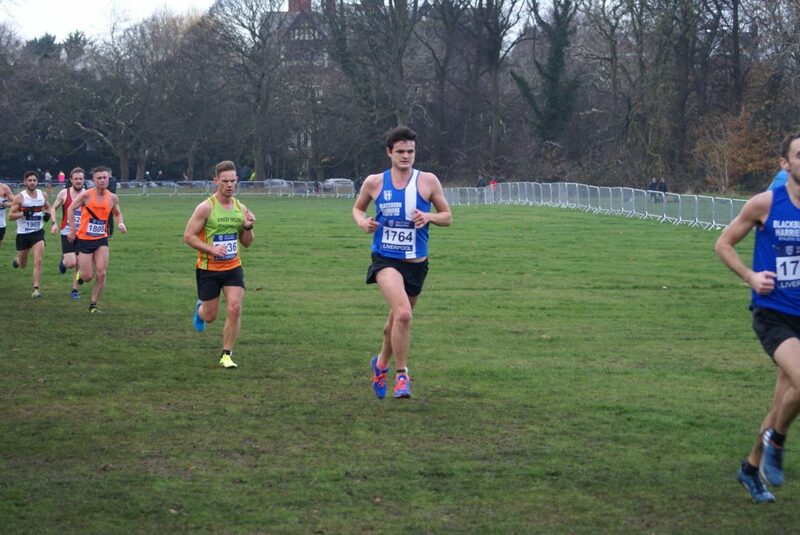 Chris ran a time of 17.25 to come home in 43rd spot as he in turn, handed over to Ben on the final Leg. 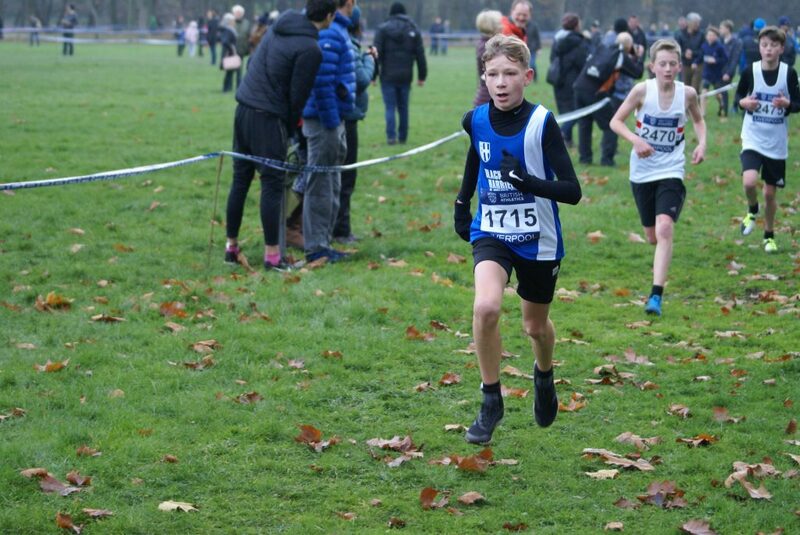 Ben ran the fastest time of the team (16.04) to win back ten places and in the process ensuring that the Harriers were the first Lancashire Team on the day. 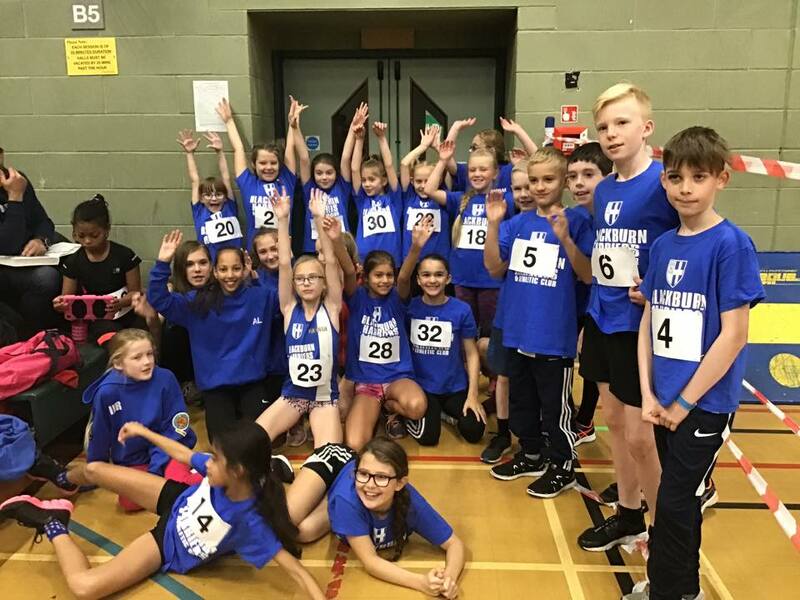 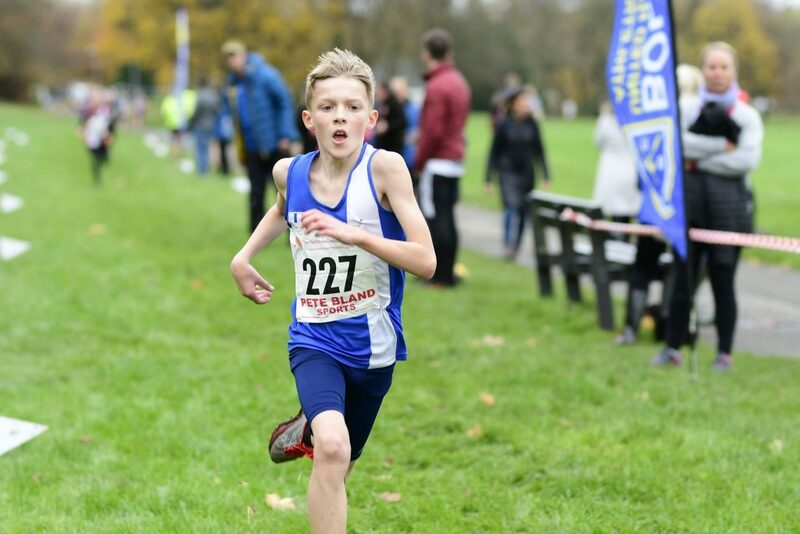 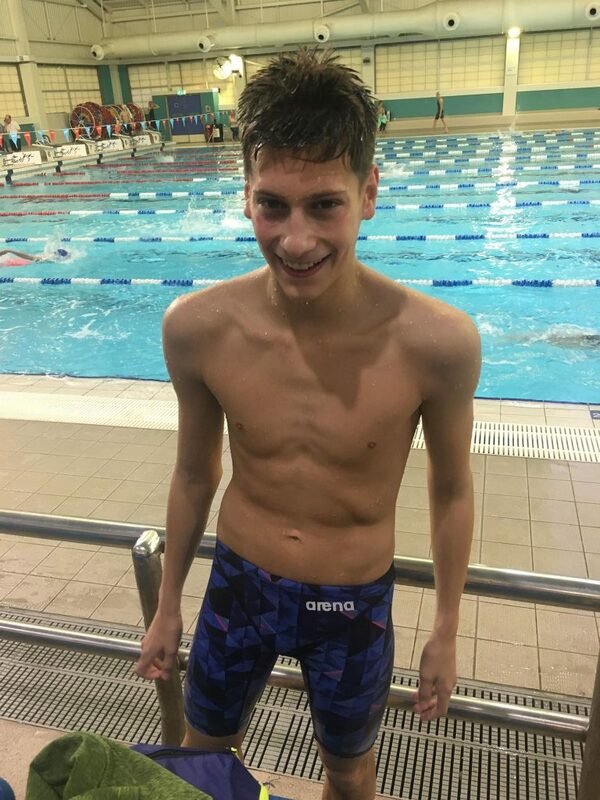 Dominic – an 800m speclialist – was running his first race for the Harriers as part of the ‘B’ Team which was incomplete and ran a very solid time of 16.56 on Leg (1). 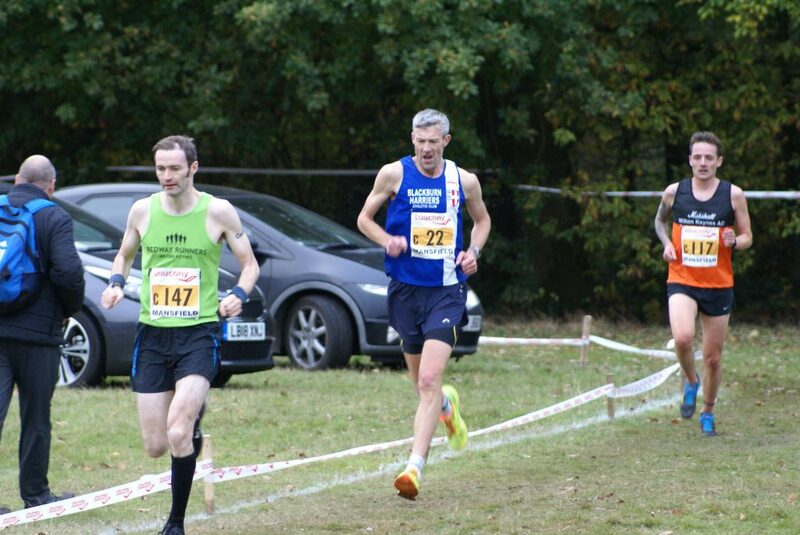 John (V65) ran Leg (2) in a time of 21.19 before Paul clocked 18.38 on Leg (3). 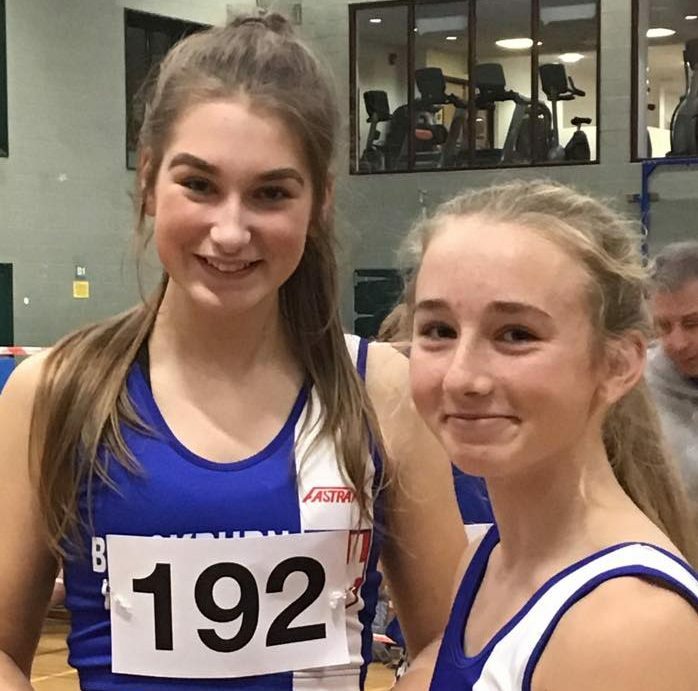 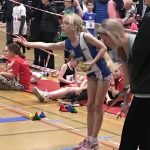 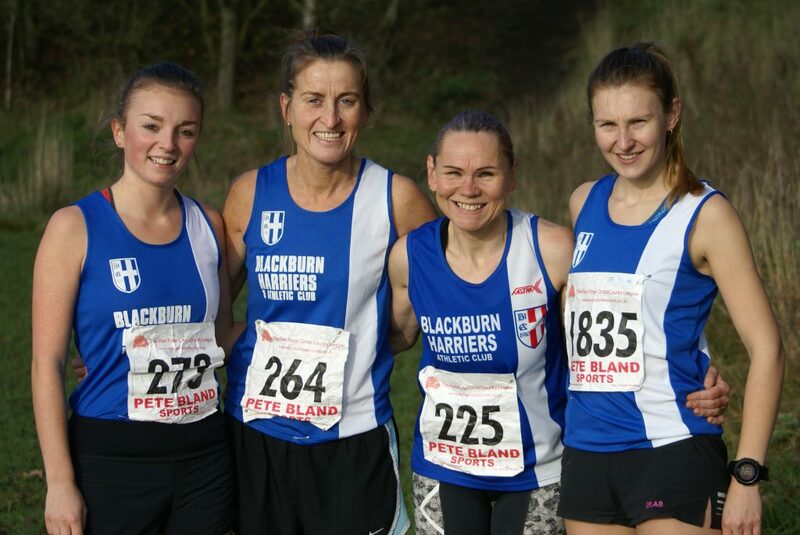 Three Blackburn Harriers entered this race with a view to breaking their previous best times over 10k – and they all did just that. 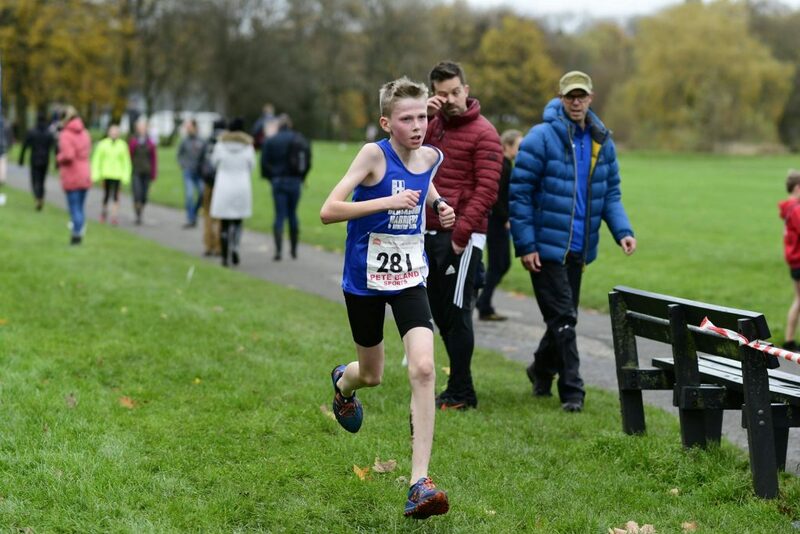 What a great day for Ben Costello at the Abbey Dash which saw him smash his 10k personal best by over three quarters of a minute which is a massive improvement. 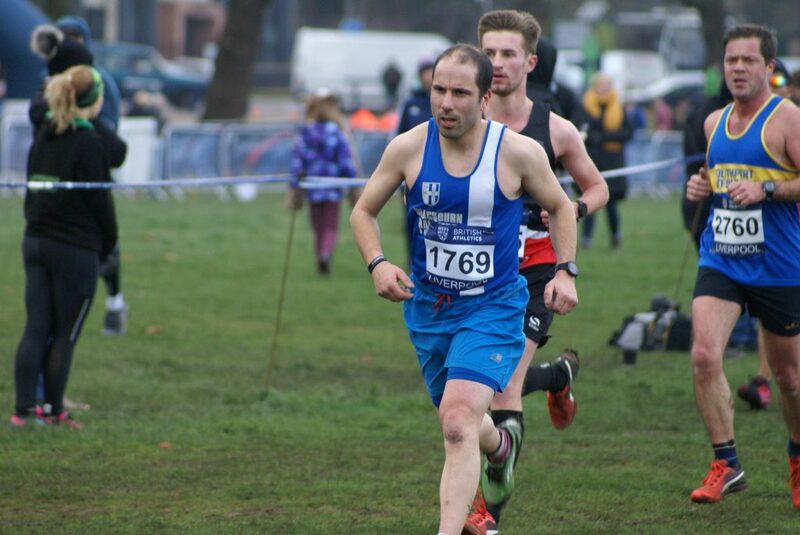 Understandably elated with his performance, Ben spoke to the Harriers after the Race telling us that he was “Absolutely over the moon with a PB today…7 weeks ago coming back from injury i didnt think i would get close to one.the last few weeks of training given me belief and i was hitting times in training ive never hit before.the conditions for the race was as good as they could be really.the target time was 32.50 i set off at that pace but i felt i could push in the middle of the race and i did.i went through 5 mile in under 26 mins so i knew i was on for a PB.The target at start of year was to break 33 min and i managed it in my last 10k of the year.would like to say massive thanks to all the coaches down at blackburn and everyone of the athletes that have been clipping away at my heels over the past few weeks that have pushed me to my limits and beyond”. 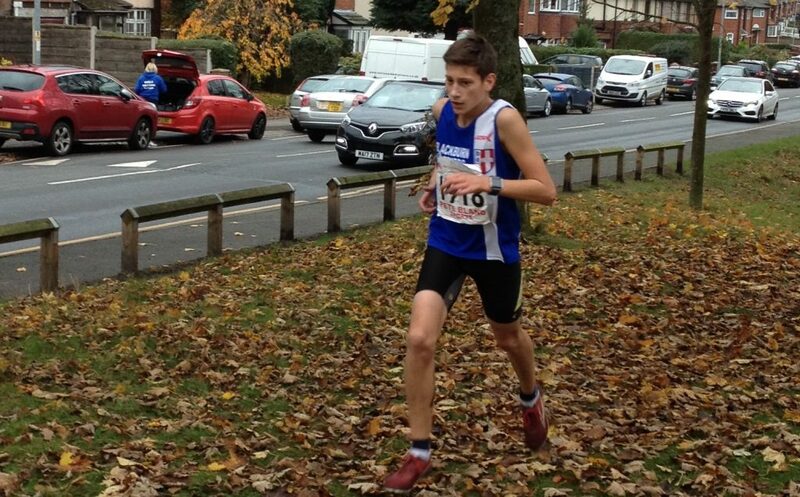 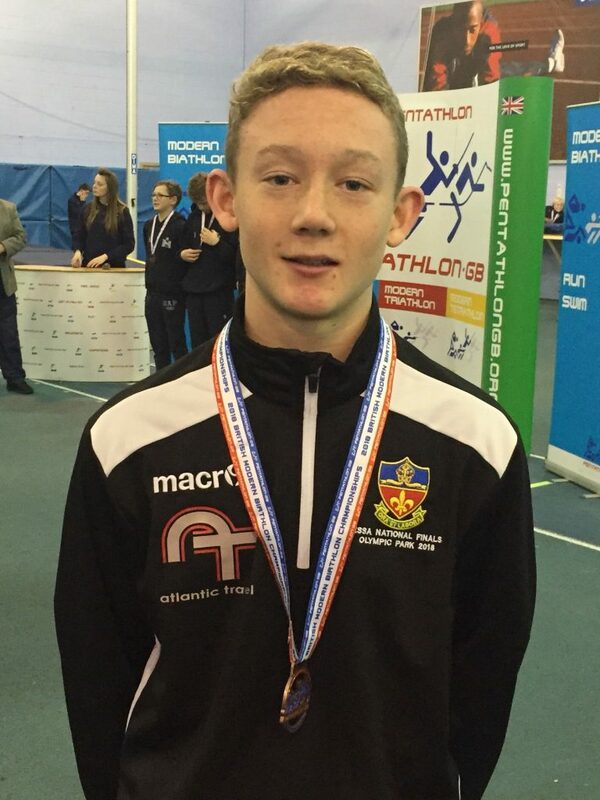 Next up for a new PB by six seconds came Jacob Watson who told us that it “feels good to be running back at my best”. 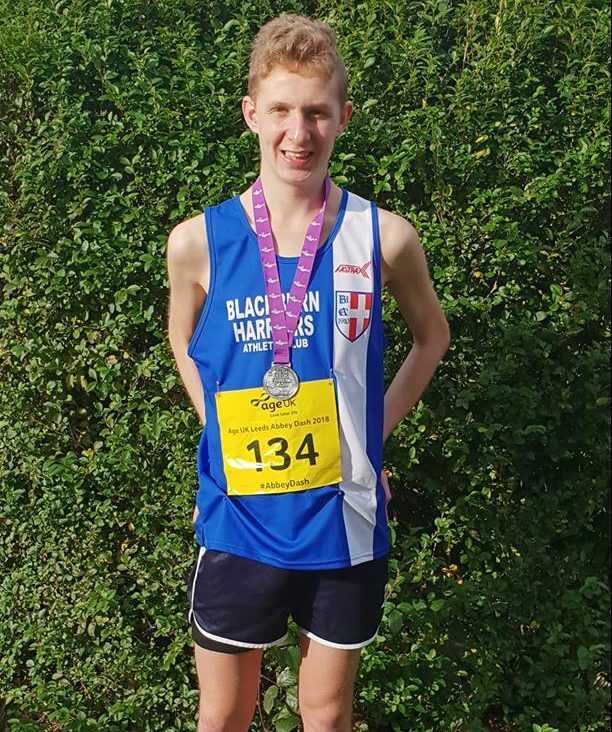 Having run times of of 33.37 at Wigan and 33.59 at the Burnley Fire 10k in September, it was clear that Jacob was ready to revise his personal best and he did just that in the Abbery Dash to clock 33.08 and a whisker away from breaking into the 32 minute mark. 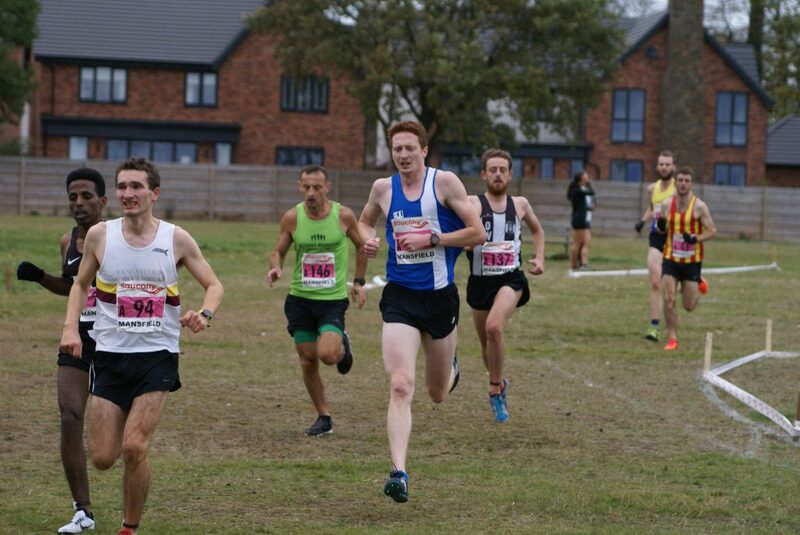 A happy Calum James ran a nine second new PB as he clocked 35.10 in the Race and told the Harriers afterwards that “Fair happy to beat my 10k pb by 9 seconds at Leeds Abbey Dash with a time of 35.10, dissapointed not to get a better time as a clocked in a 16.40 5k!! 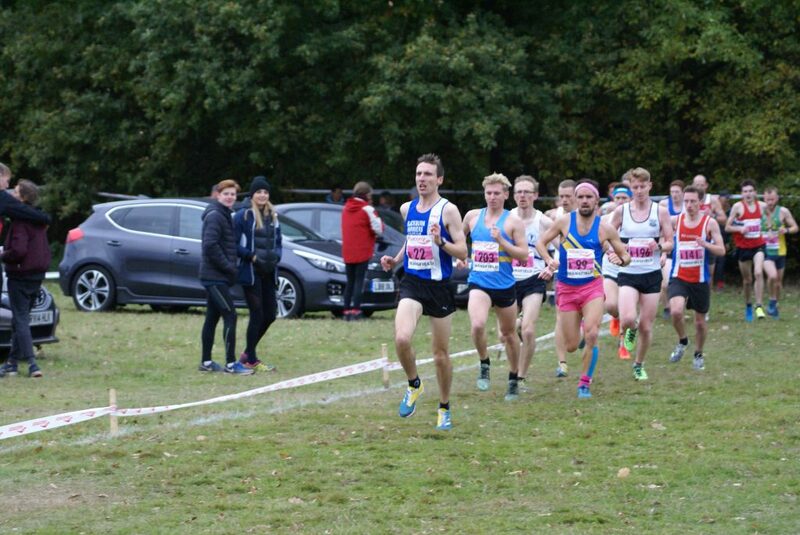 But struggling massively in the last 4k think I’ve learned a lesson not to travel all the way to London and back in the same day the day before a race, but in all fairness really happy to get a Personal Best for 10K, I’ll also like to congratulate my friends Mark,Ryan,Ben,Jacob, Matt and Jon for their outstanding efforts today and also achieving their pbs too. 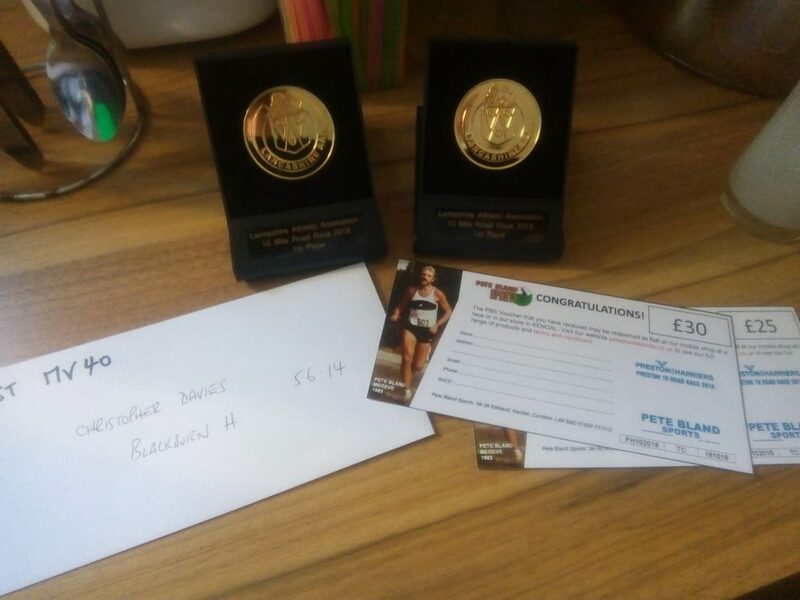 I think everyone I’m currently working with my coach Phil and most importantly the group at Blackburn Harriers are bringing me on massively, Ive only been running since June 2017 and to go from 39 minute 10ks to 34/35s is a massive achievement in a short space of time, I’m very glad and greatful to be running with Blackburn and my next focus is cross country which is every week from now till mid December starting at Bolton this Saturday and also aiming for a pb at Ribble Valley 10k”. 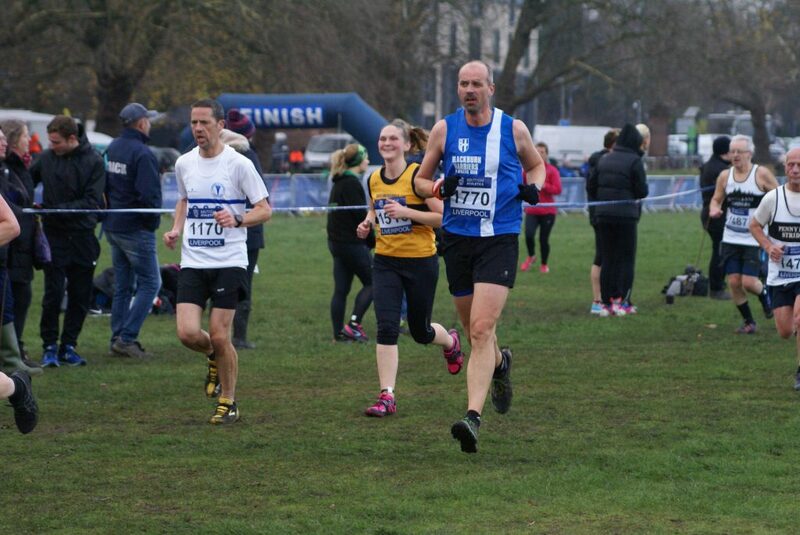 Paul Bradshaw was one of seven hundred and twenty eight runners who completed this Race organised by Run Through. 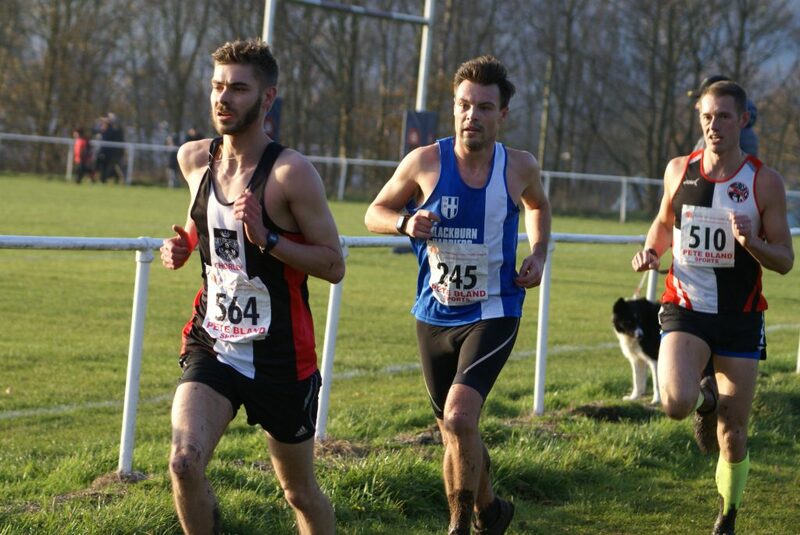 Nick Samuels ran out as the winner in a time of 32.34. 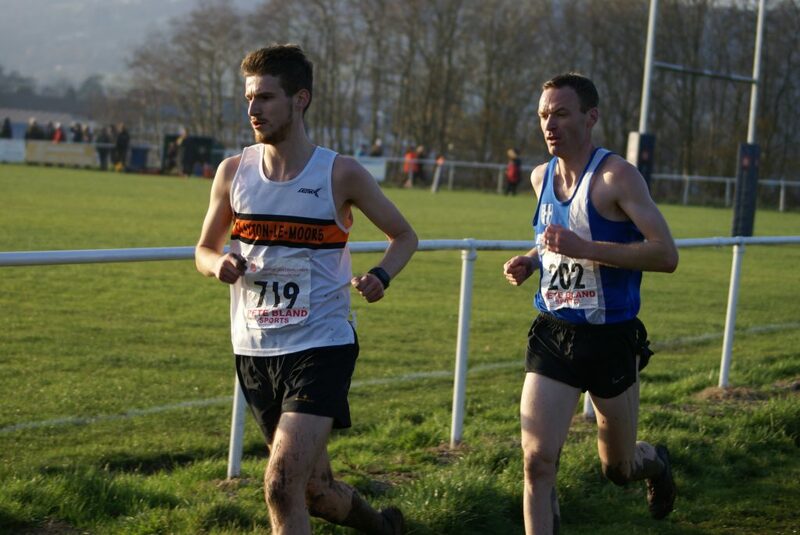 Paul bagged a top ten place for himself (10th) clocking 36.22. 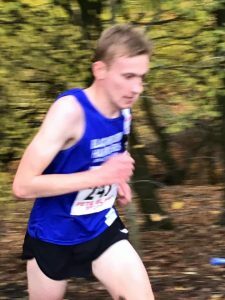 Blackburn Harrier – Ryan Walmsley – has undertaken a massive feat of committment and endurance as he embarked on a year long campaign – starting on January 1st 2018 – to raise money for Derian House. 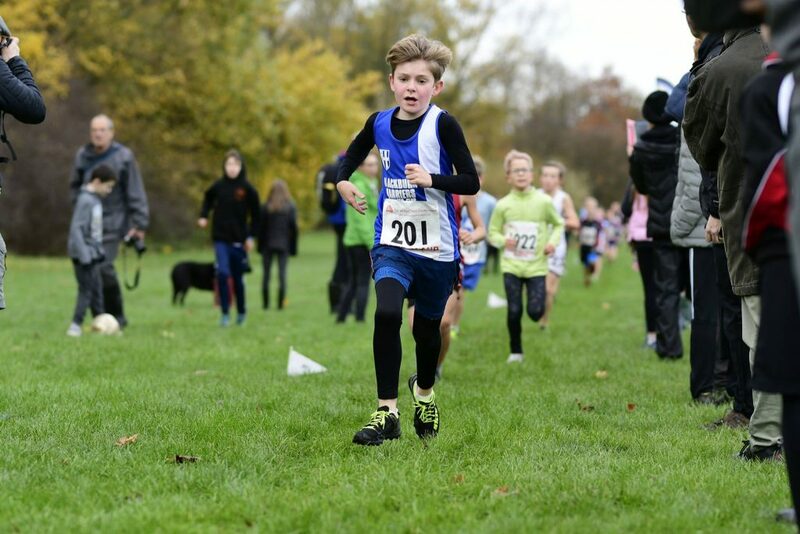 His quest to raise the maximum amount of money was to run every single day of the year!!! 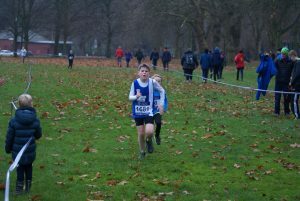 Hear we are in November and he has completed every day up until now and is determined to carry on and complete it. 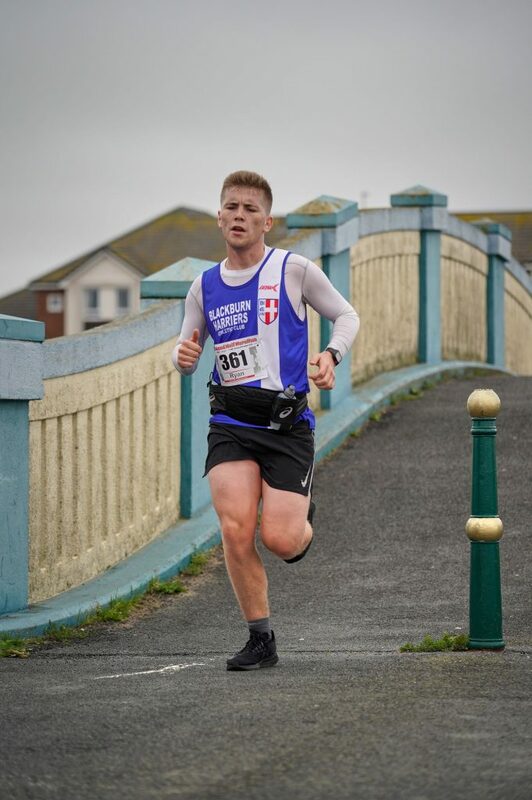 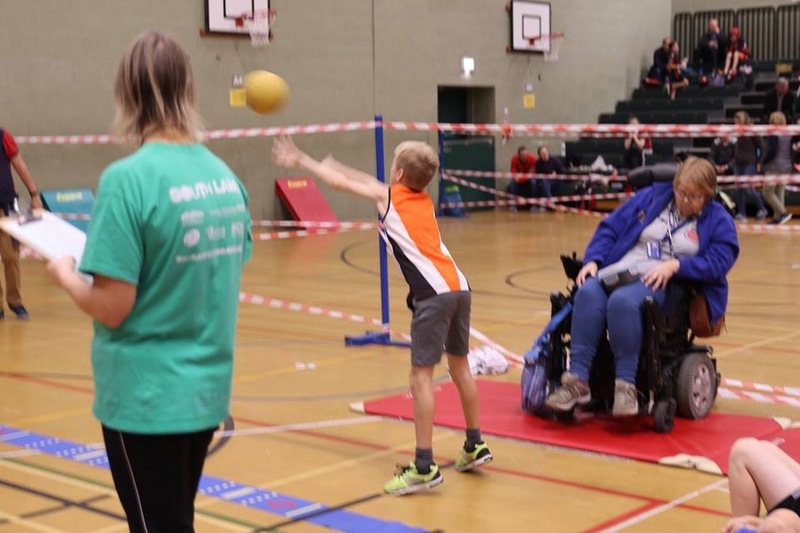 Eleven months into his challenge and Ryan has smashed his target, raising £1,346 so far, and even throwing in the odd competitive race for Team Derian.